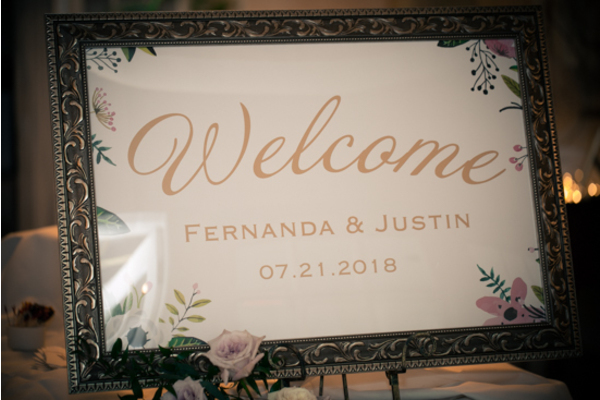 Congratulations to Fernanda and Justin on their recent marriage! 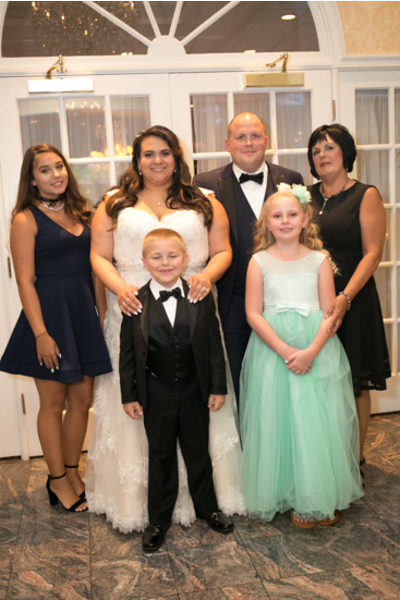 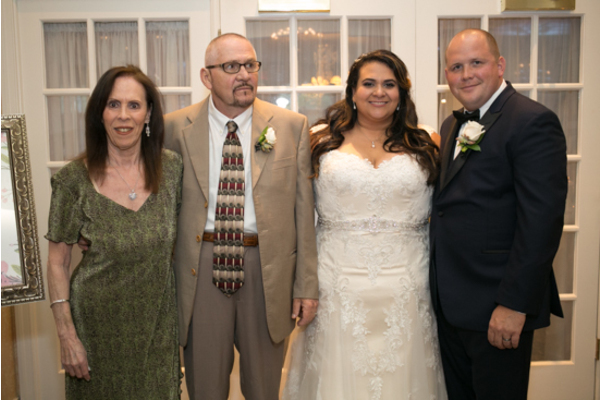 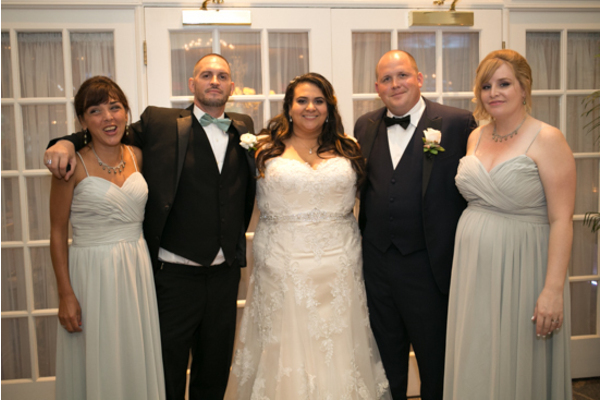 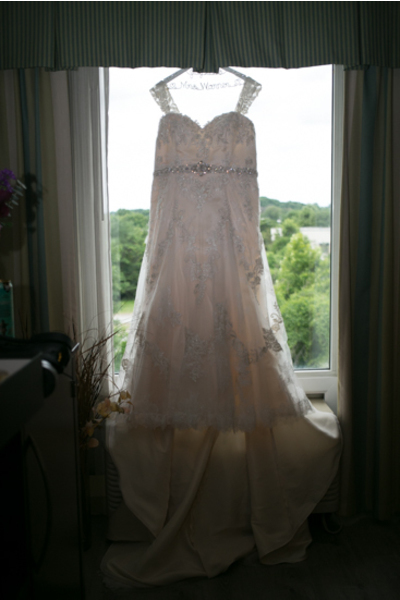 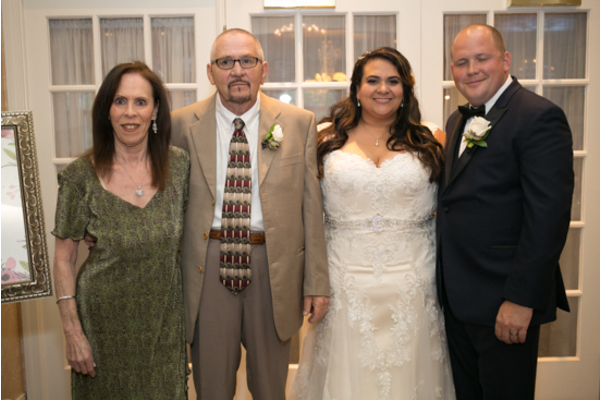 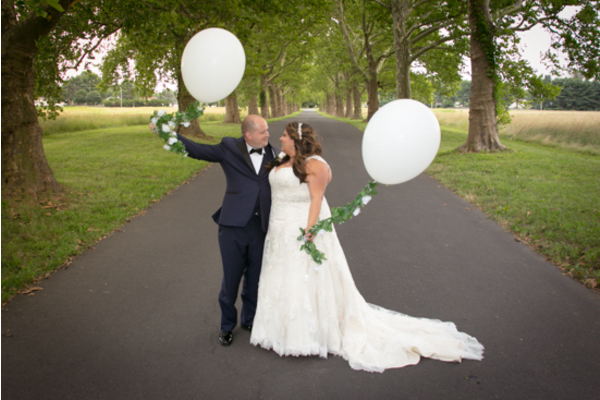 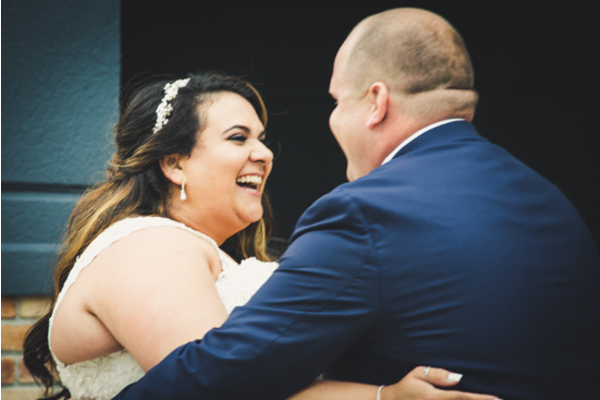 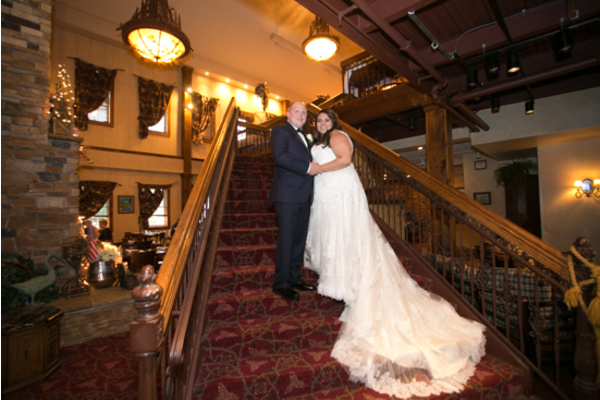 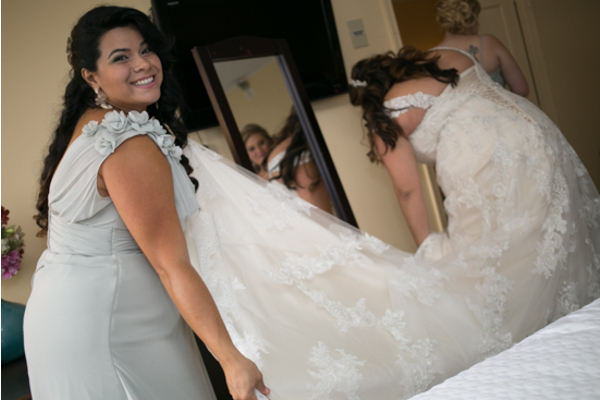 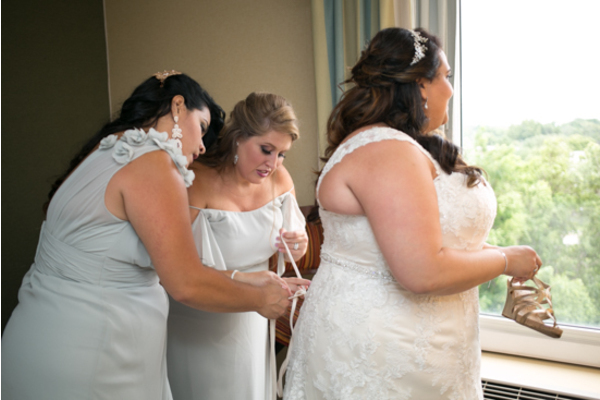 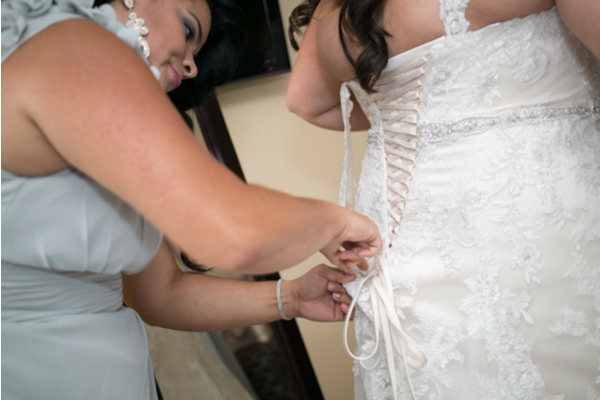 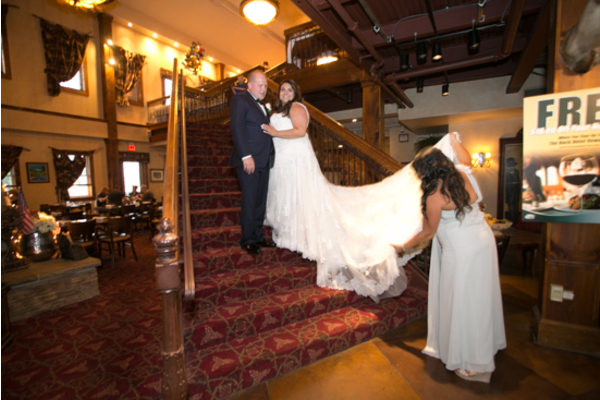 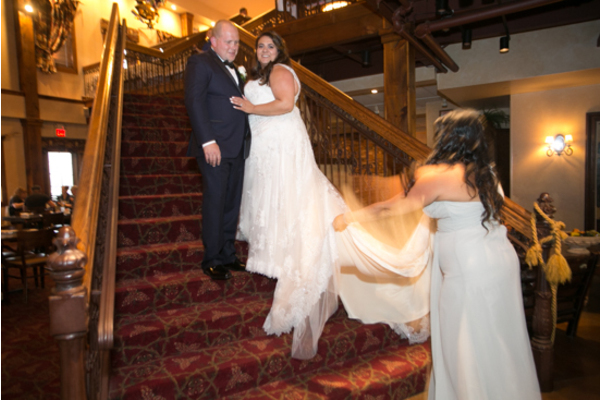 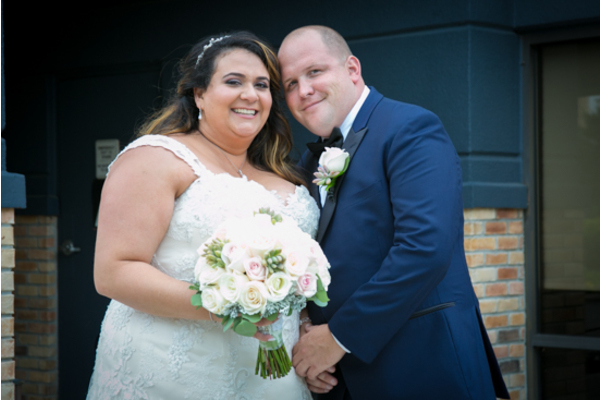 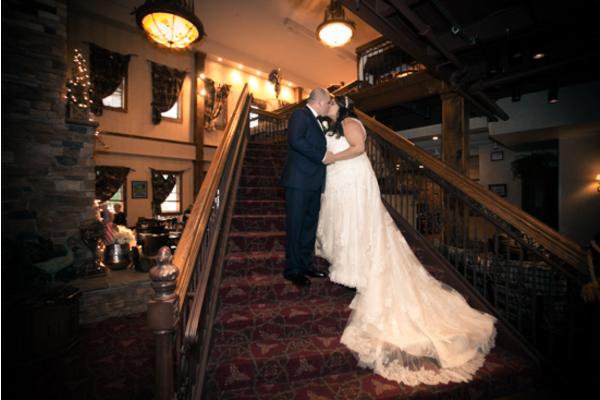 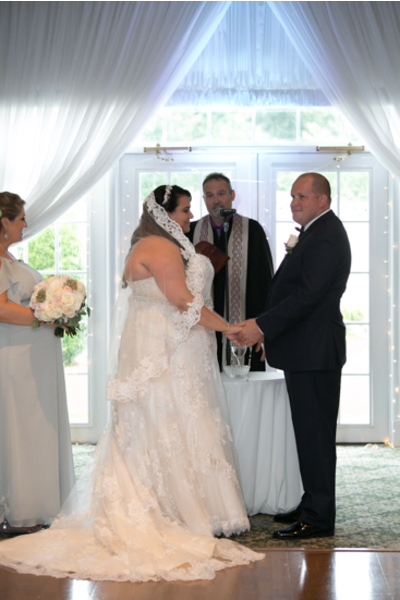 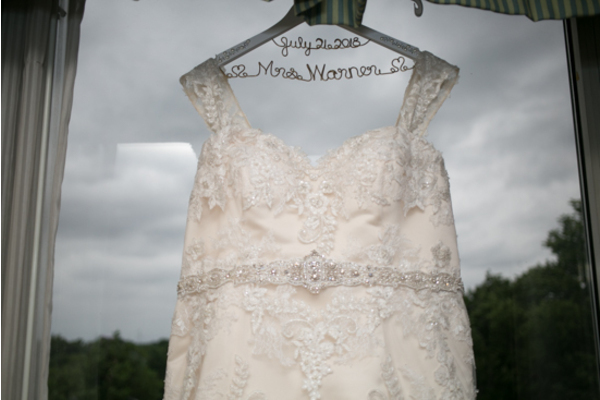 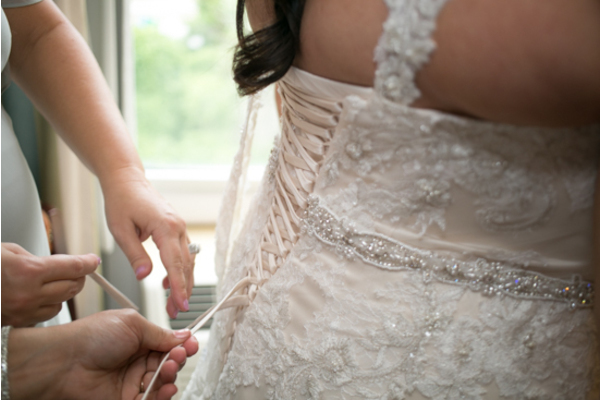 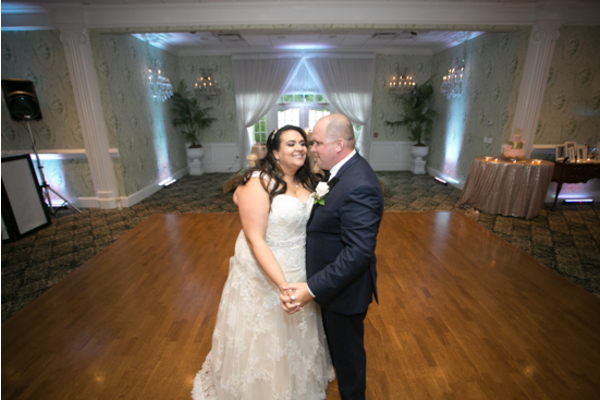 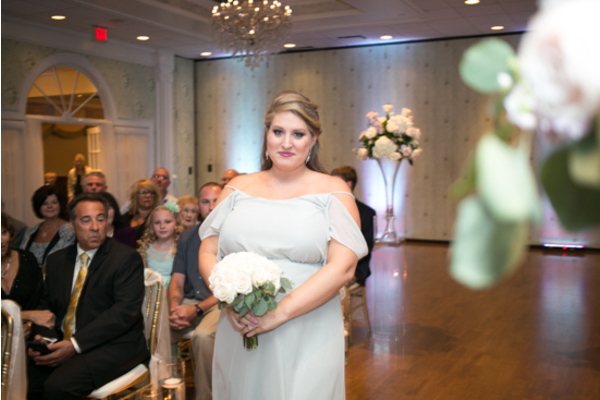 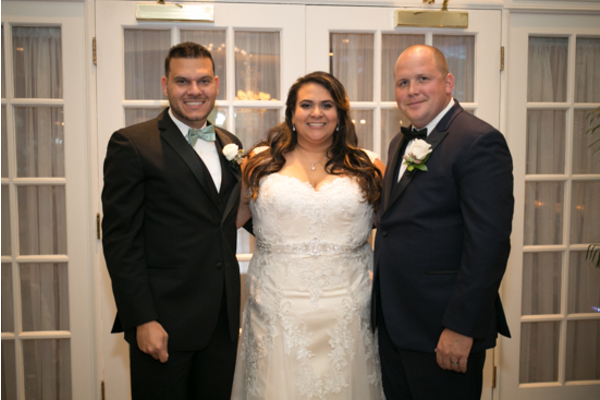 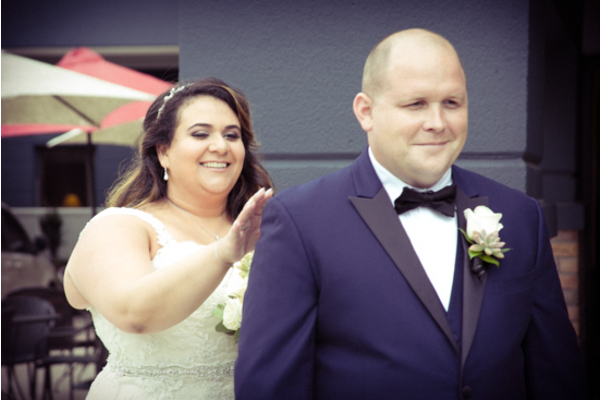 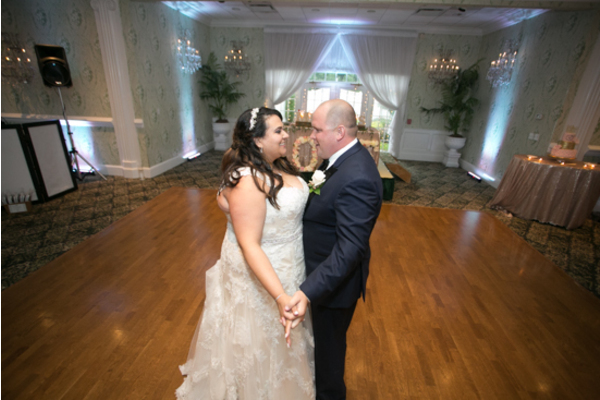 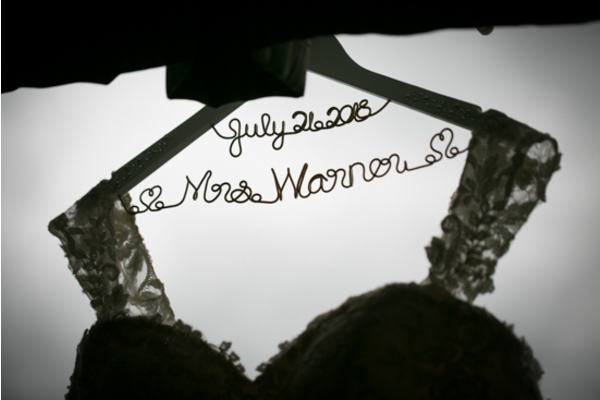 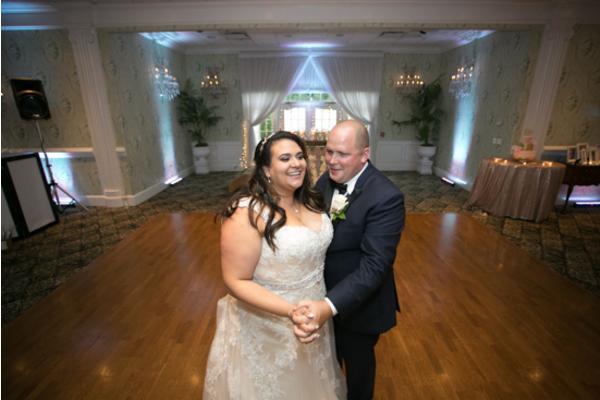 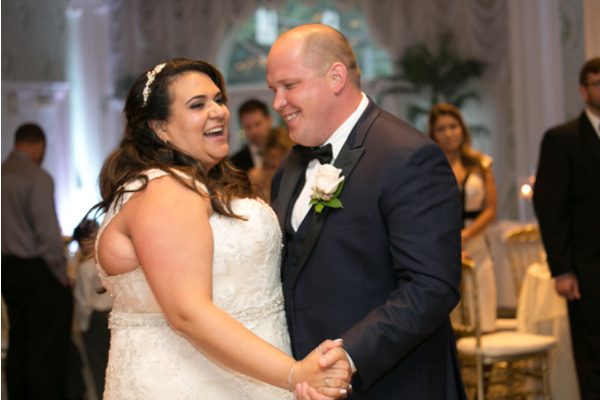 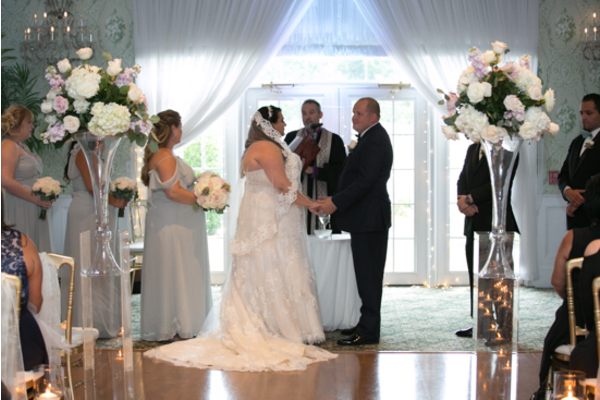 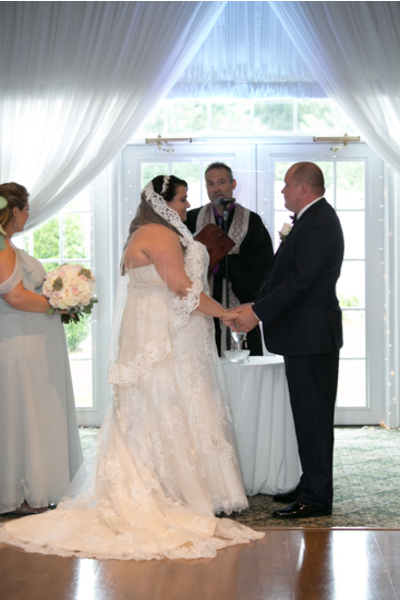 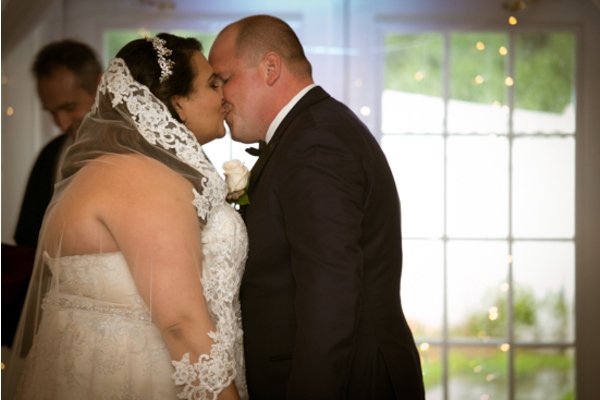 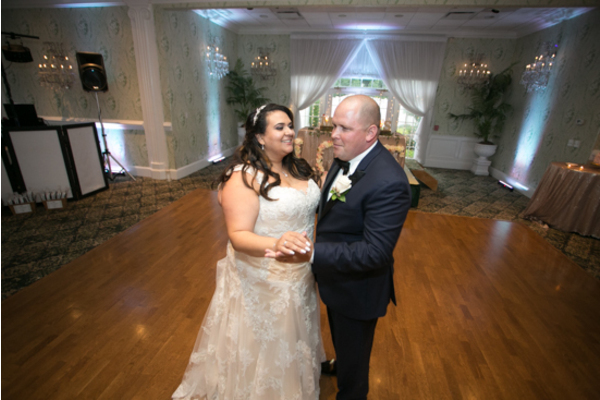 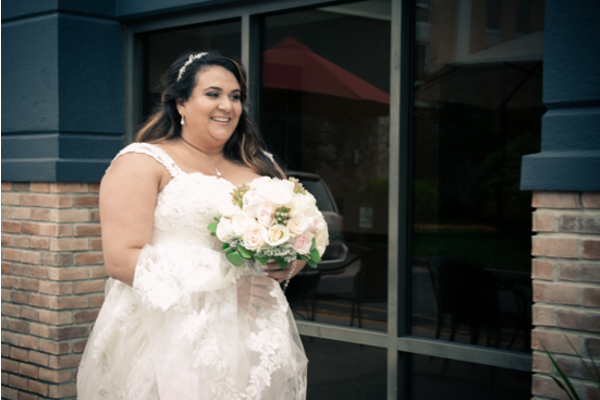 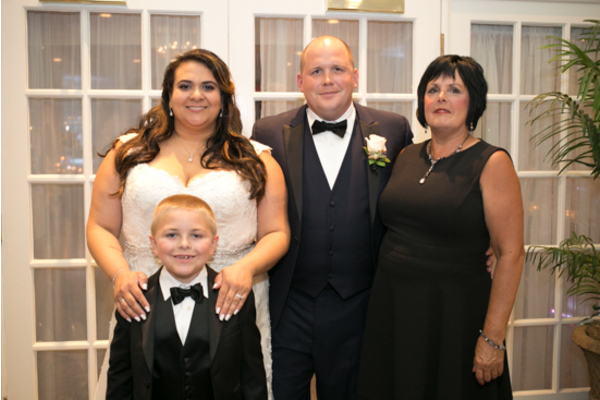 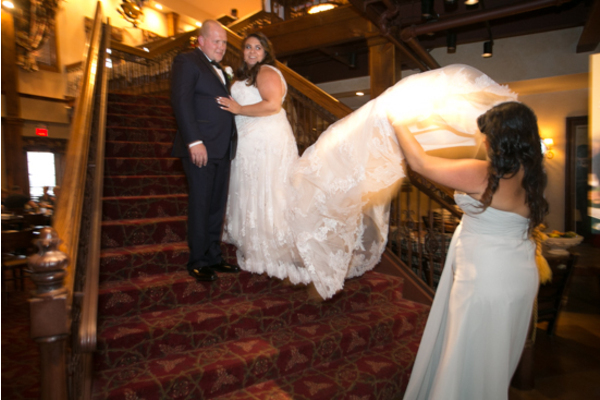 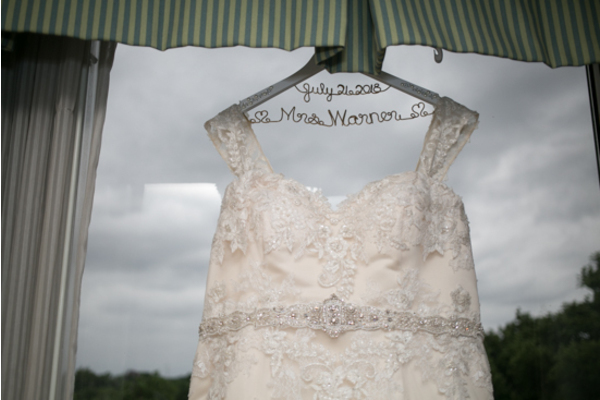 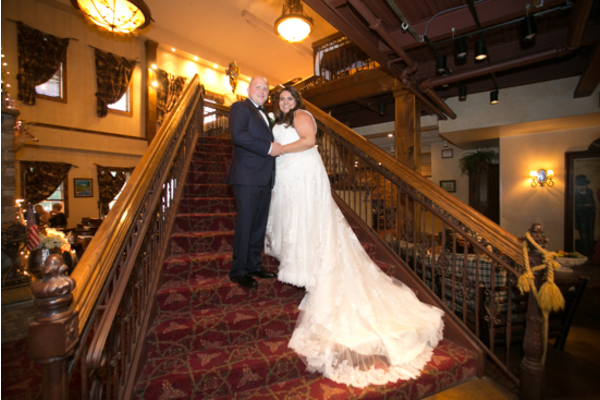 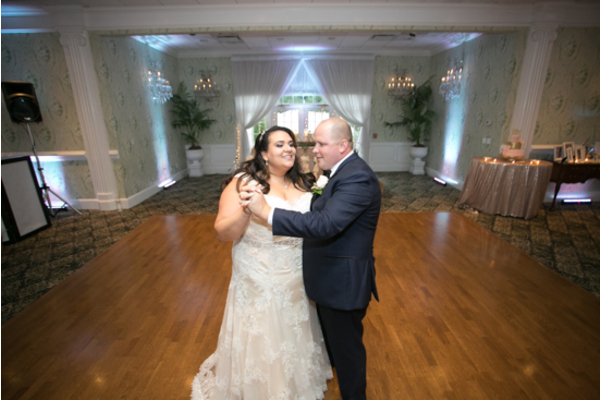 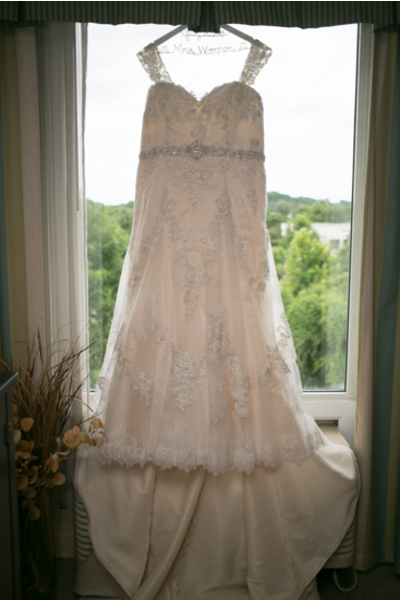 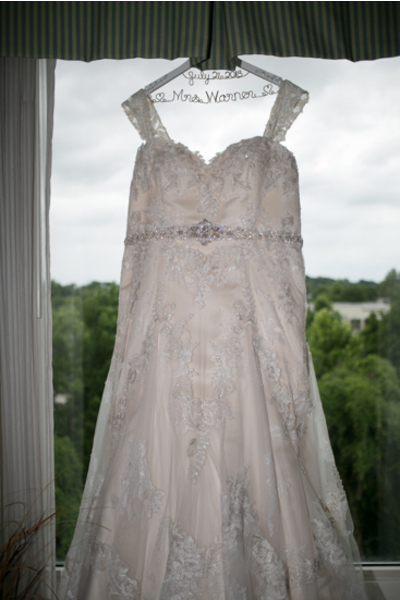 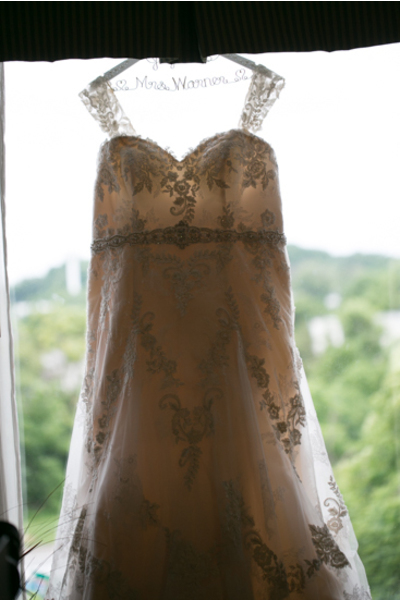 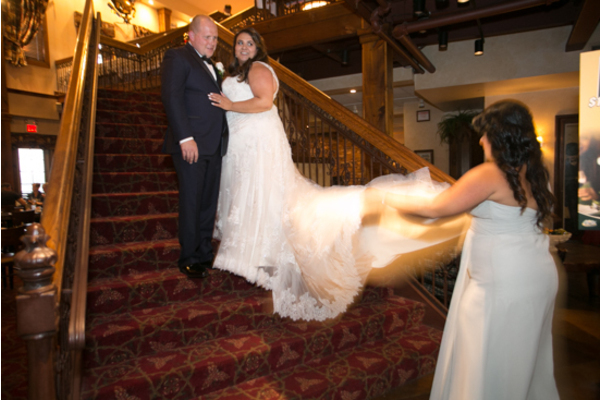 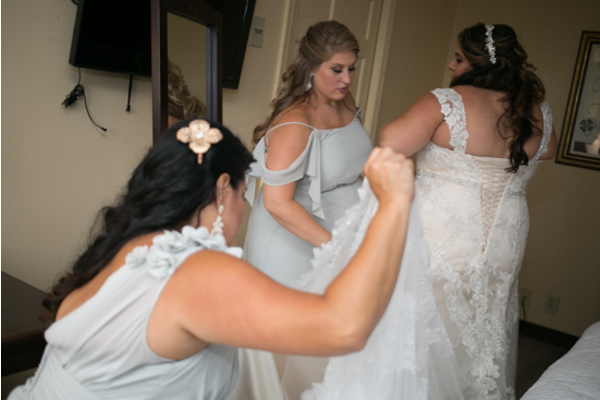 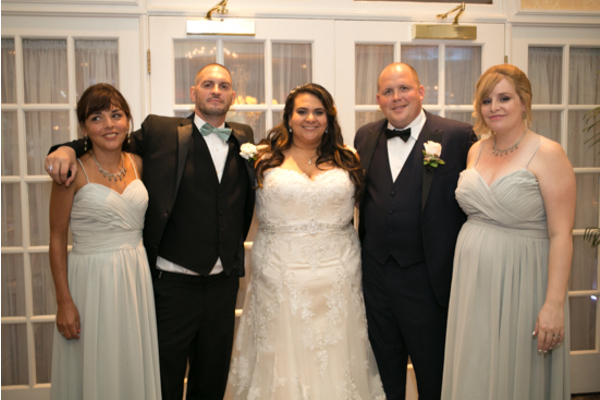 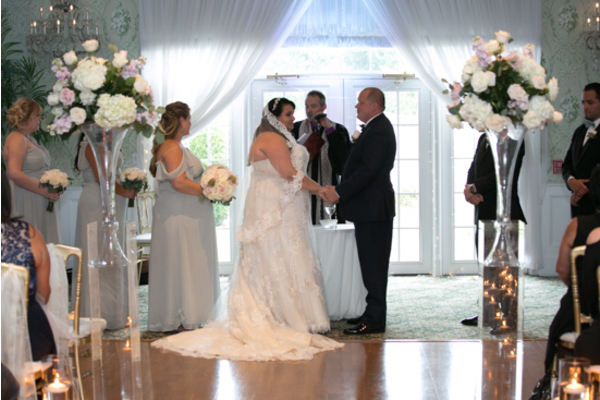 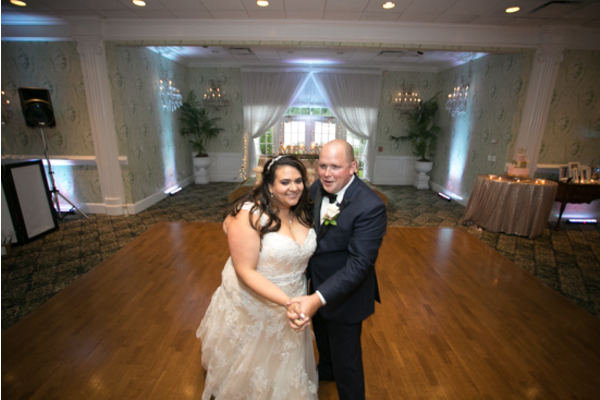 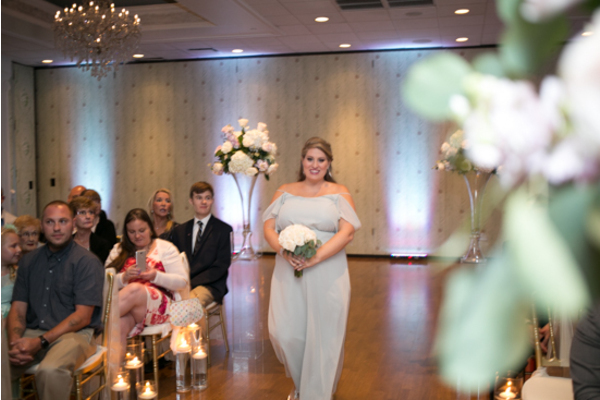 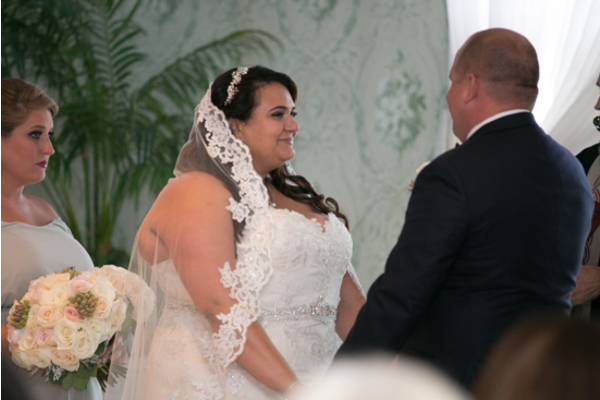 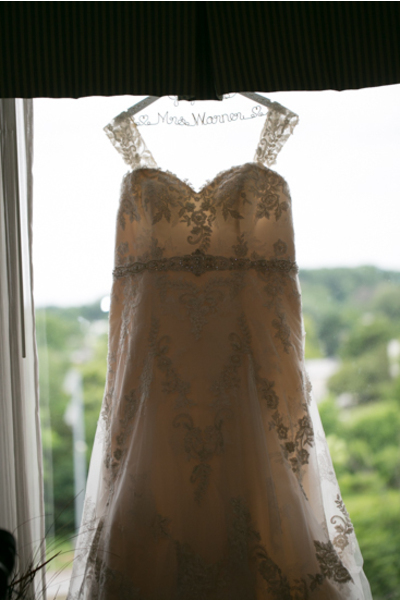 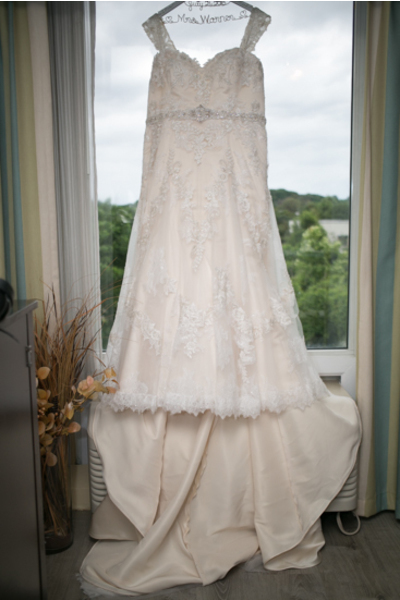 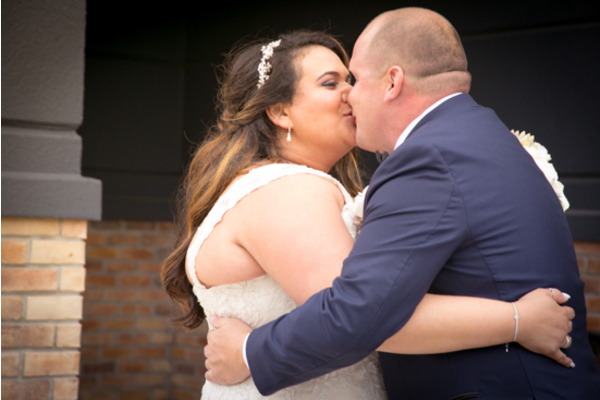 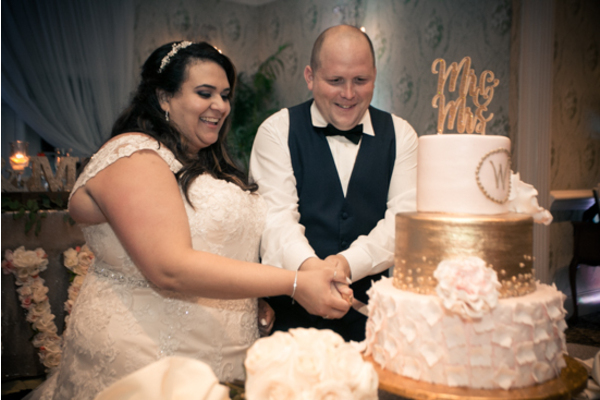 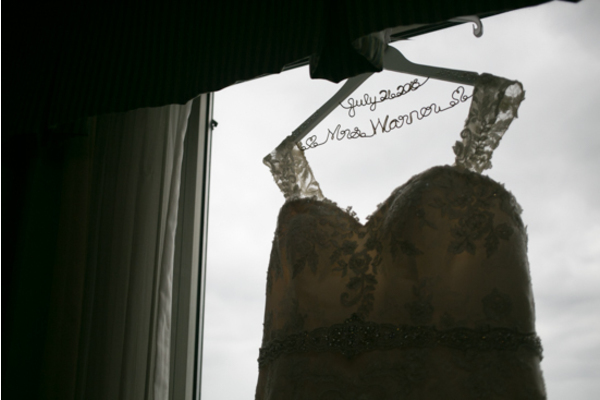 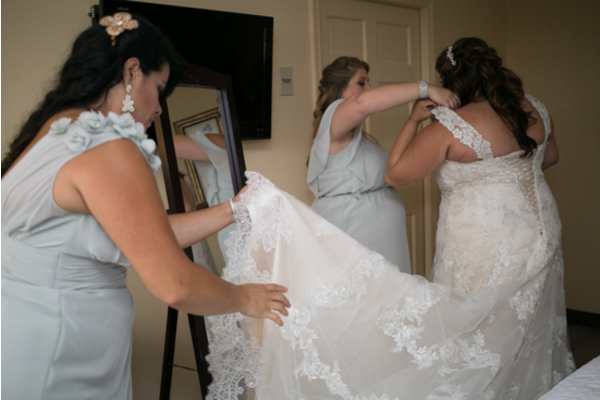 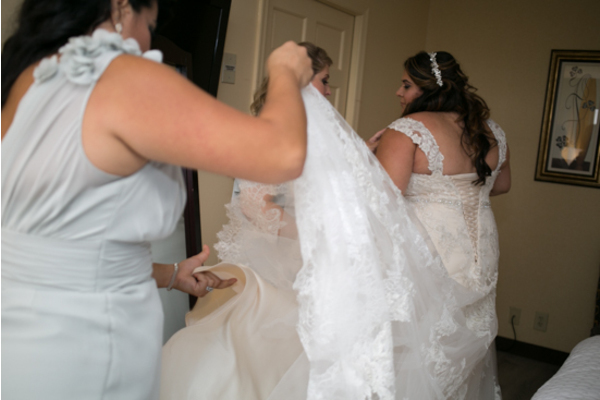 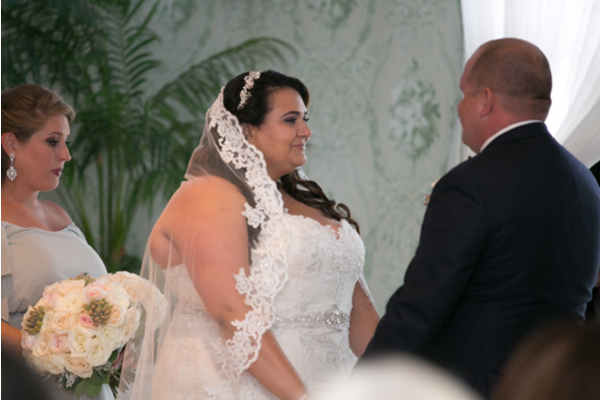 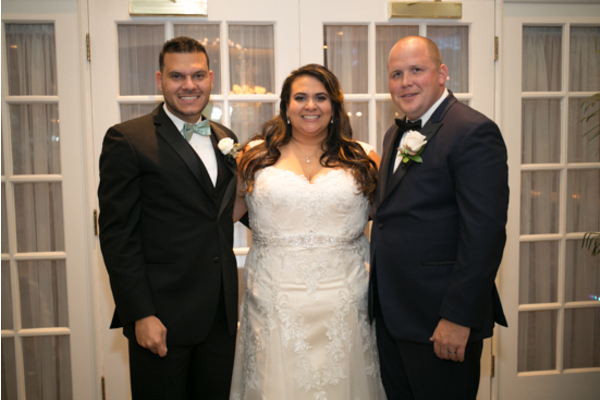 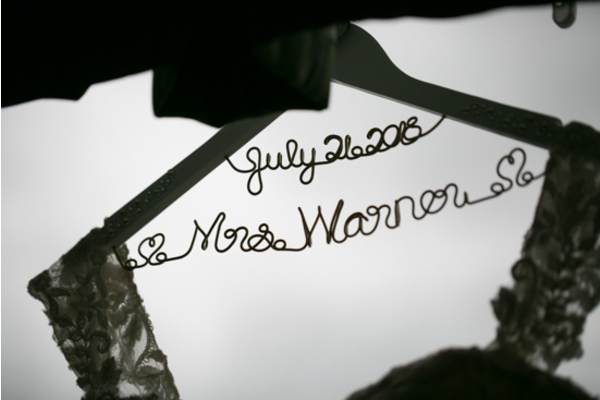 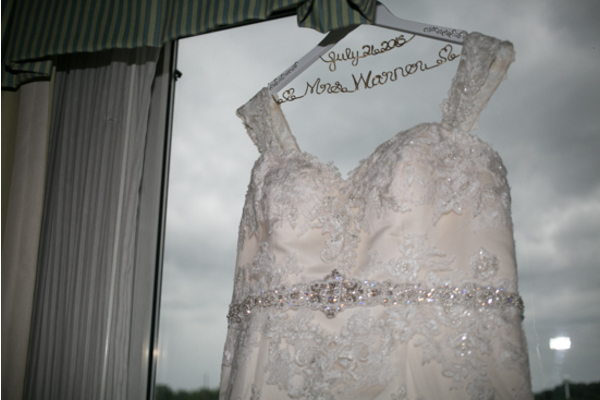 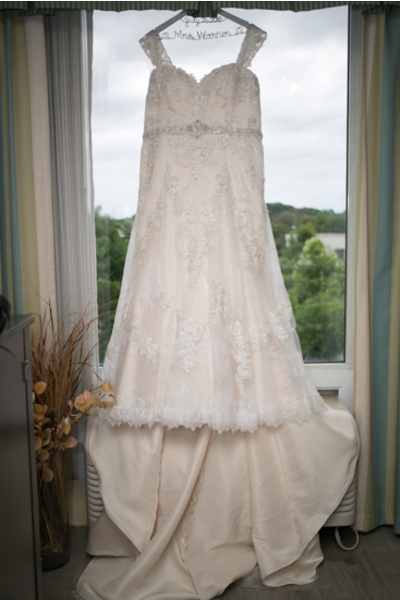 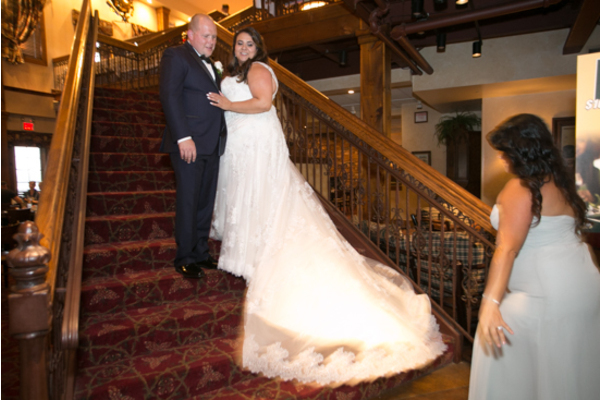 This lovely couple got hitched at The Buck Hotel inFeasterville-Trevose, located in PA.
Fernanda’s dress hung in front of the window on a hanger that read “Mrs.” She stood back and admired the dress one last time before slipping into it. 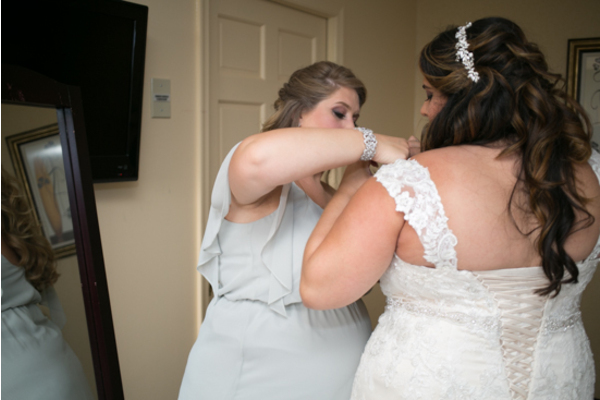 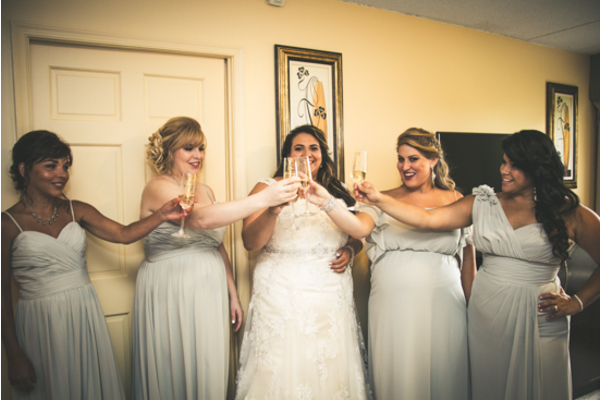 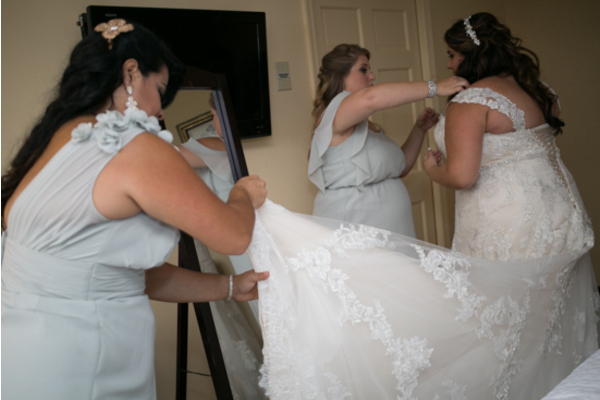 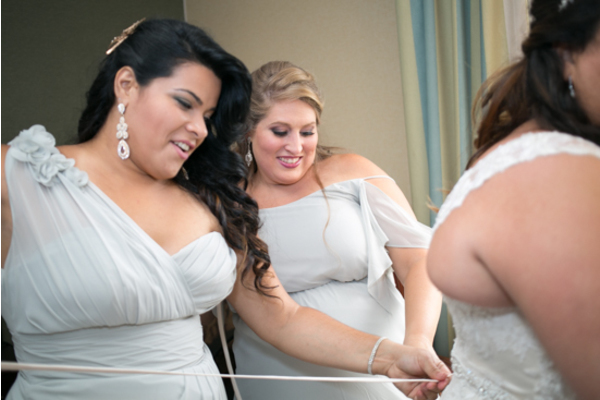 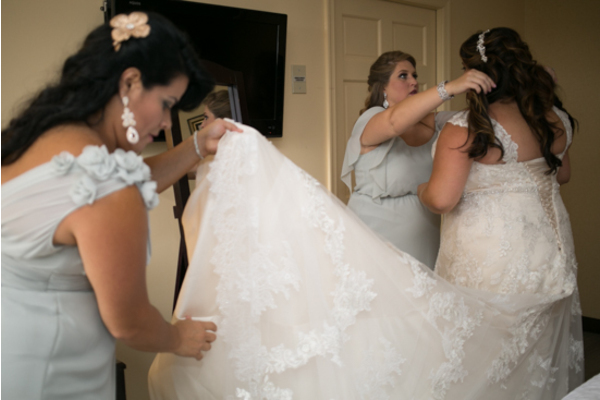 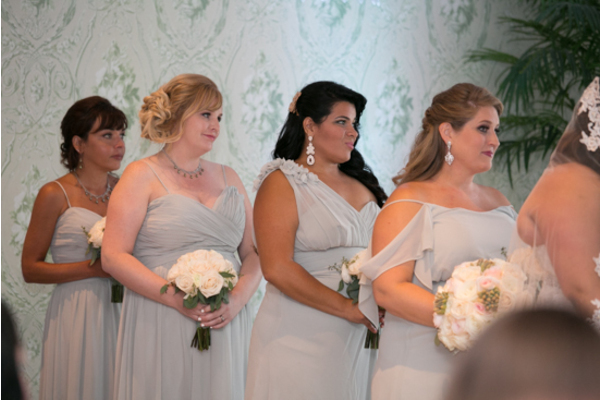 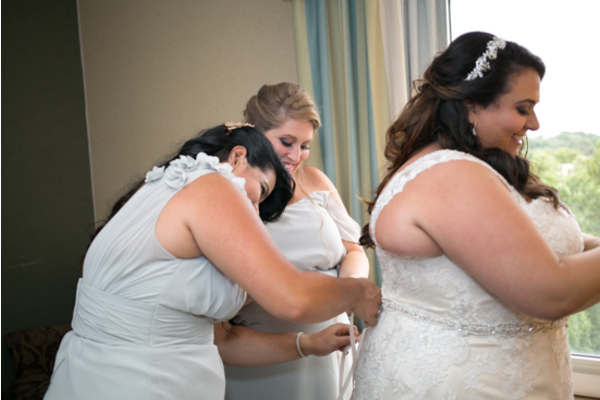 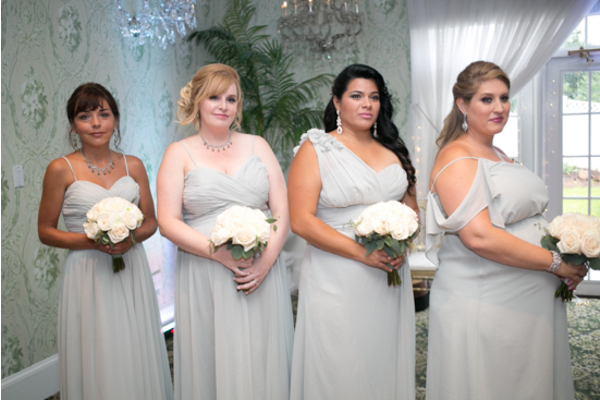 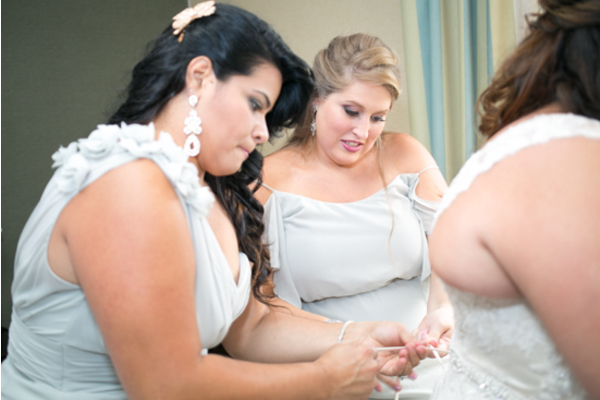 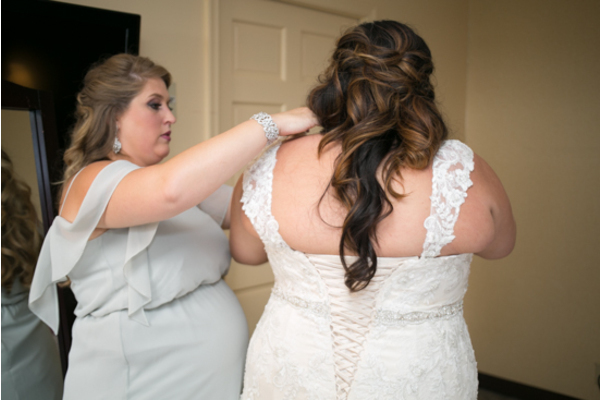 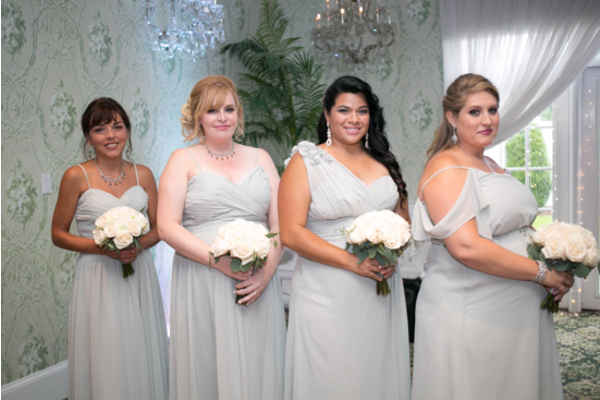 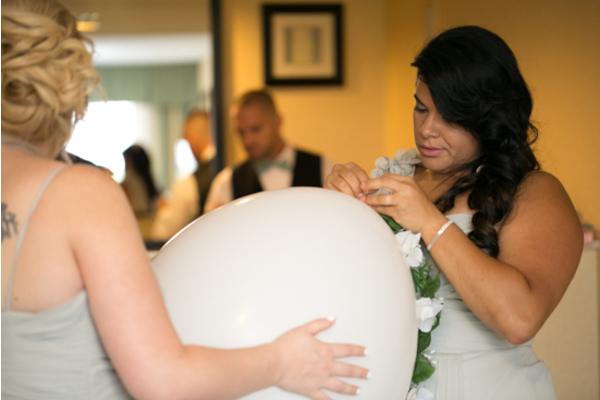 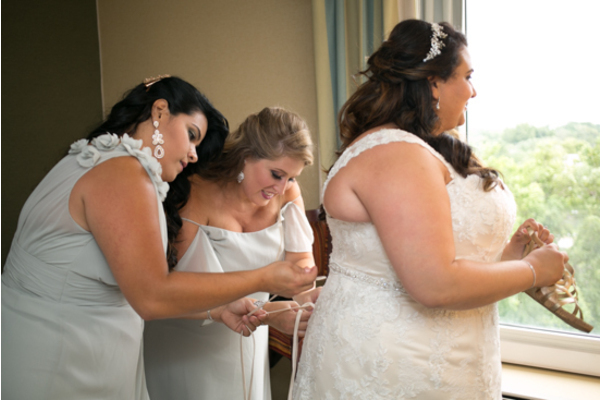 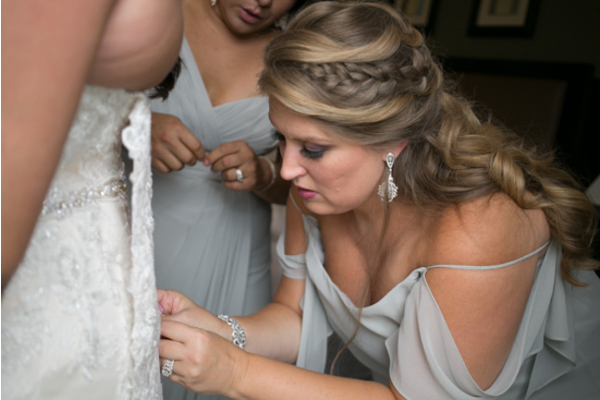 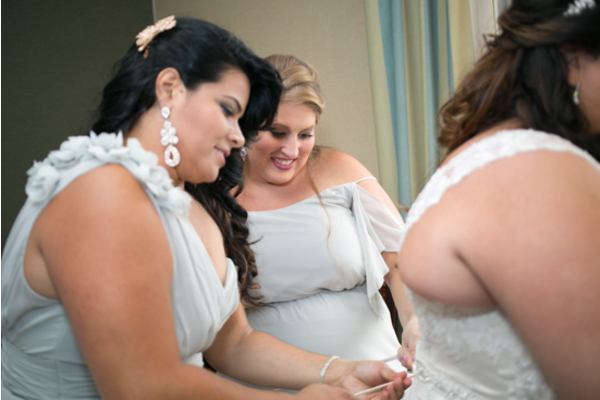 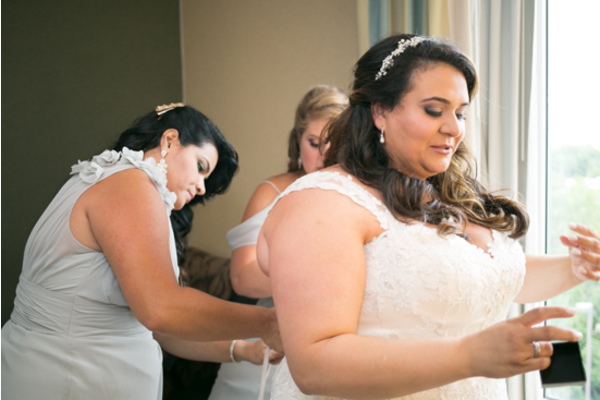 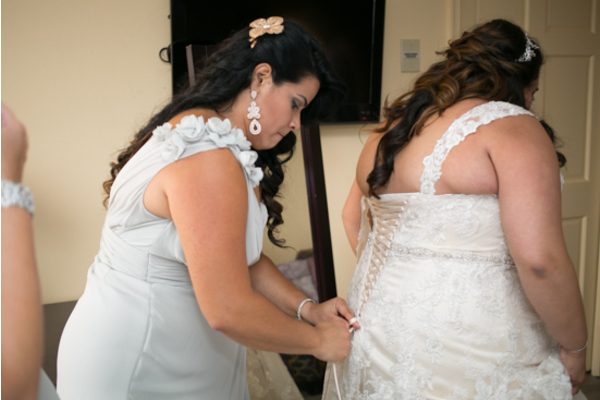 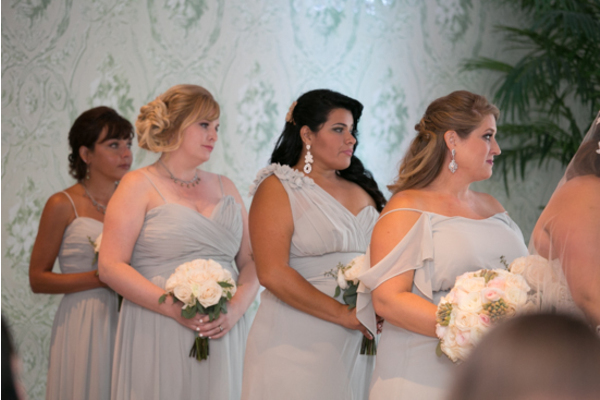 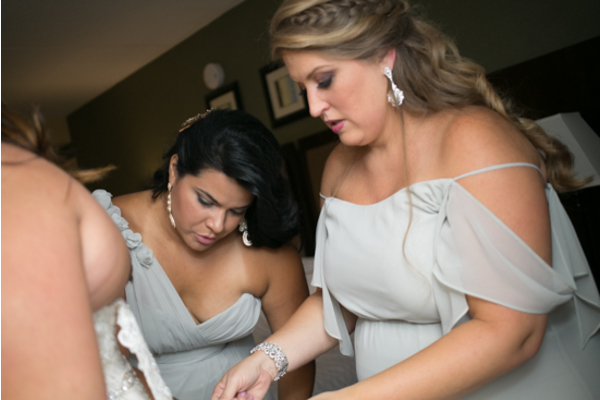 Her bridesmaids gathered around in their pretty baby blue dresses, and helped Fernanda tie her dress up. 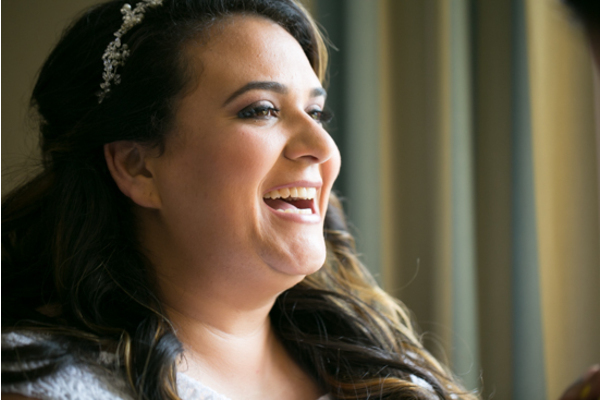 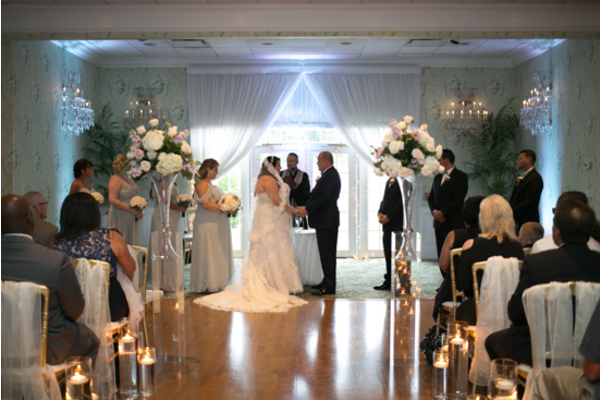 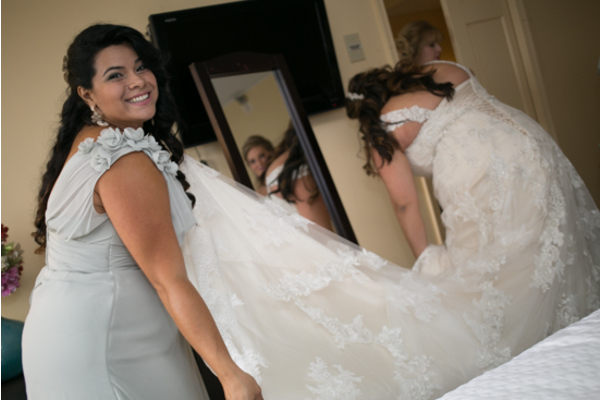 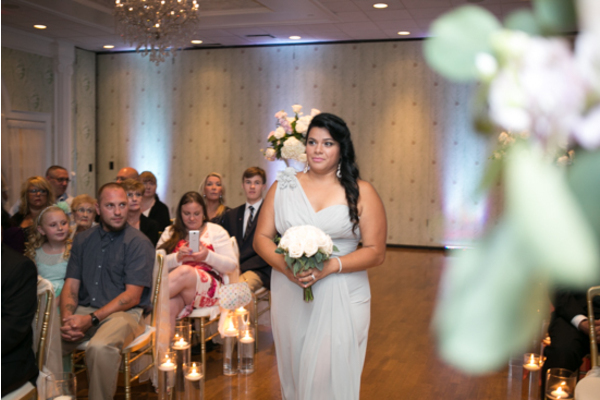 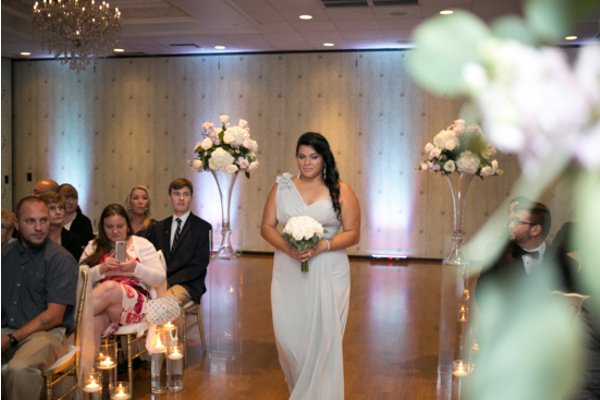 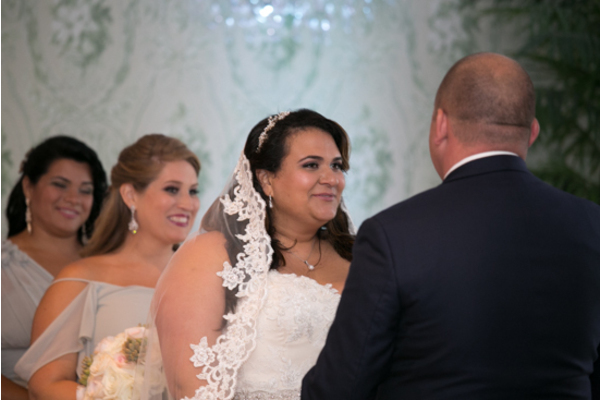 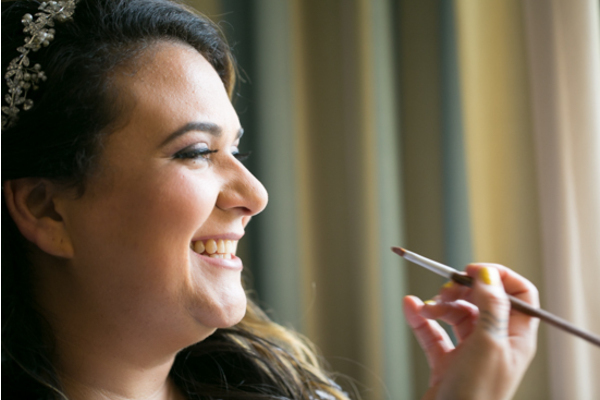 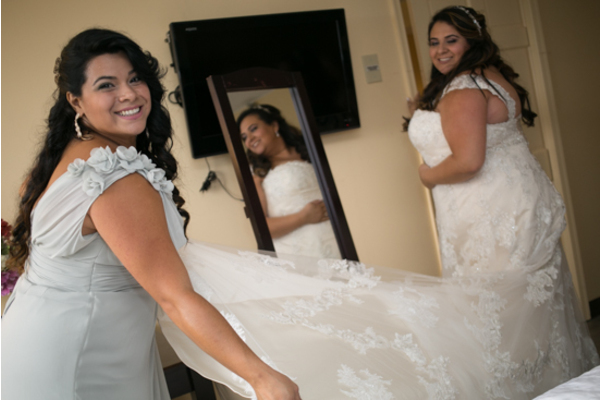 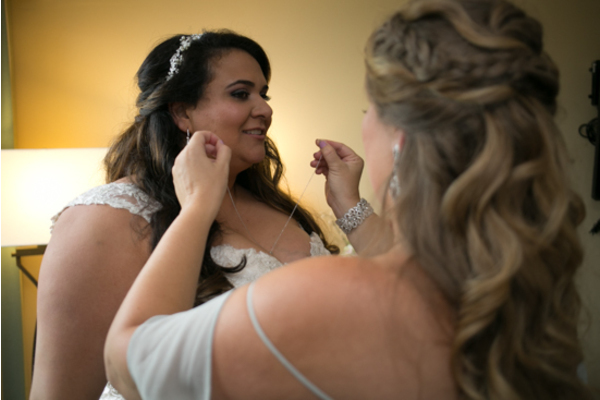 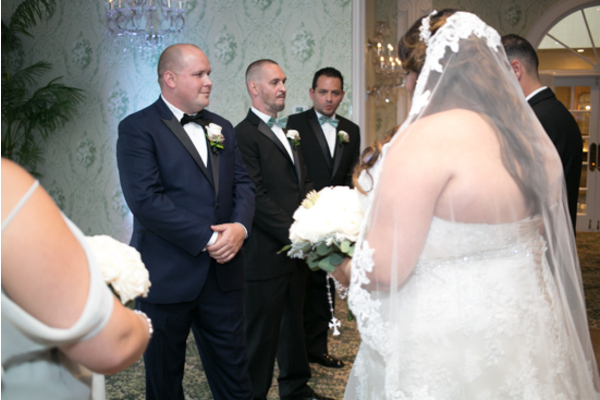 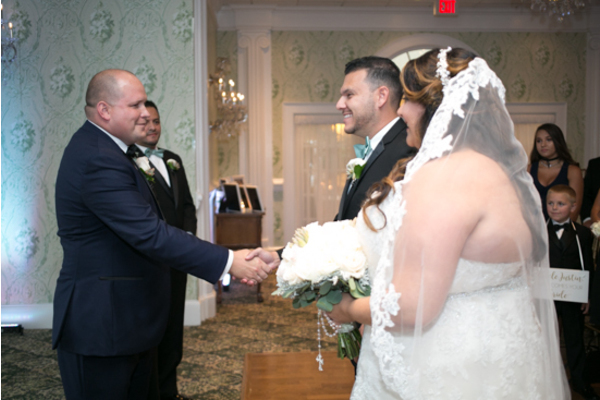 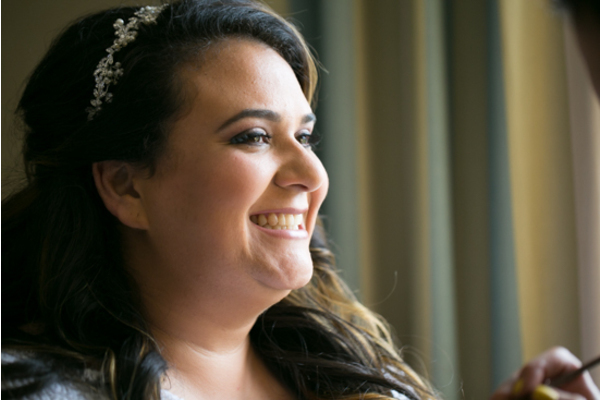 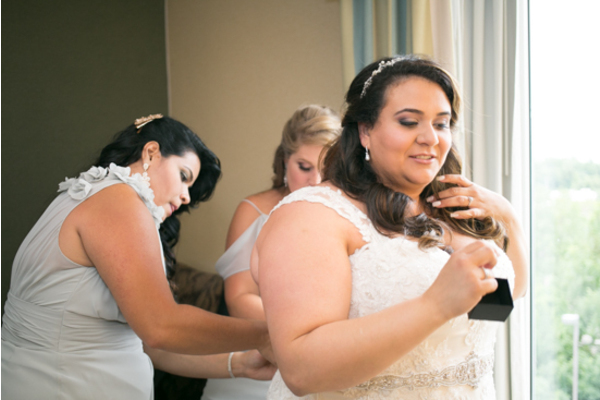 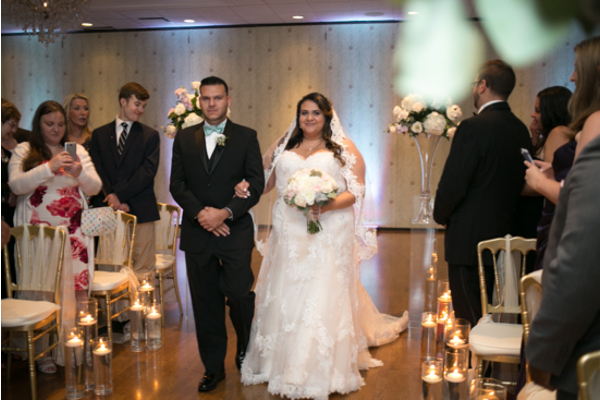 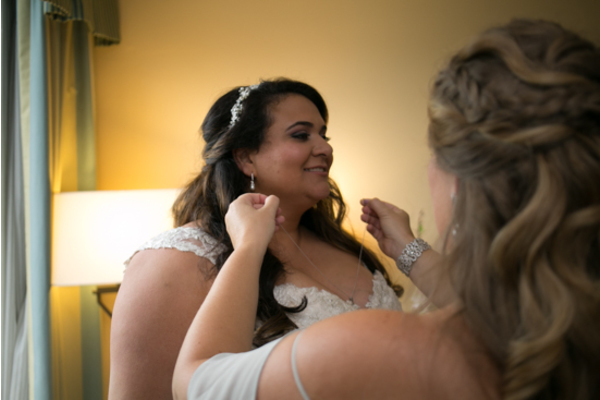 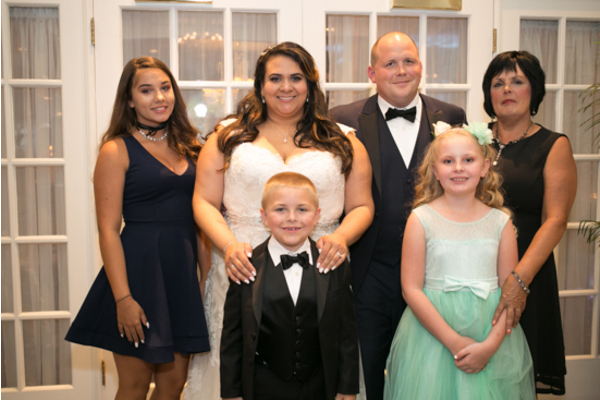 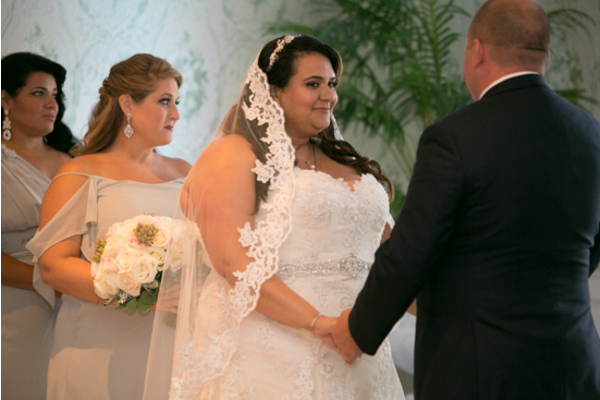 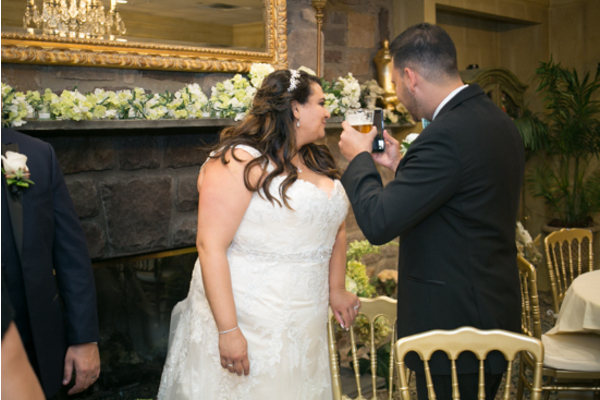 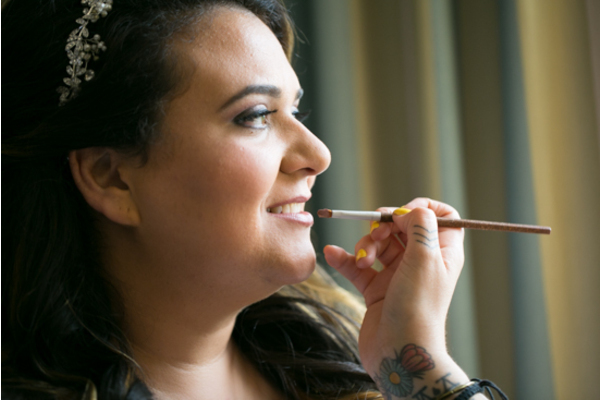 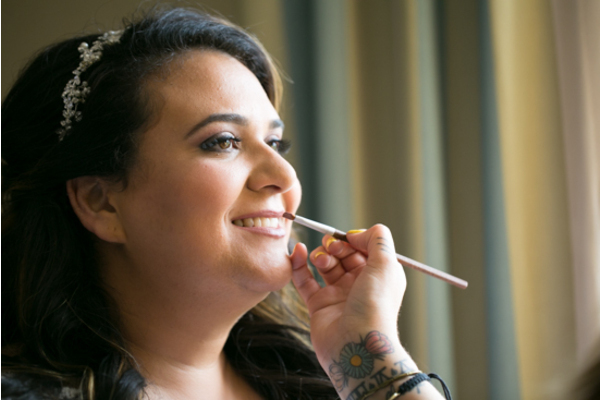 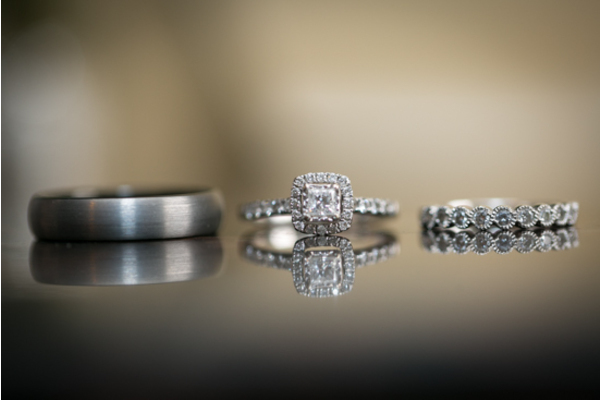 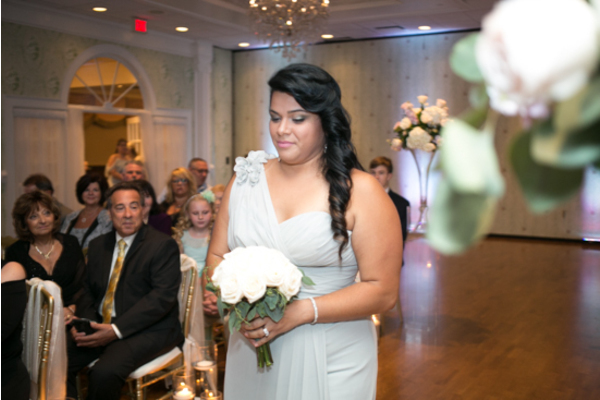 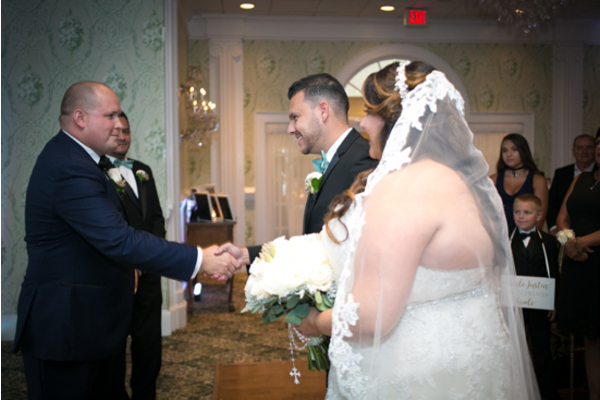 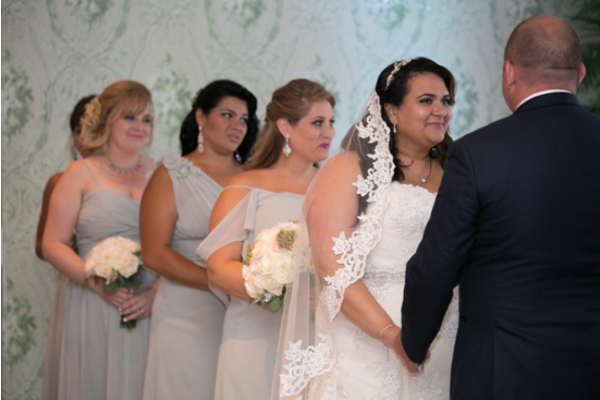 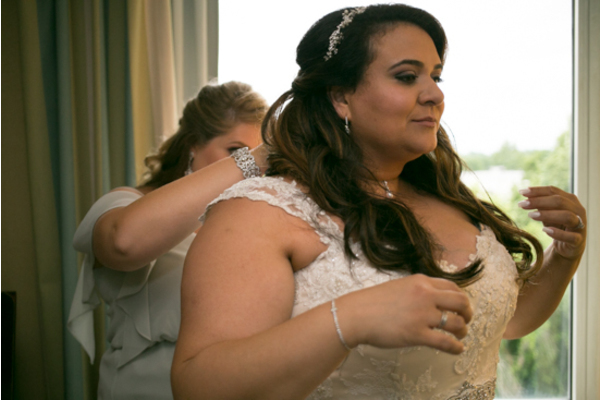 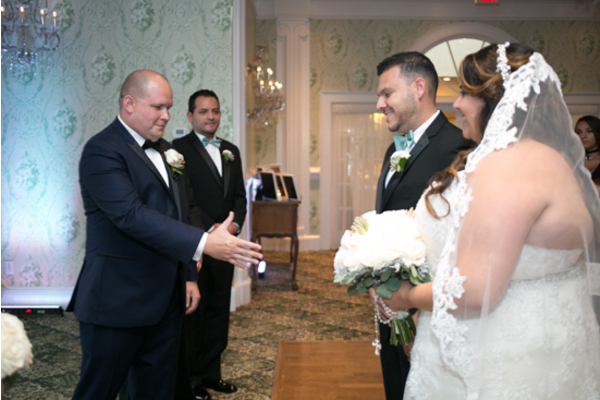 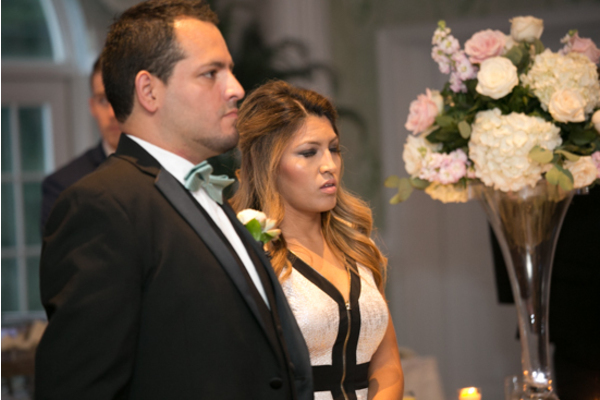 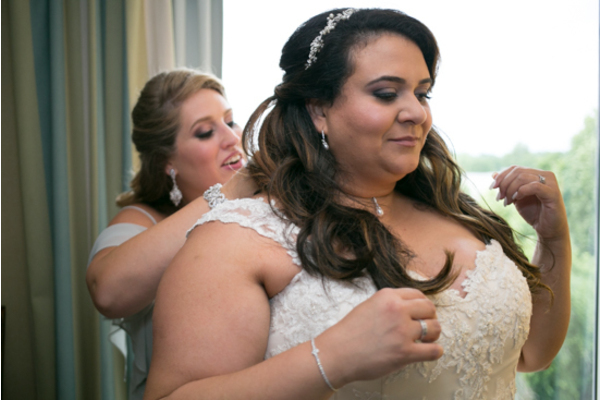 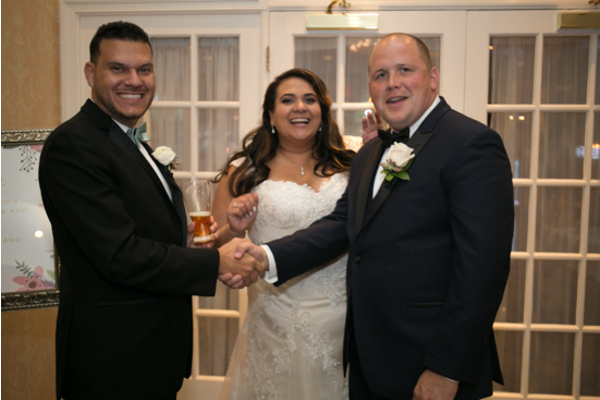 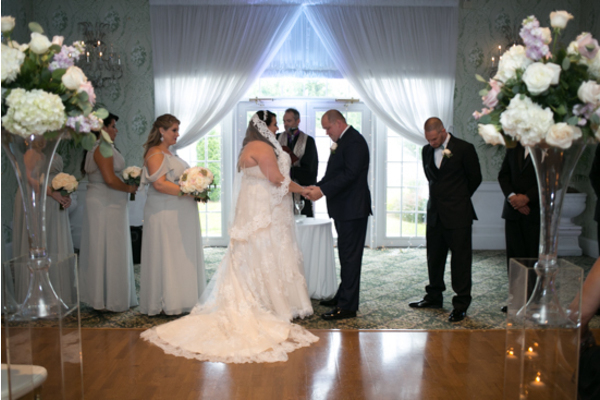 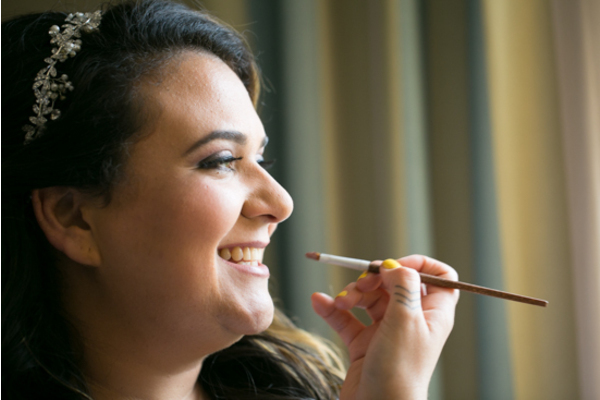 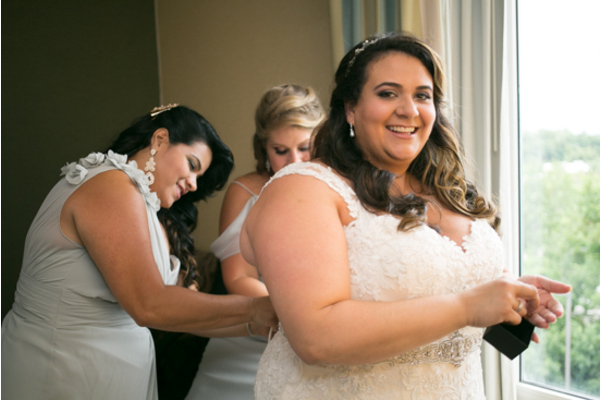 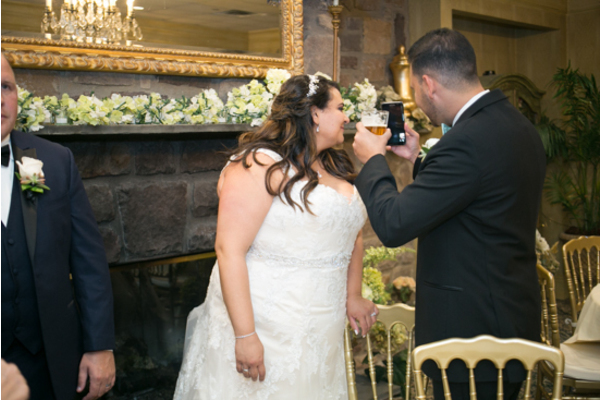 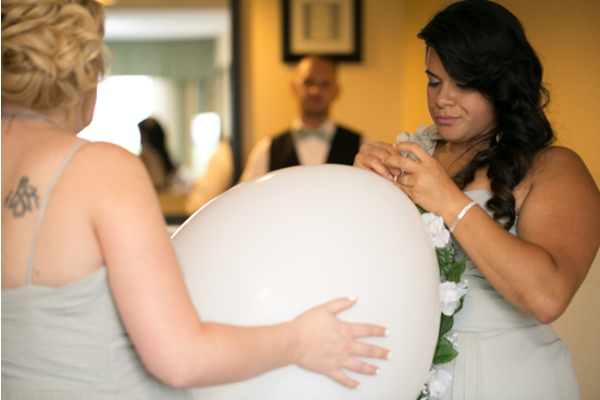 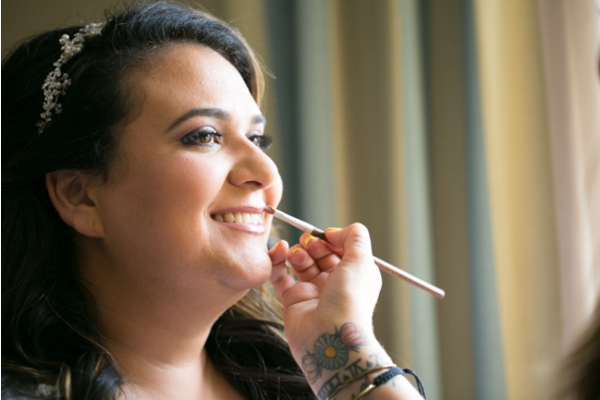 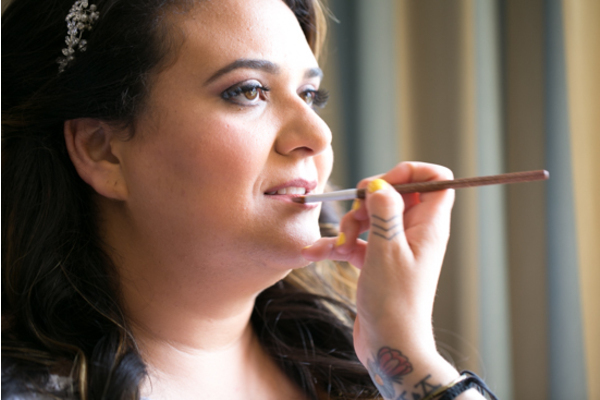 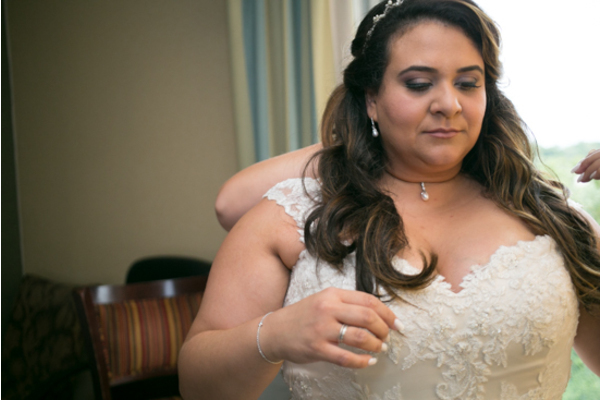 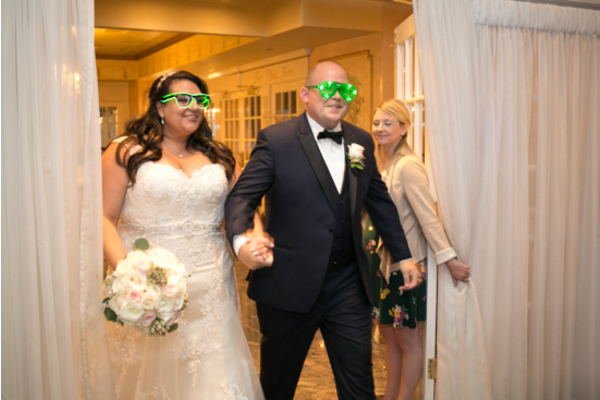 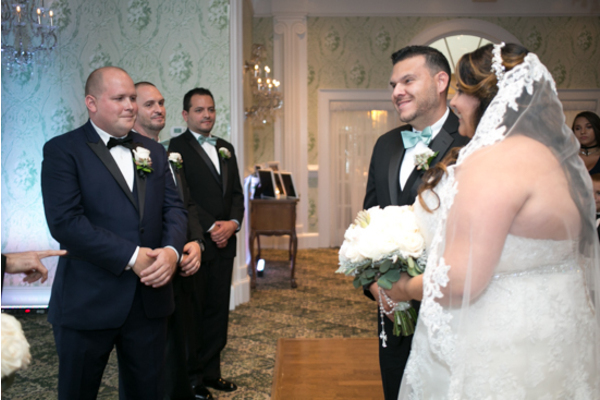 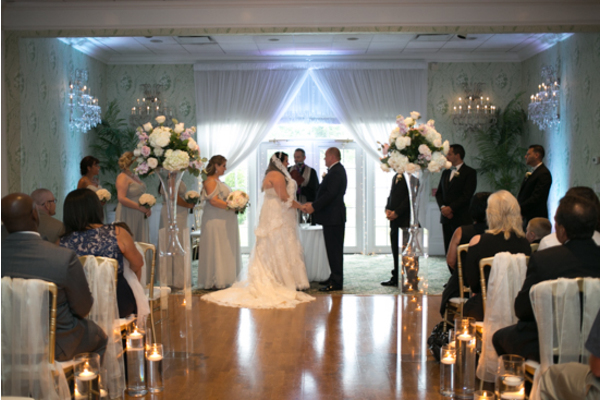 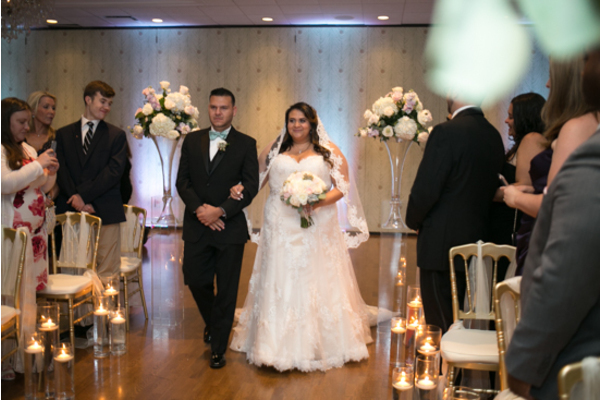 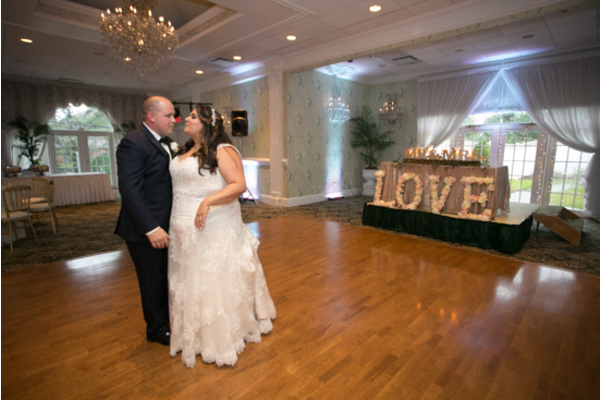 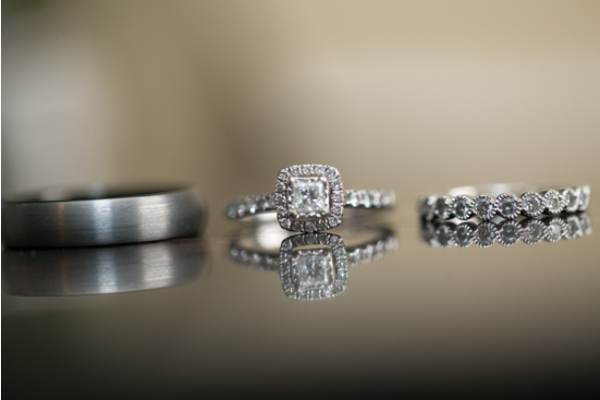 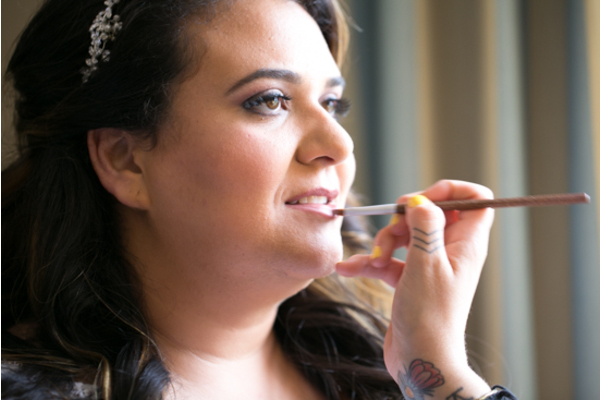 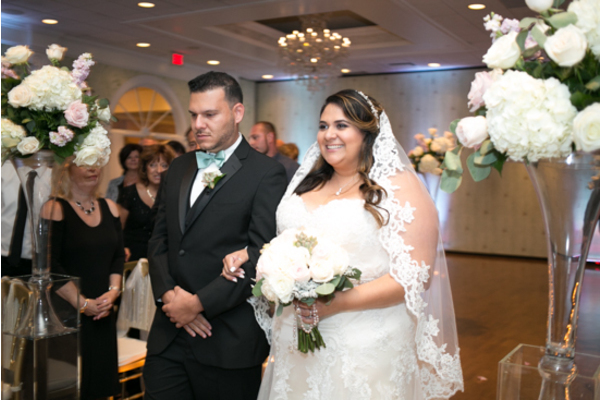 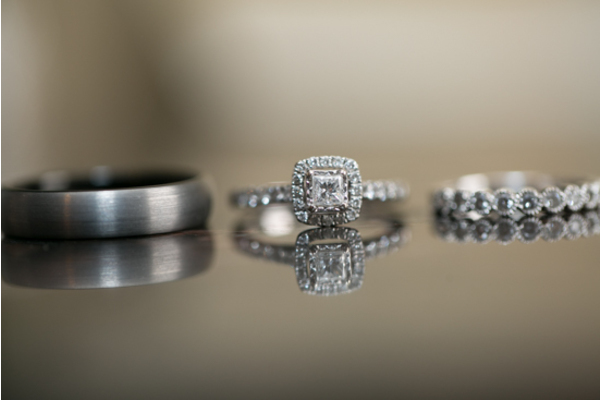 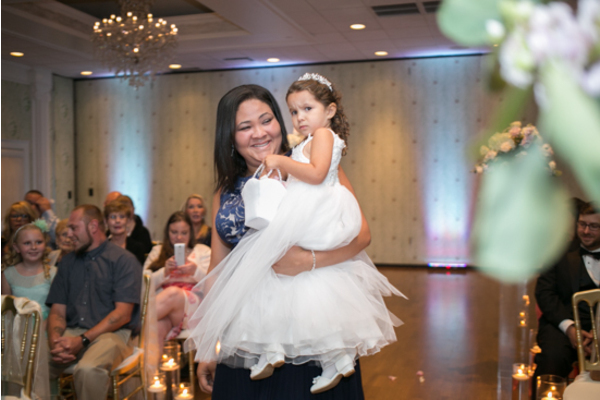 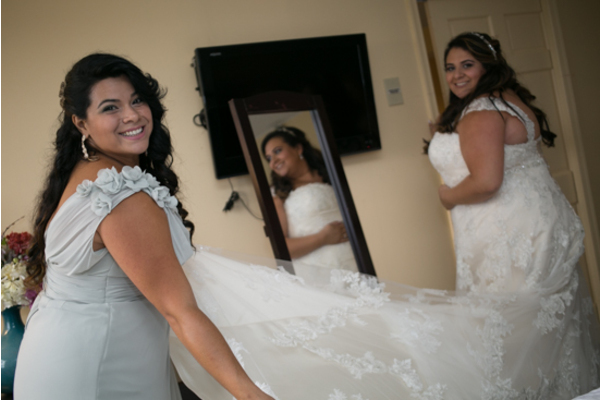 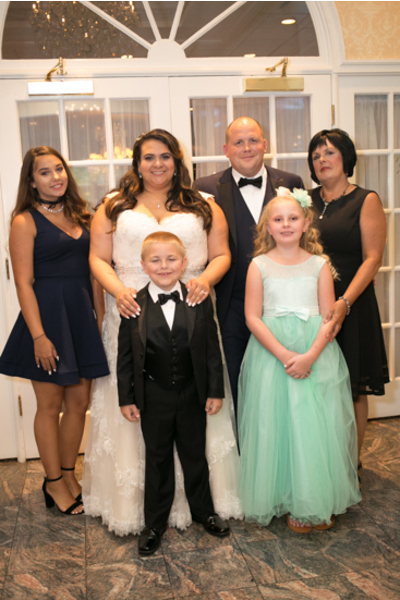 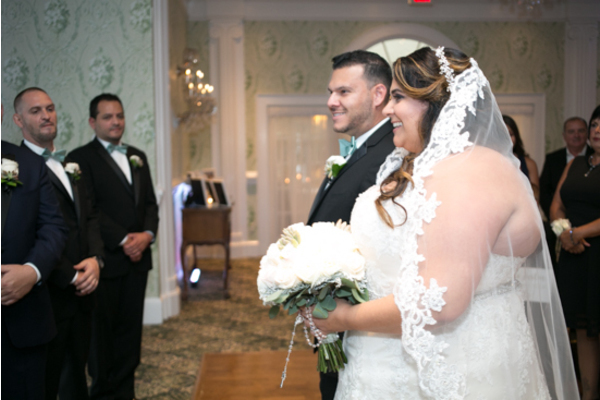 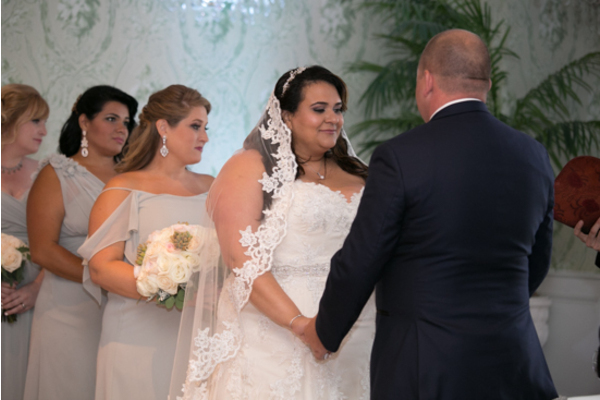 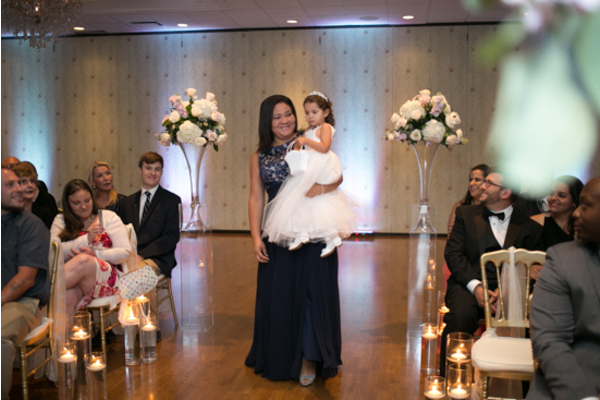 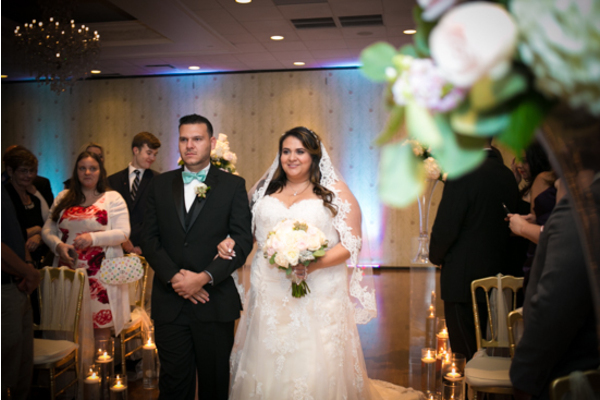 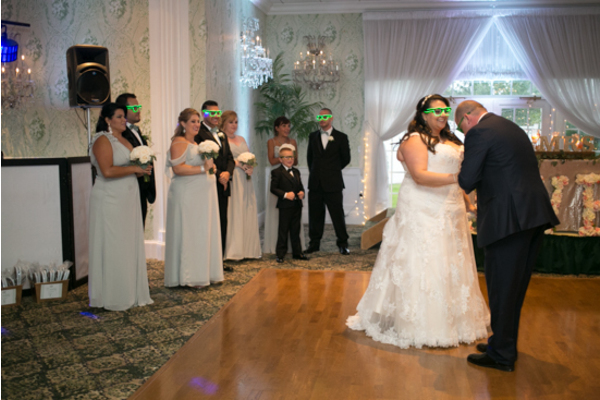 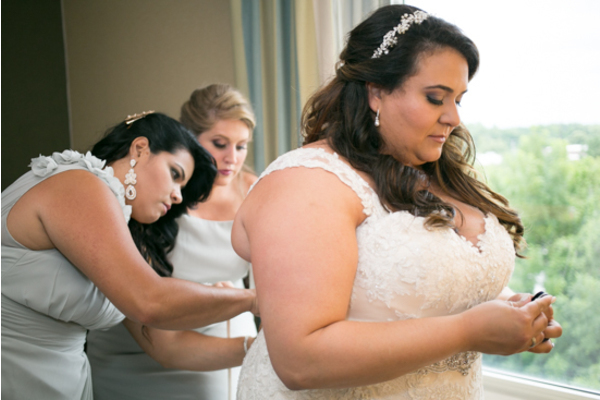 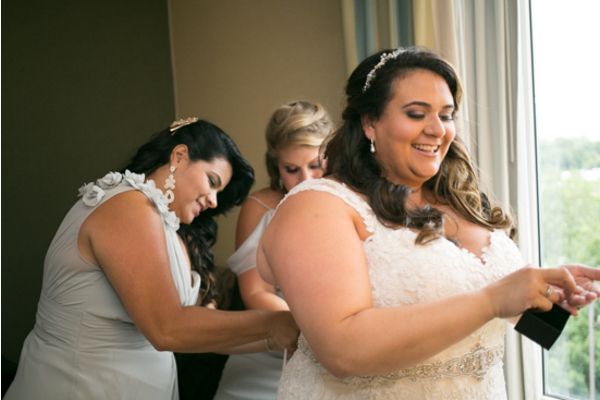 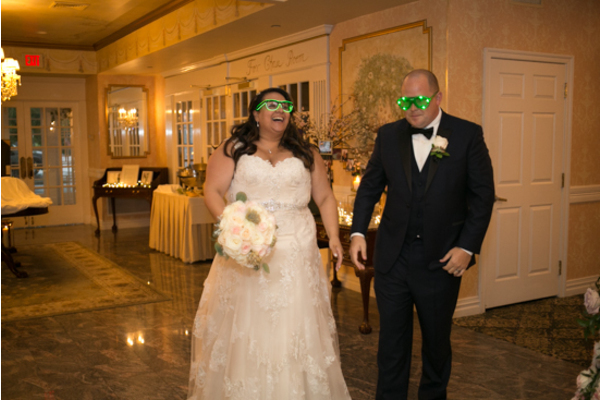 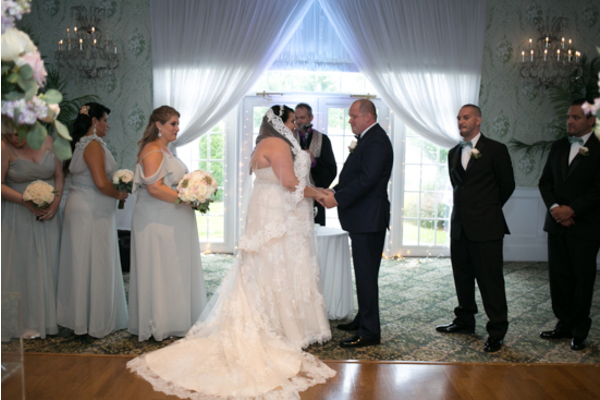 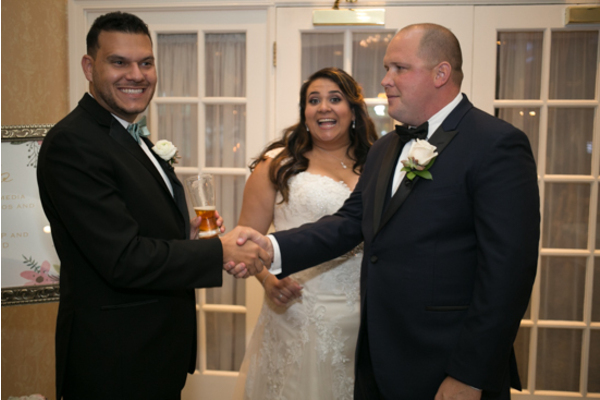 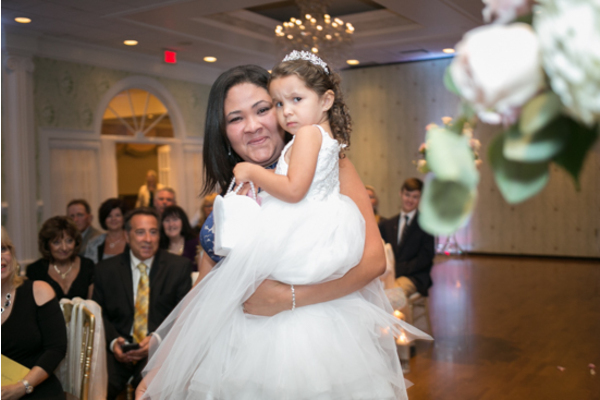 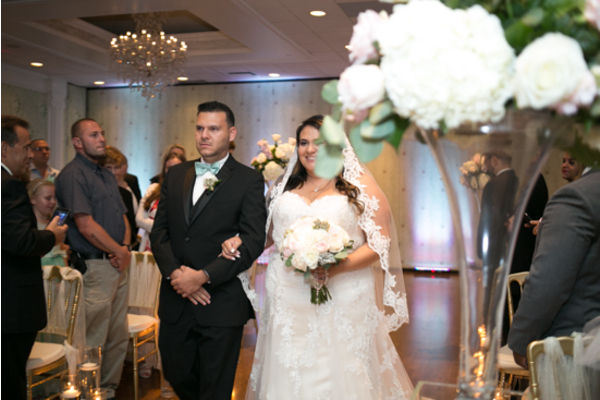 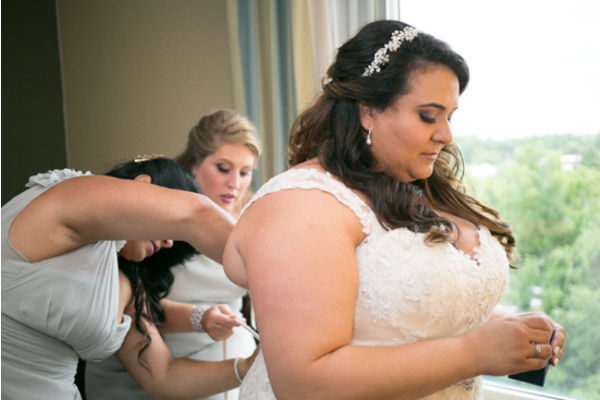 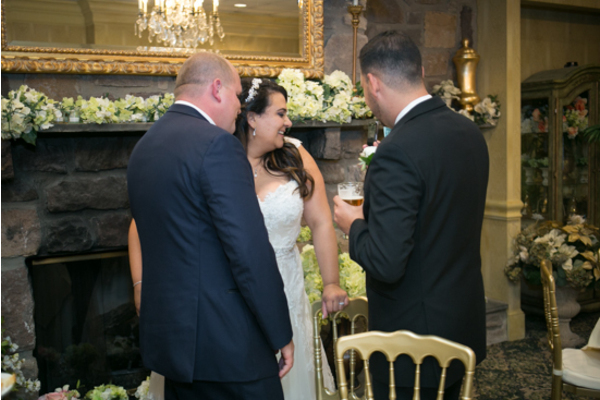 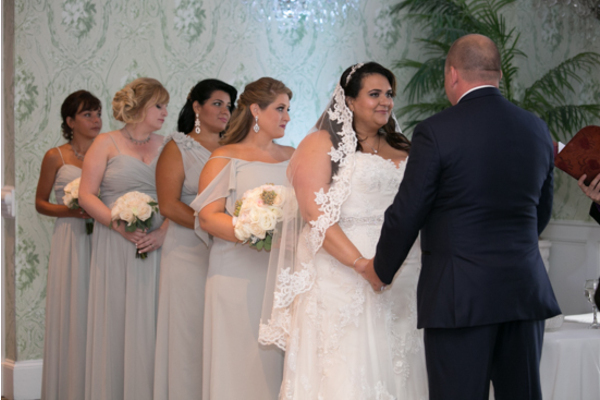 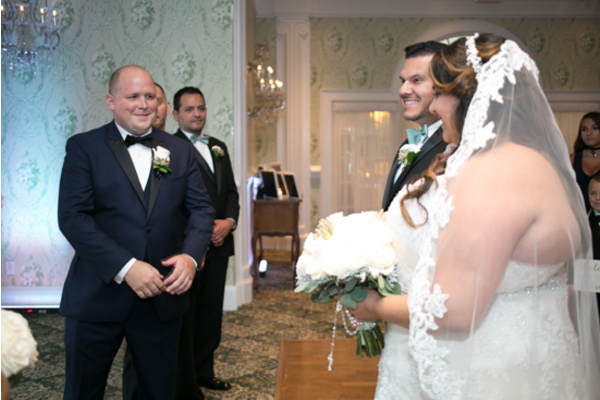 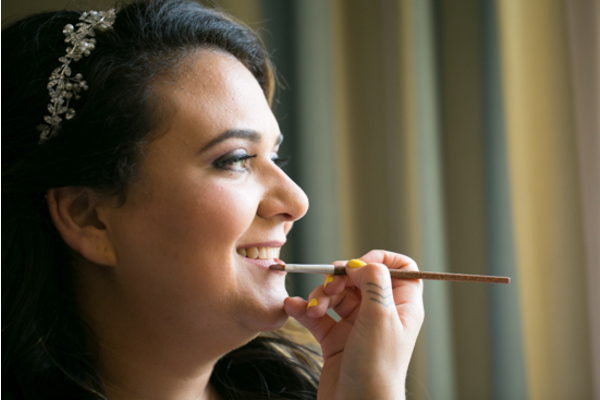 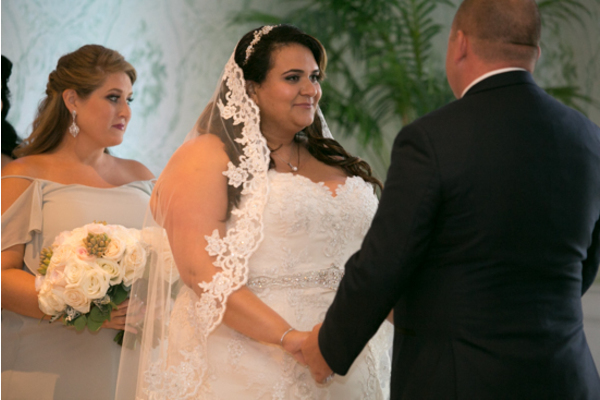 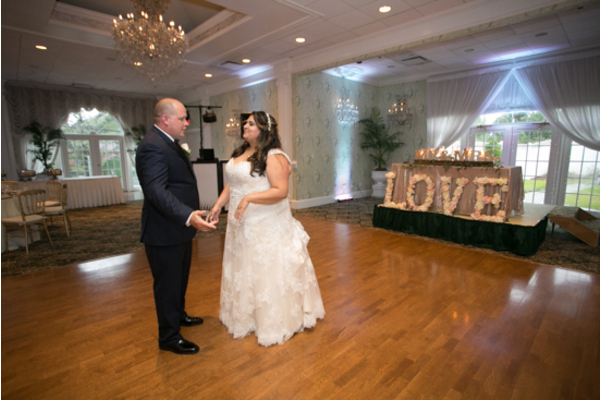 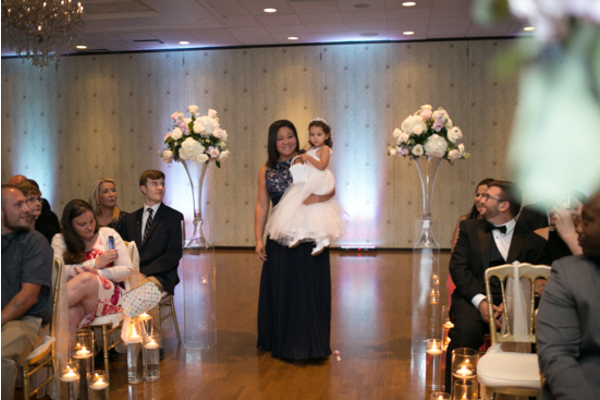 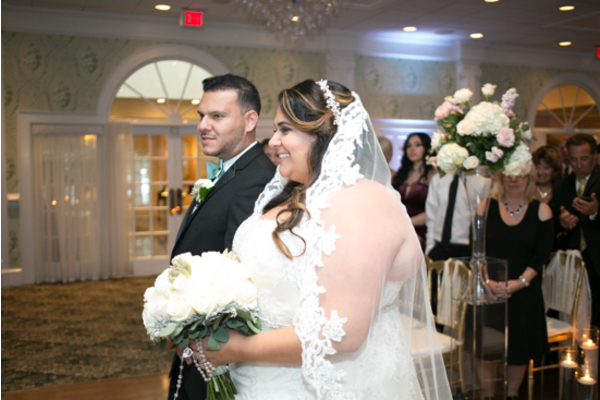 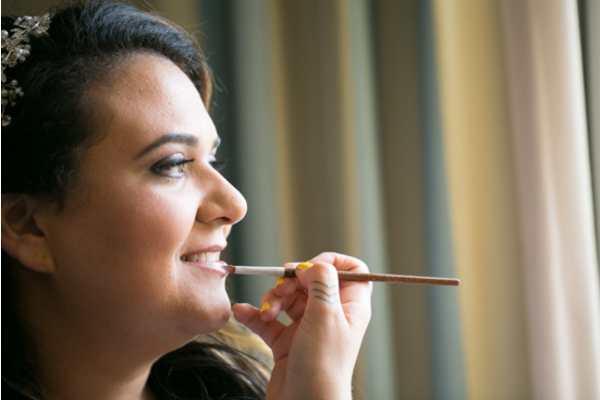 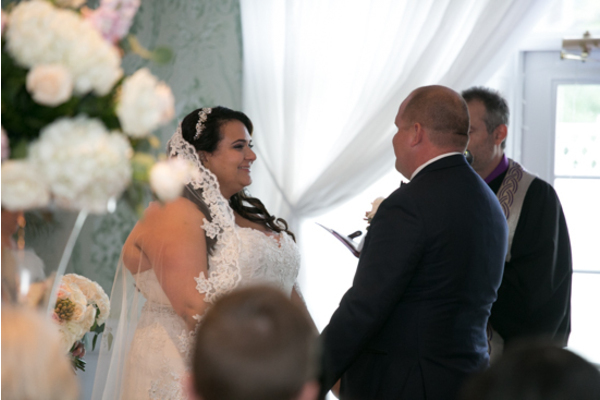 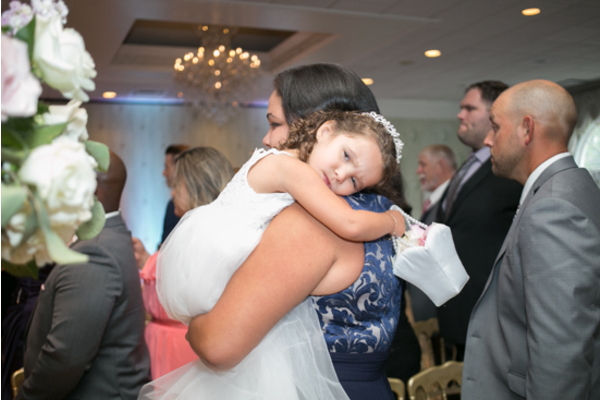 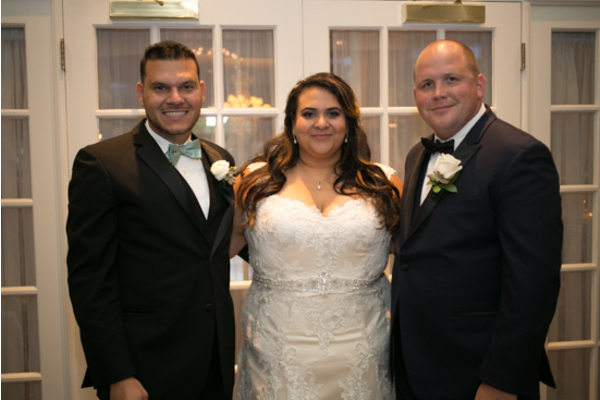 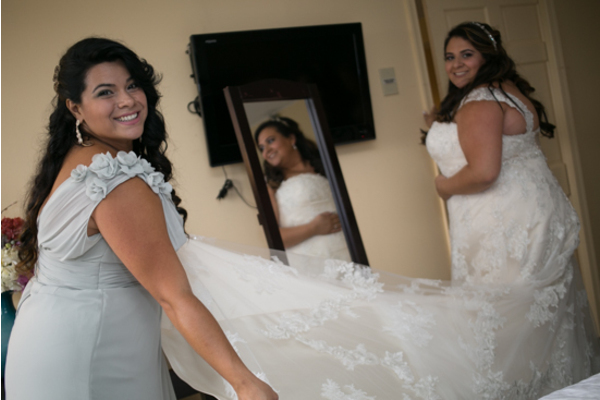 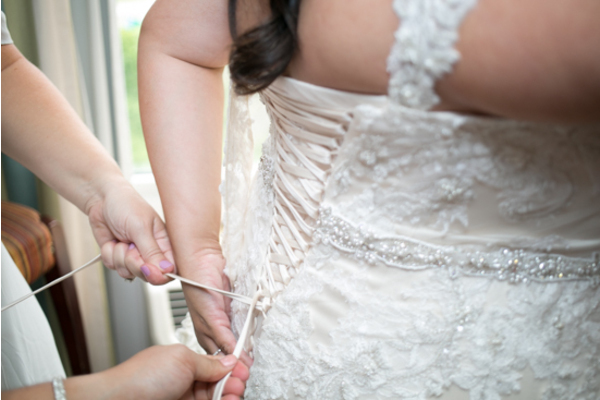 It was time for Fernanda’s first look with Justin and Our NJ Wedding Photographer was sure to capture this special moment. 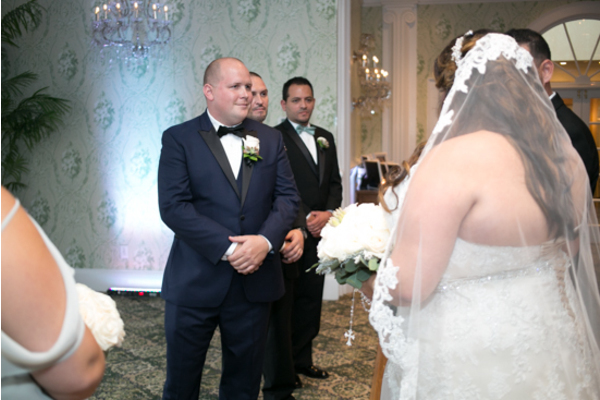 Justin’s face lit up when he saw his bride for the first time and he could not take his eyes off of her. 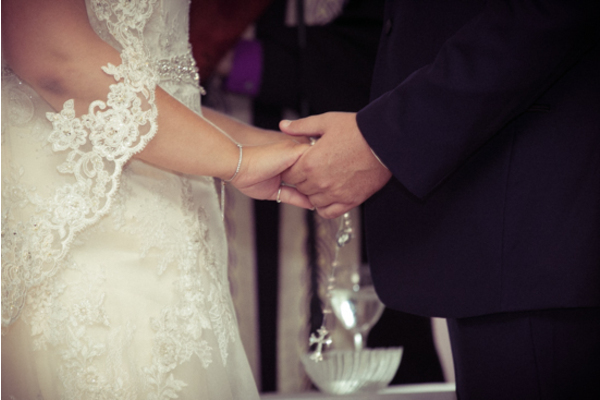 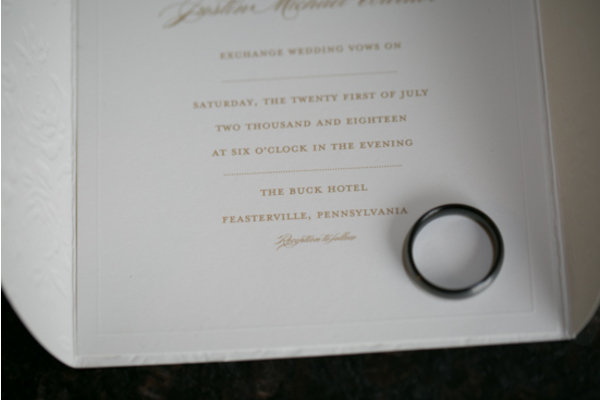 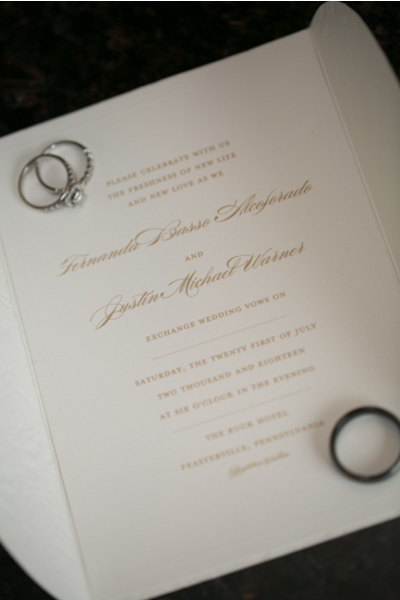 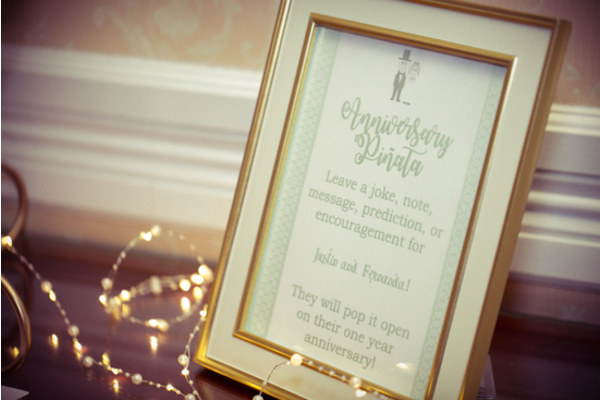 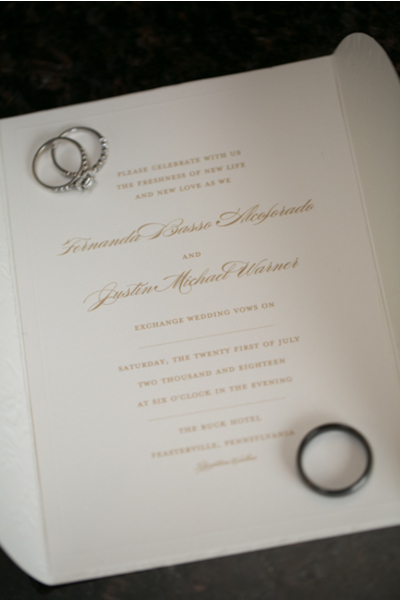 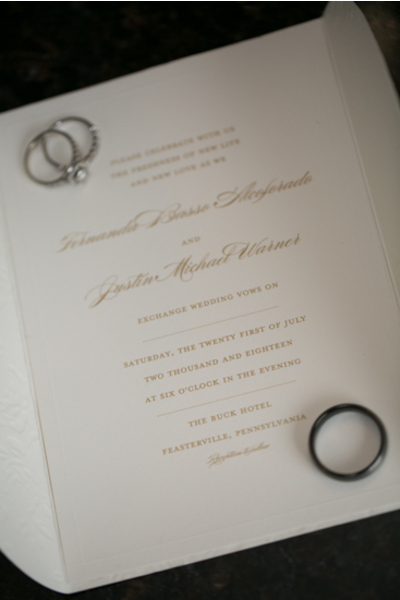 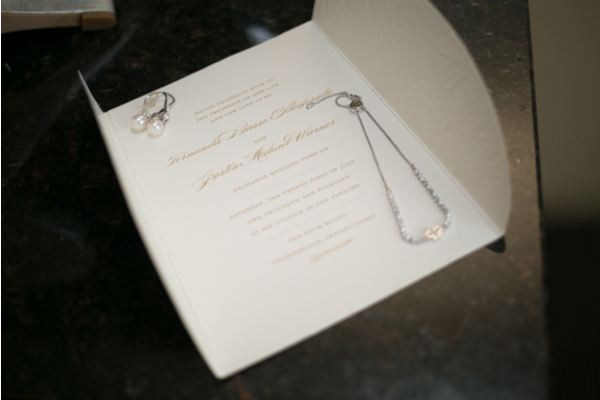 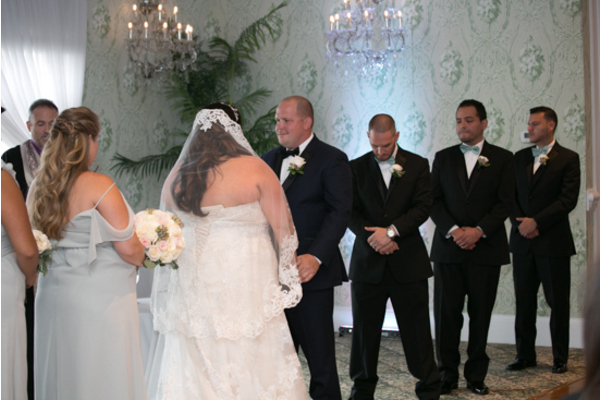 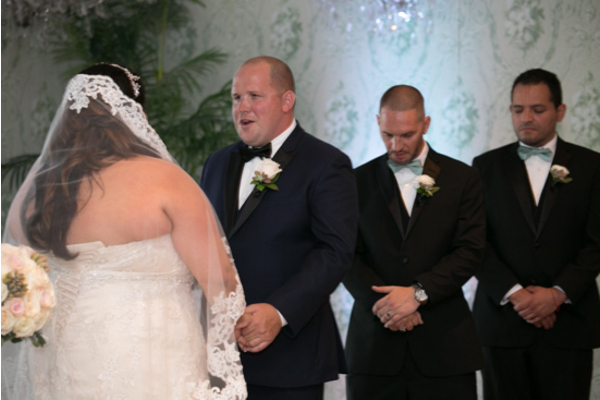 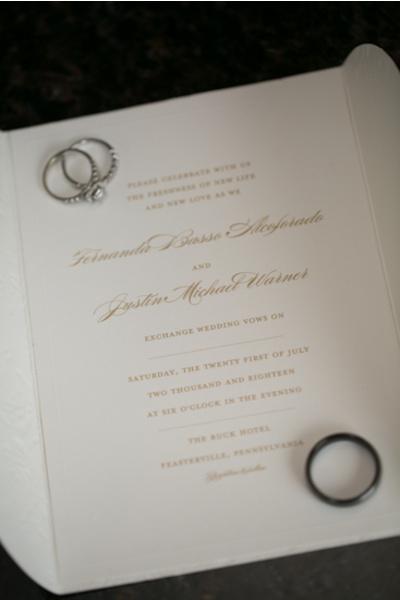 The time had come for Fernanda and Justin to say their vows to each other. 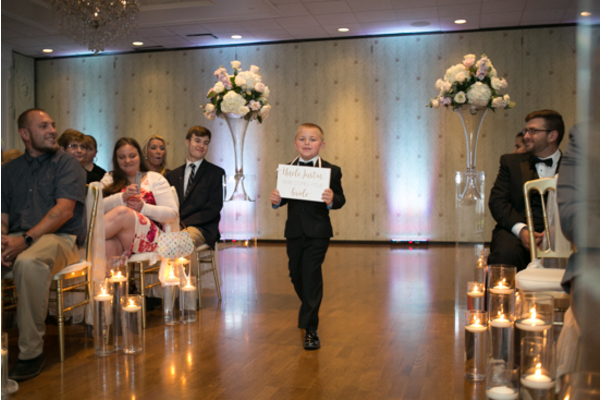 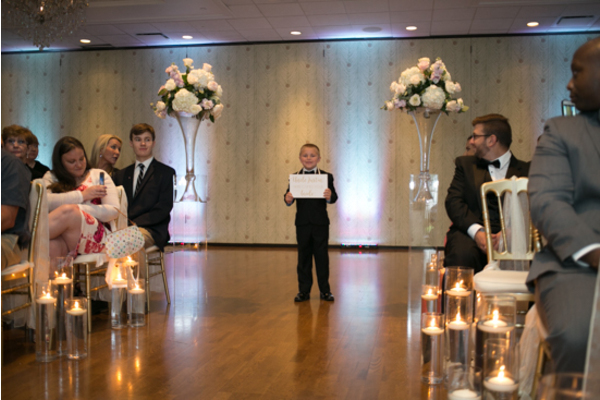 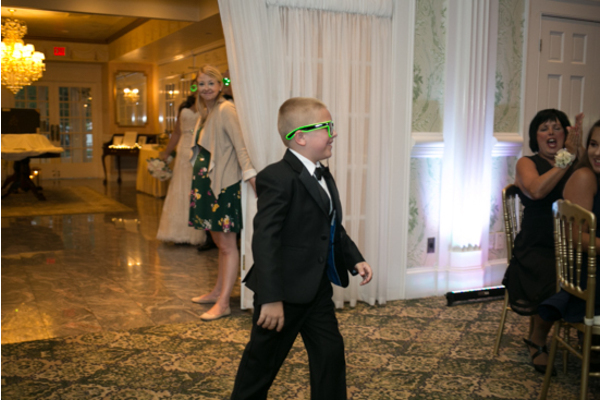 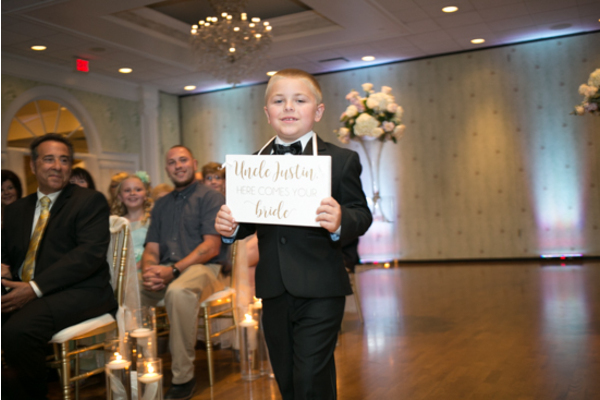 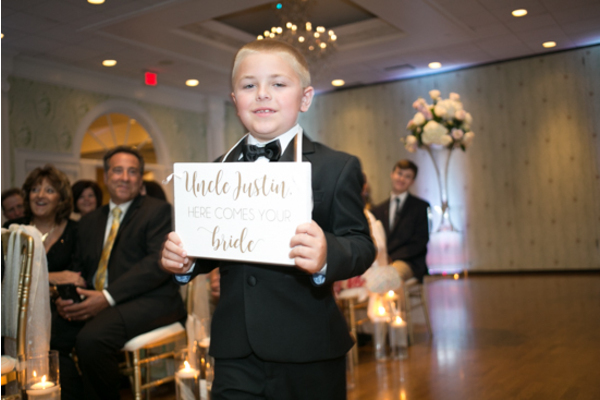 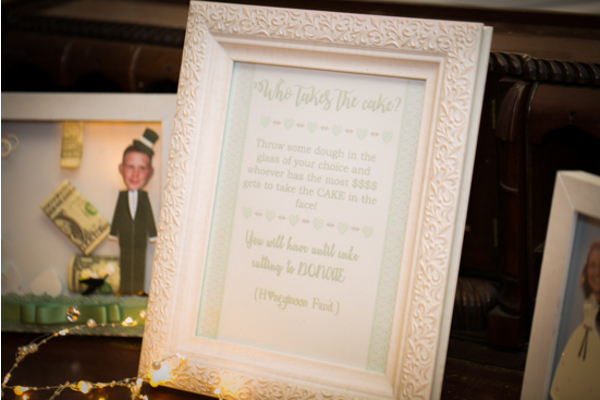 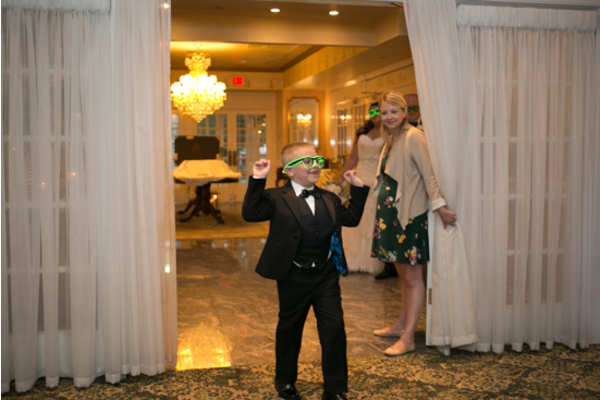 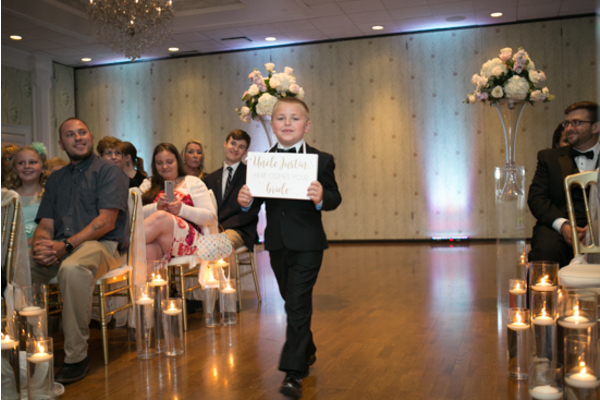 Their favorite little guy walked down the aisle with a sign that read, “Uncle Justin, here comes your bride.” The beautiful couple sealed their marriage with a kiss and guests could not contain their excitement! 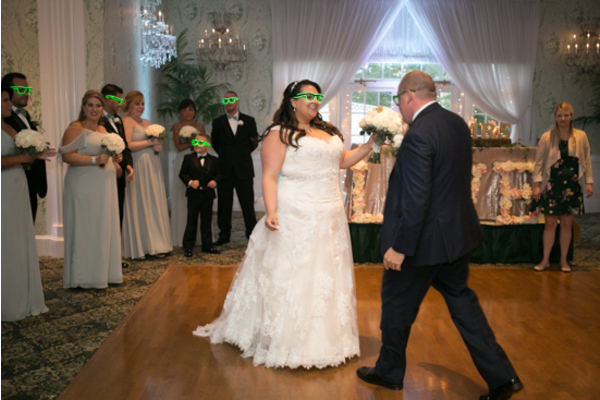 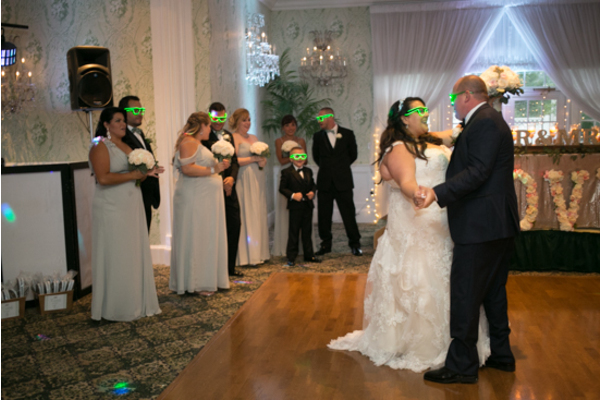 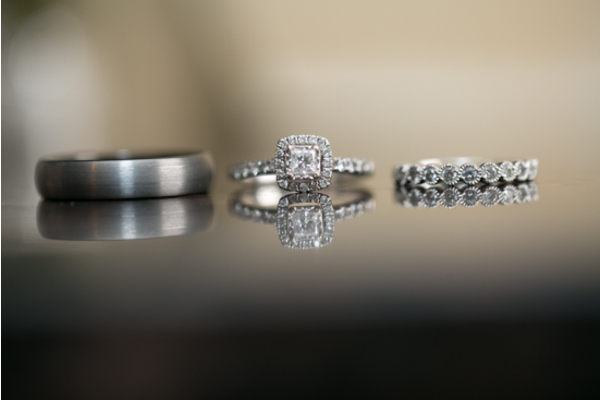 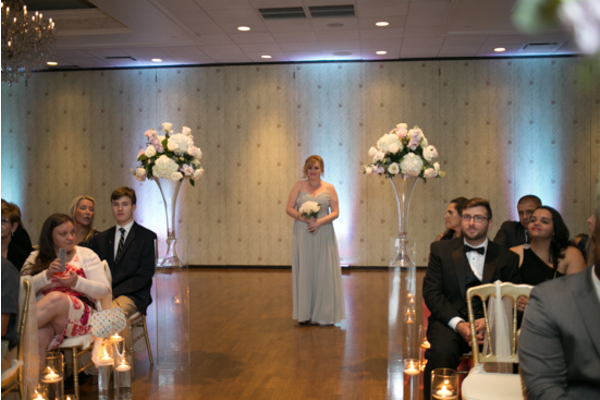 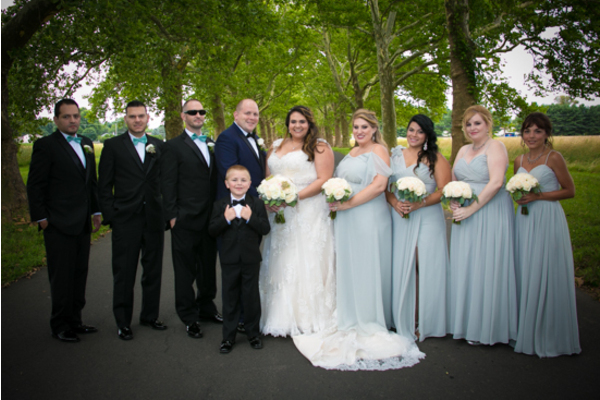 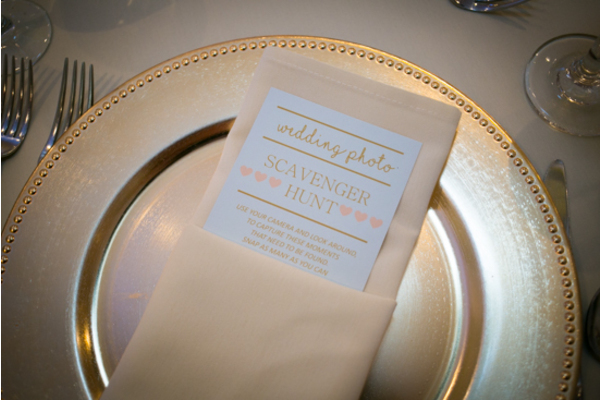 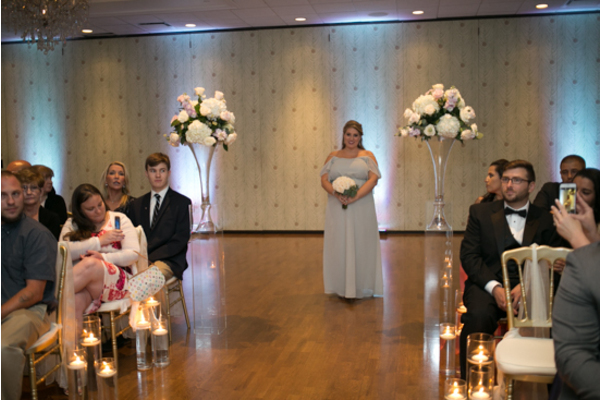 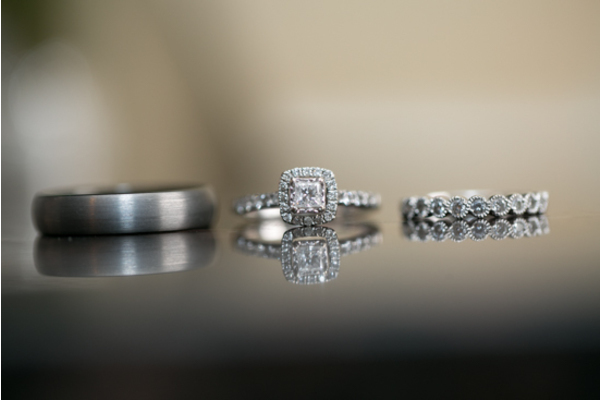 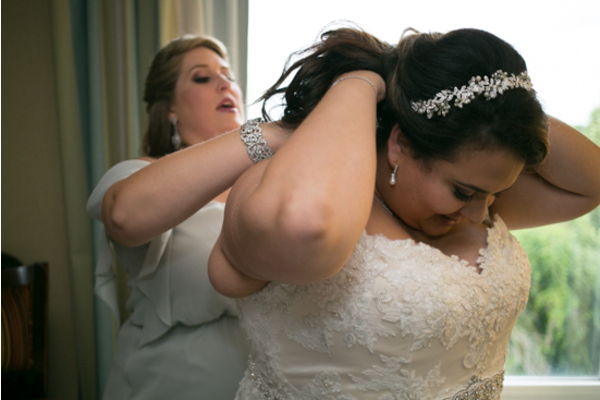 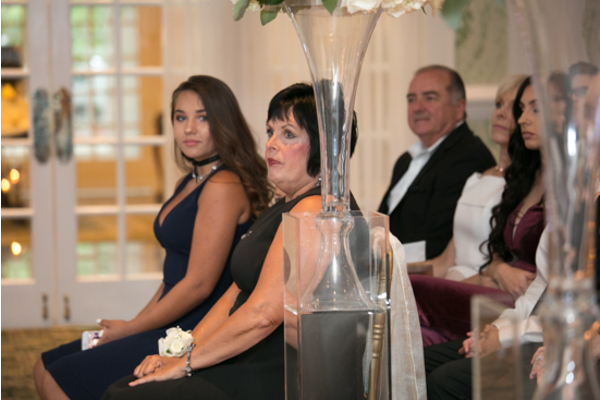 Our NJ Wedding Photographer was there to capture this once in a lifetime moment. 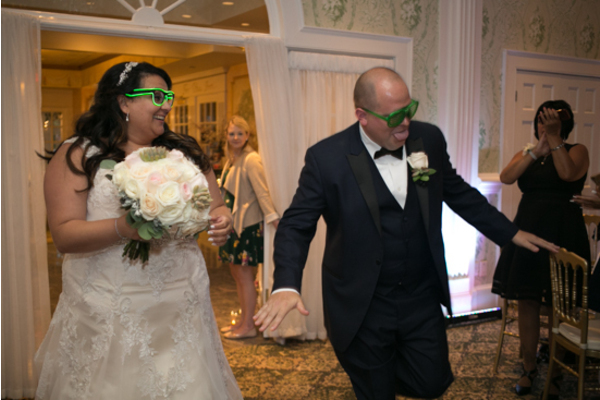 Time to celebrate! 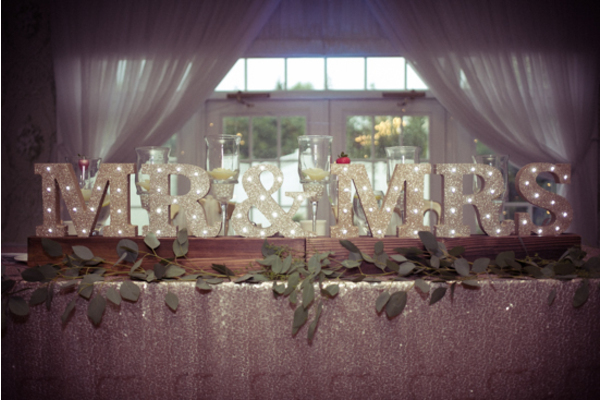 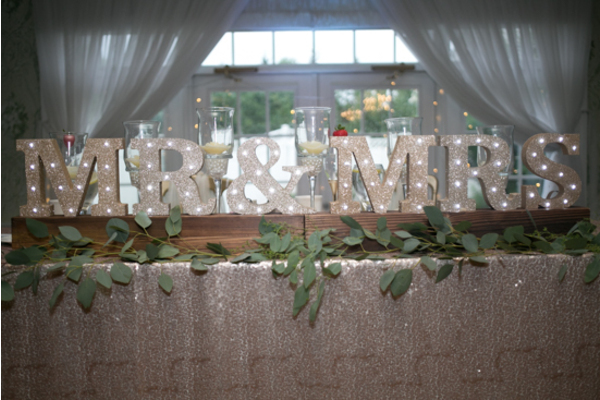 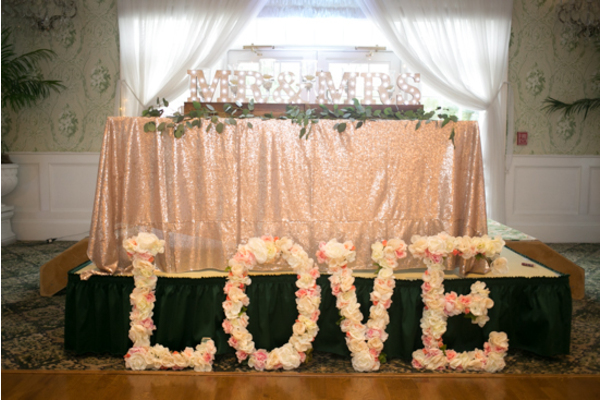 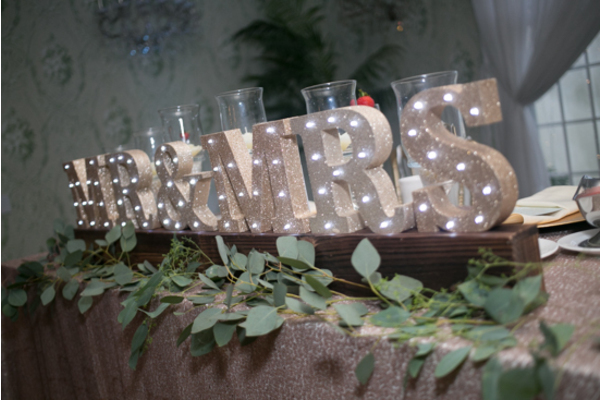 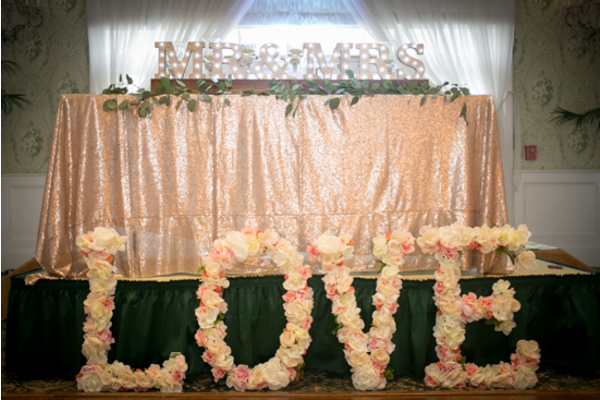 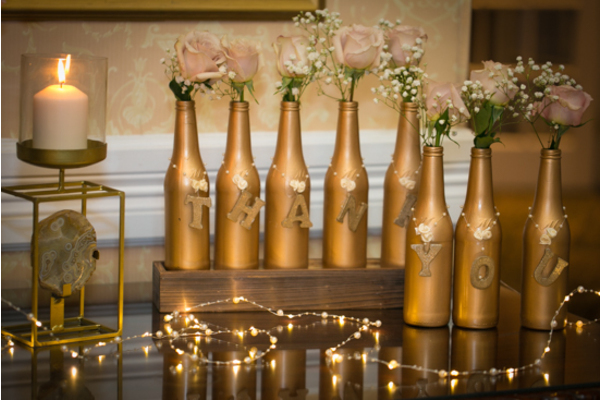 Rustic decorations and flowers filled the venue as the newlyweds danced their way into the reception. 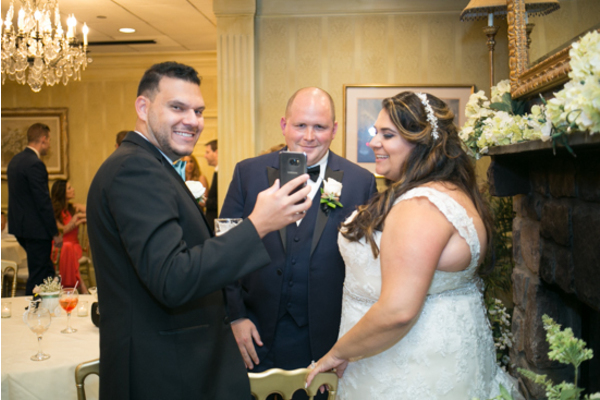 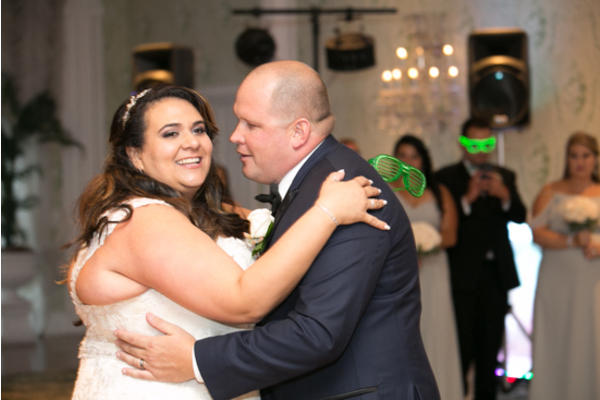 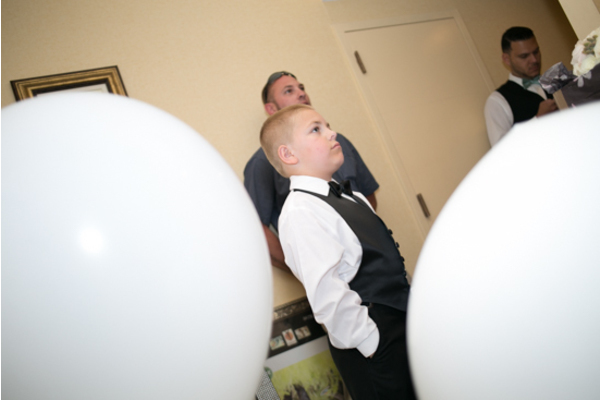 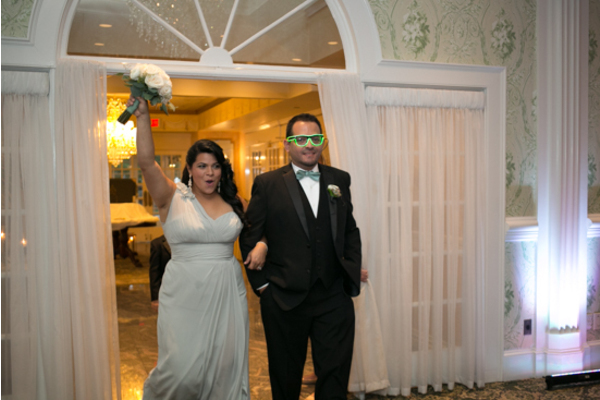 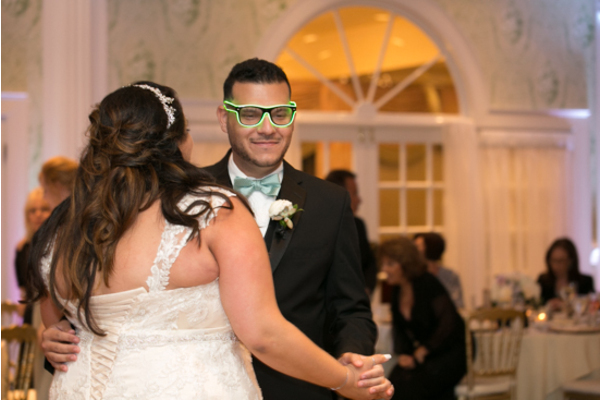 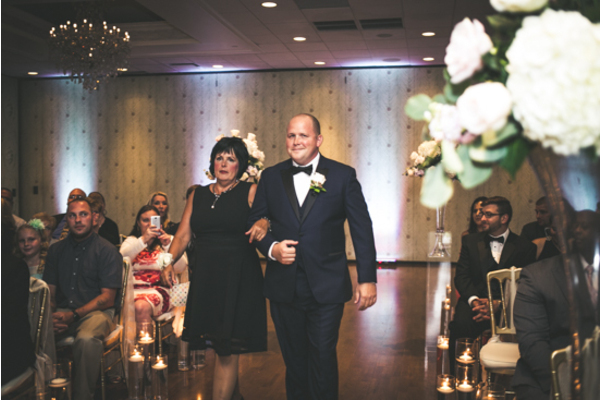 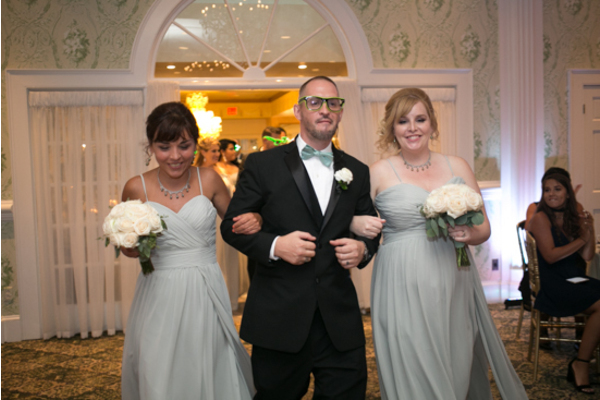 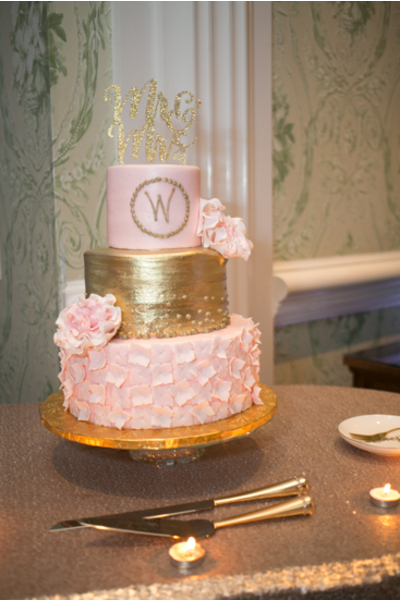 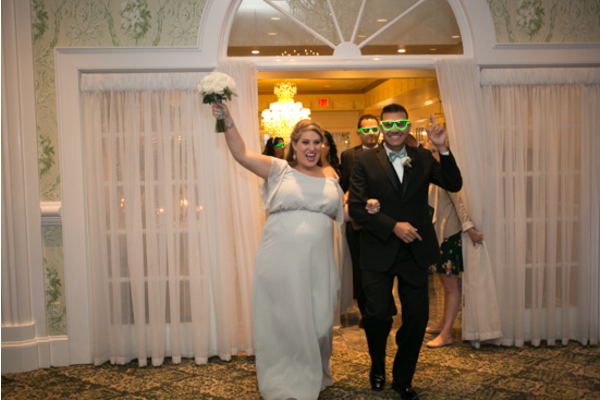 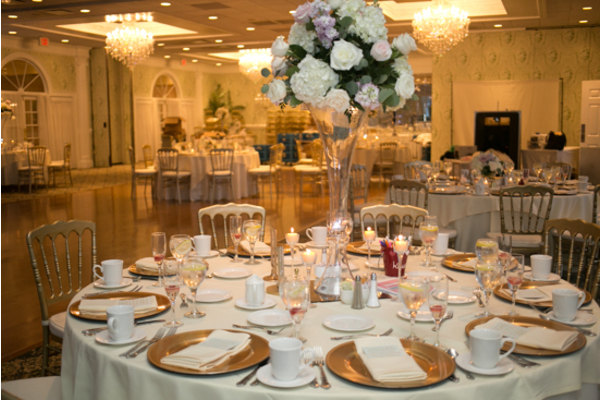 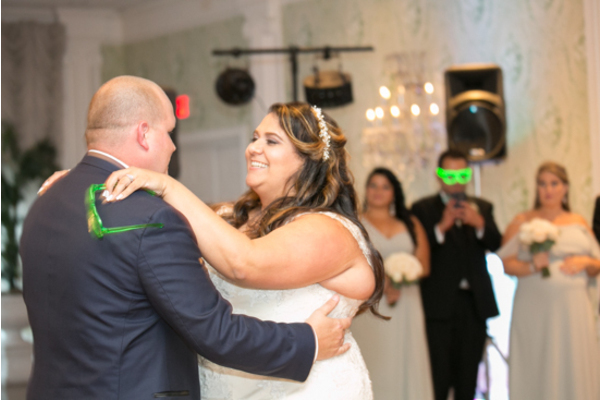 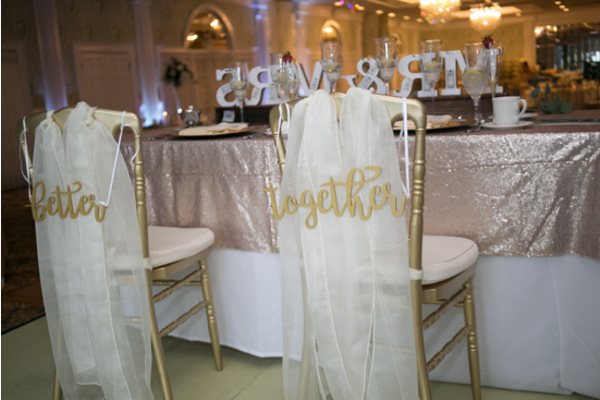 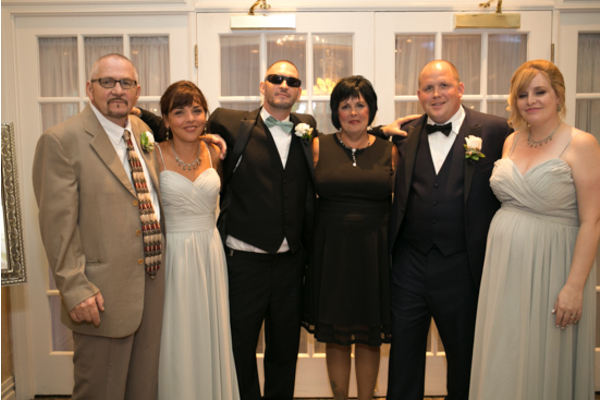 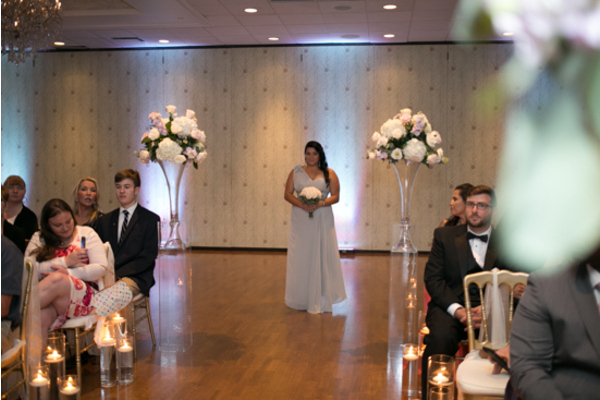 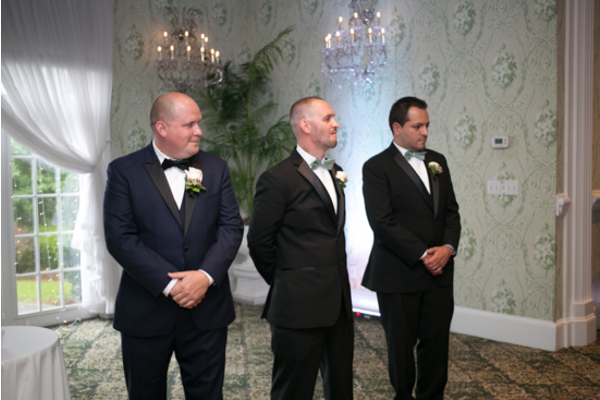 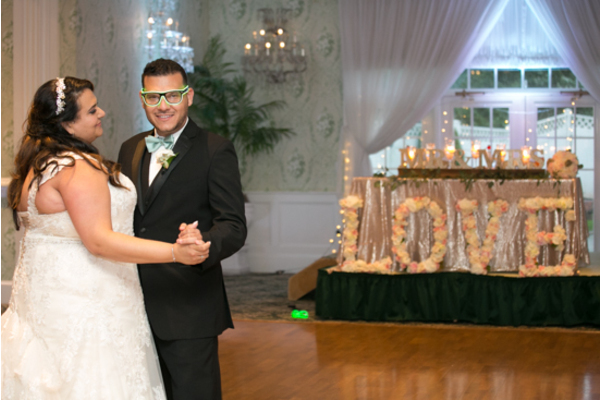 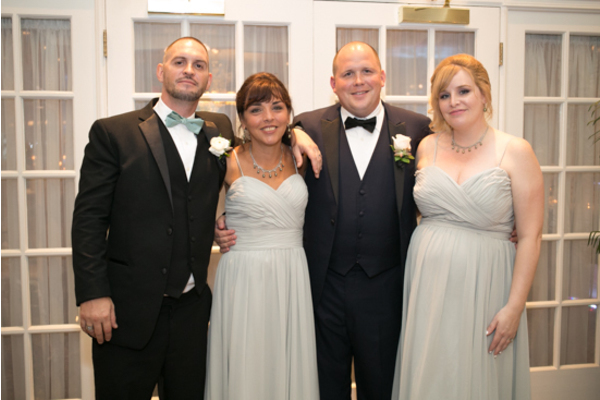 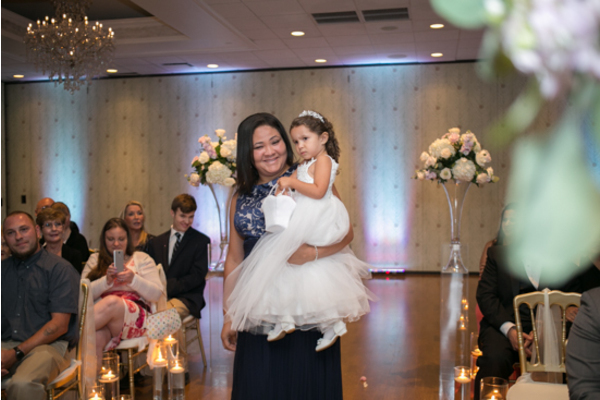 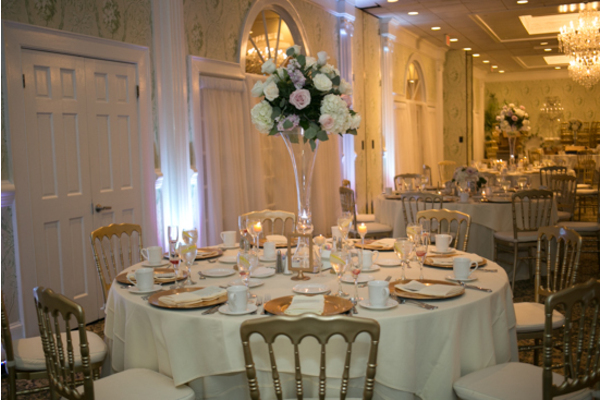 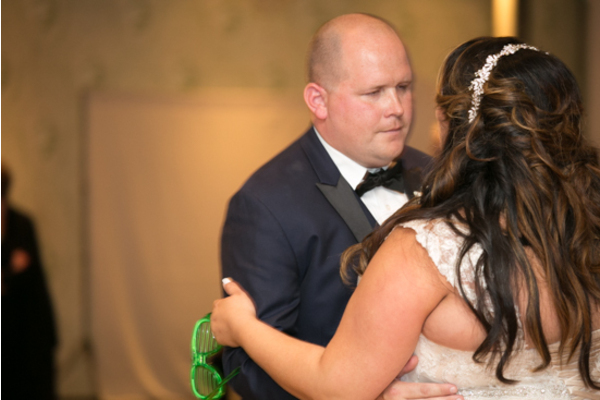 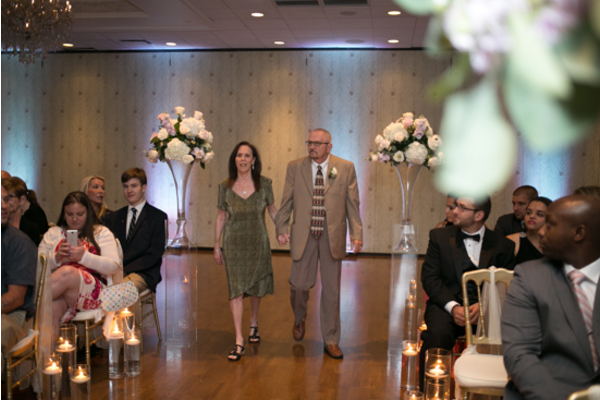 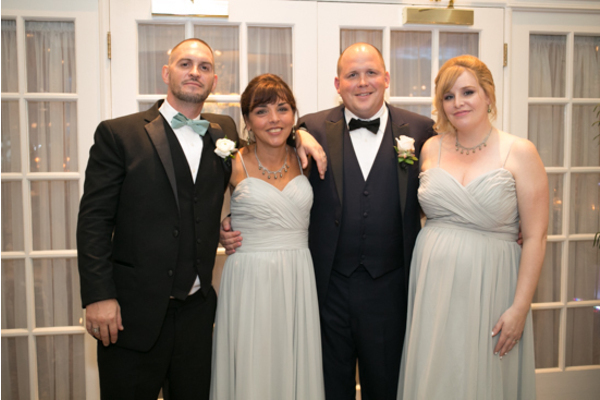 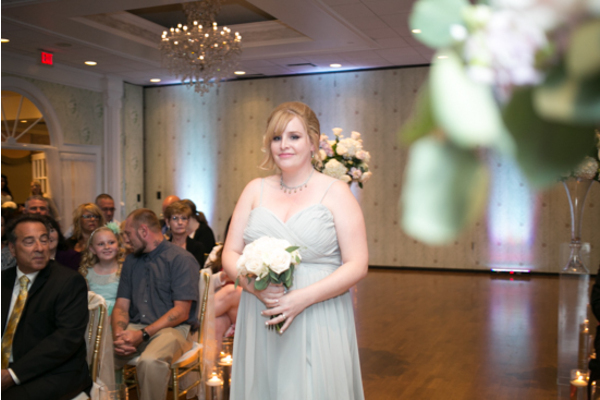 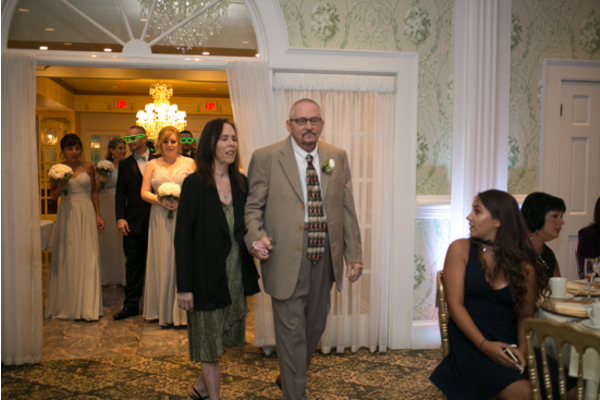 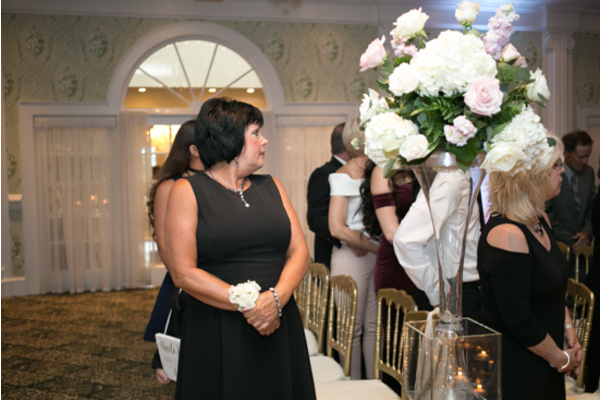 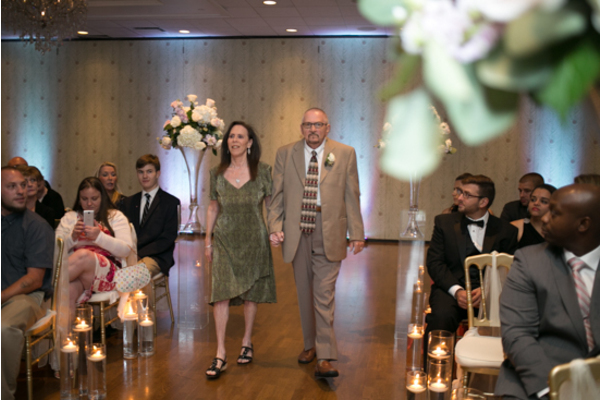 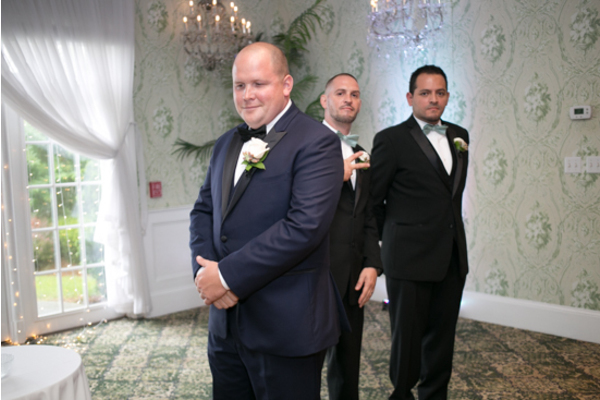 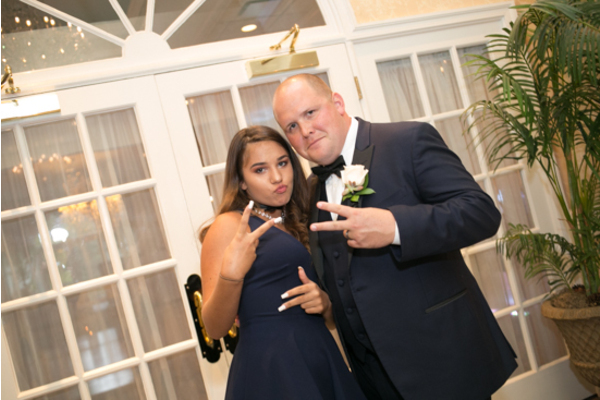 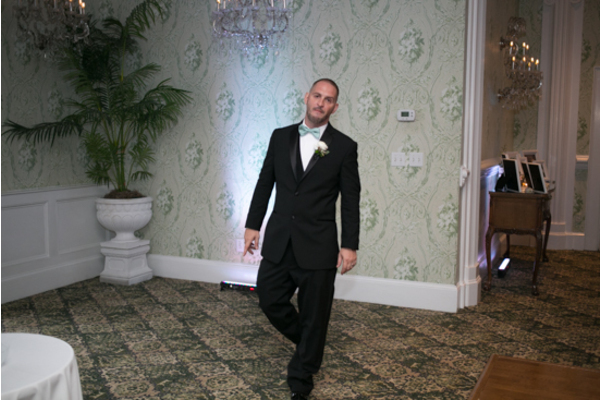 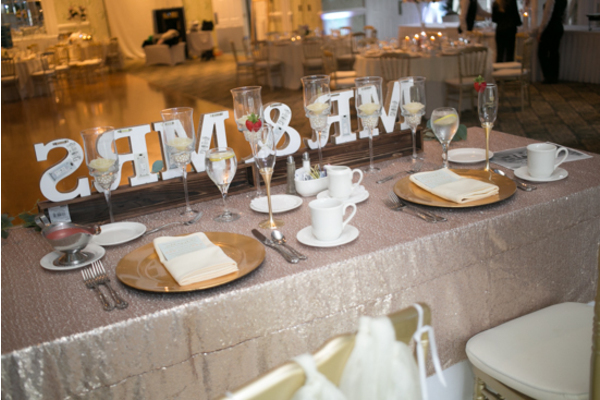 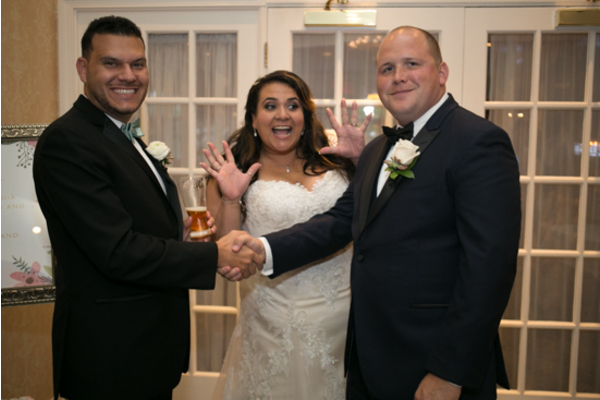 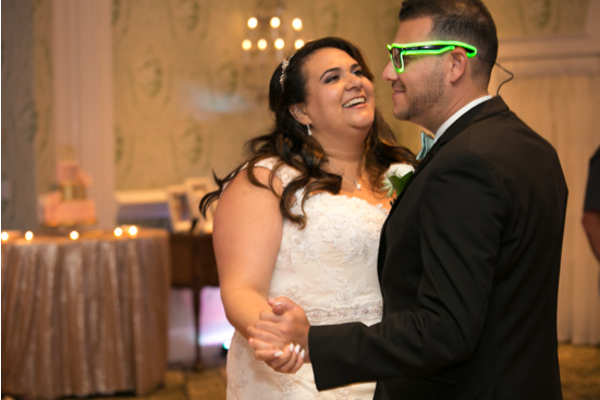 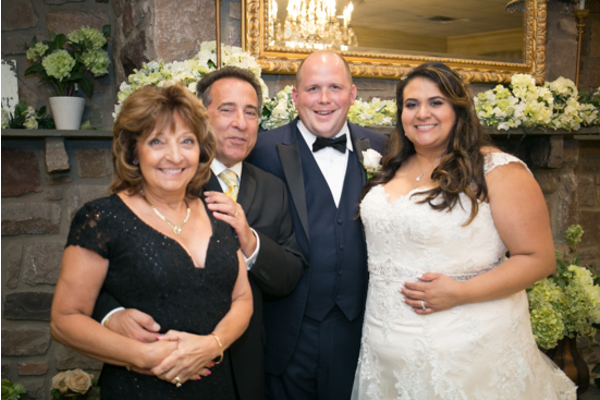 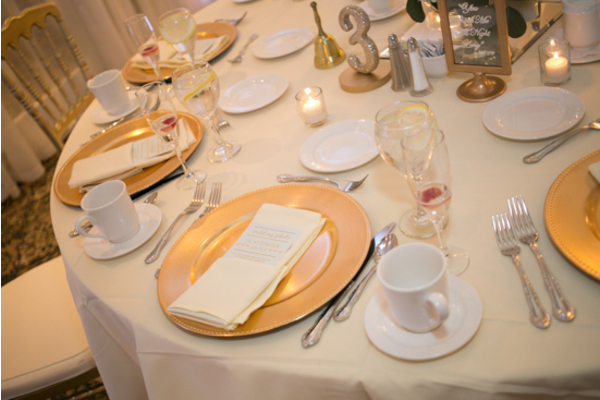 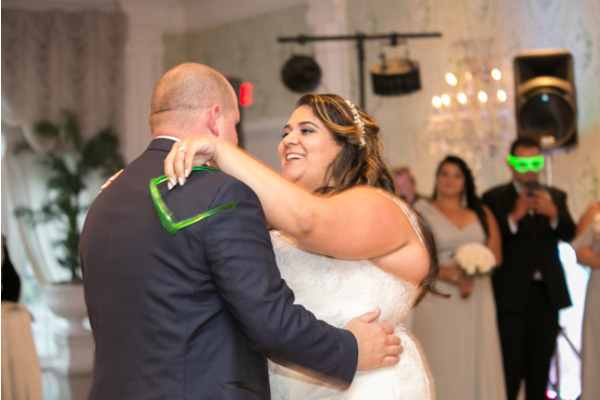 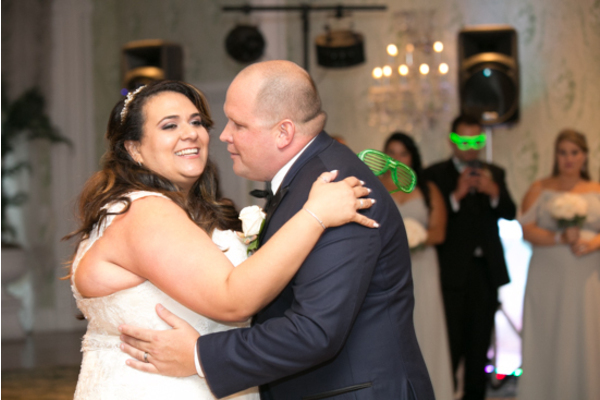 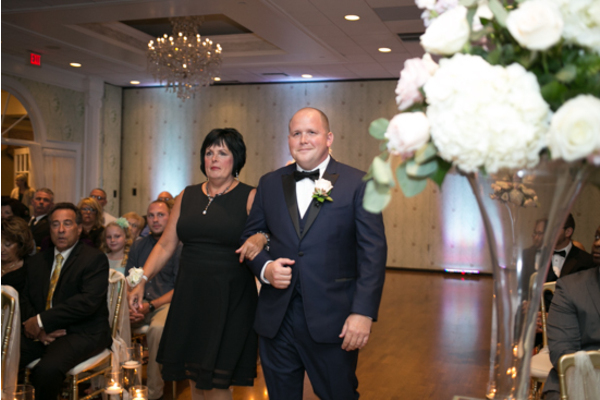 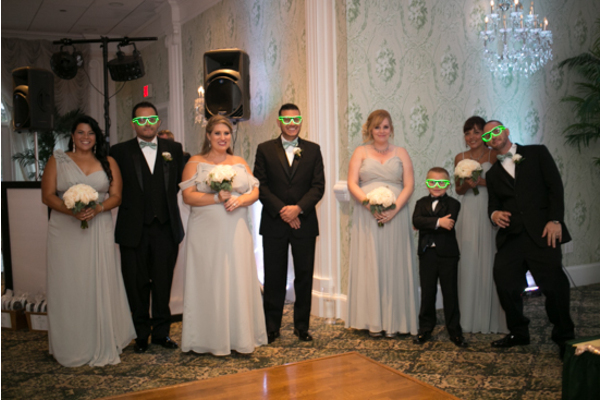 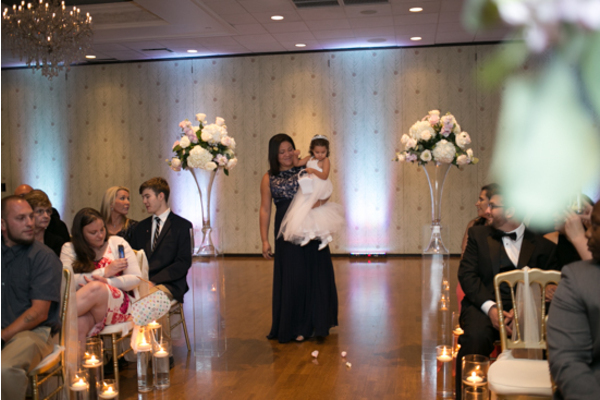 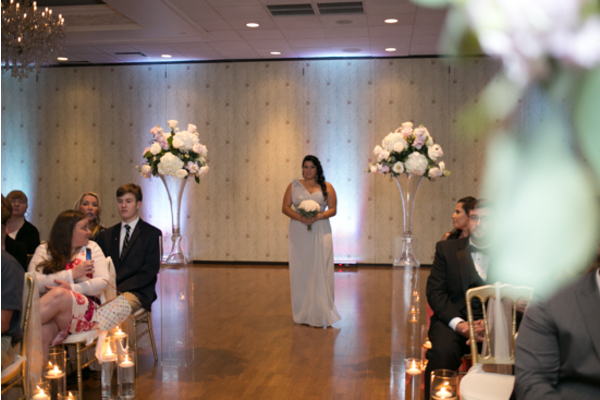 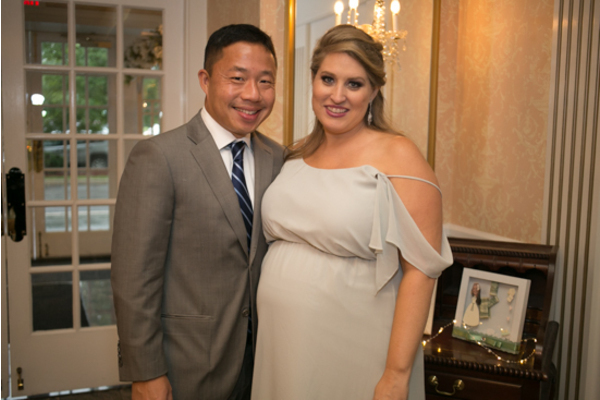 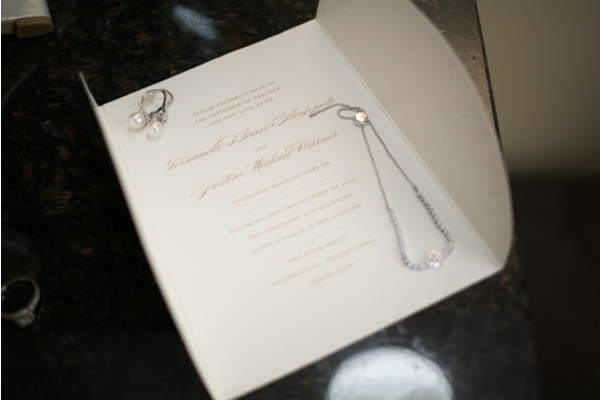 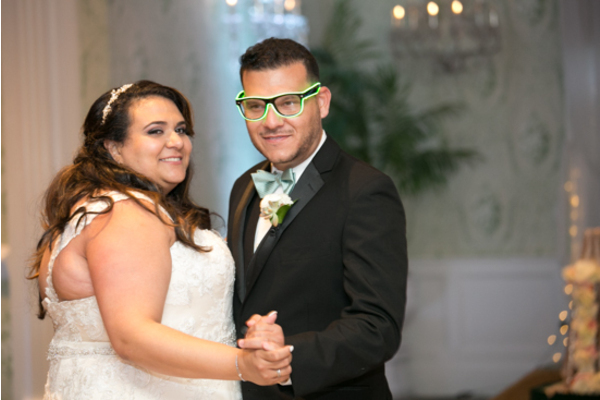 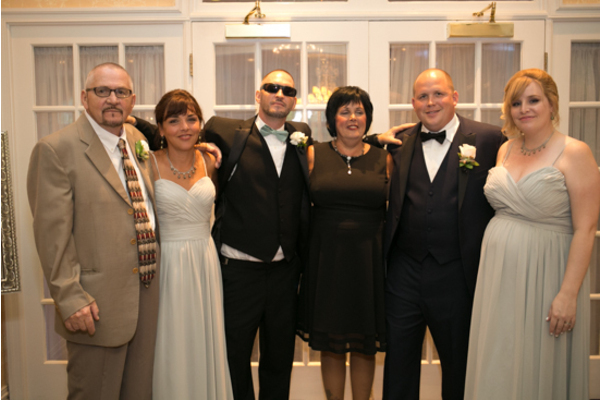 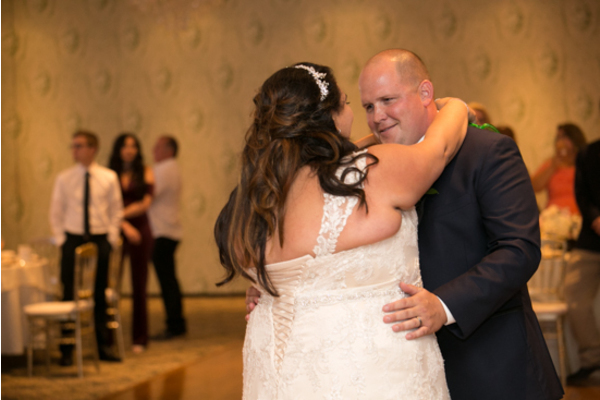 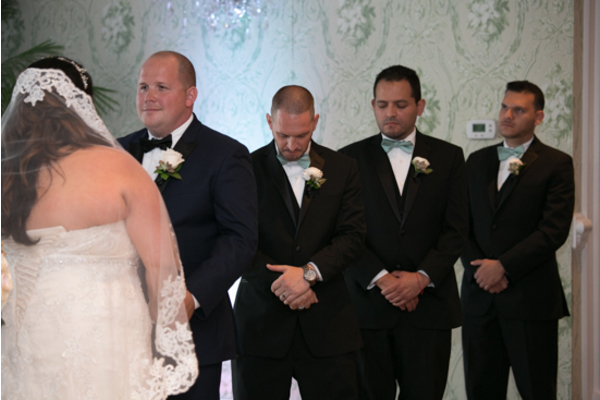 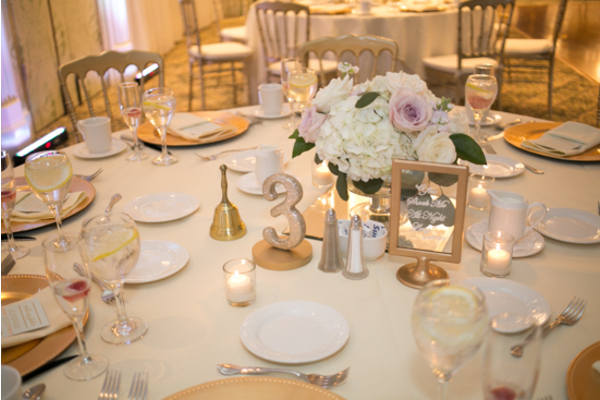 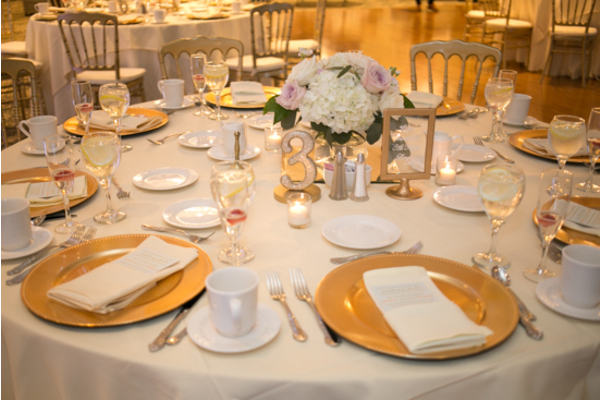 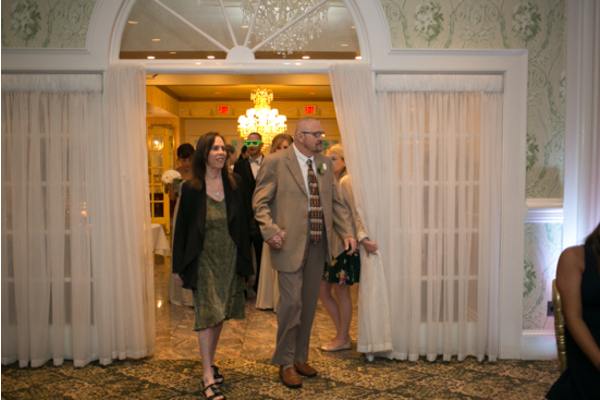 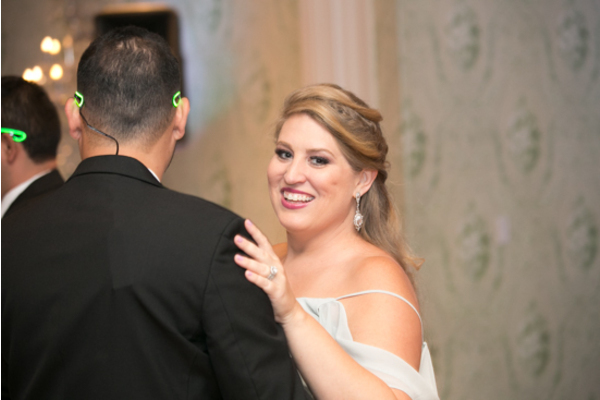 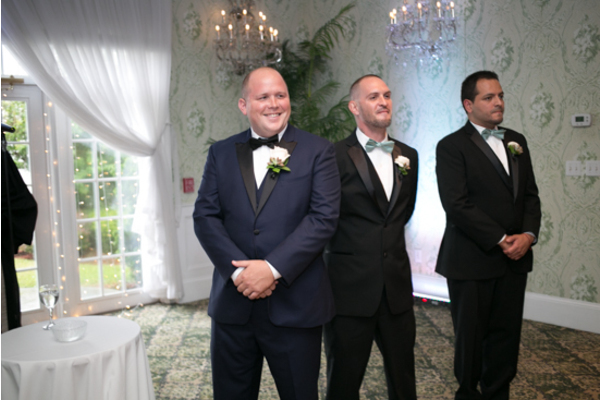 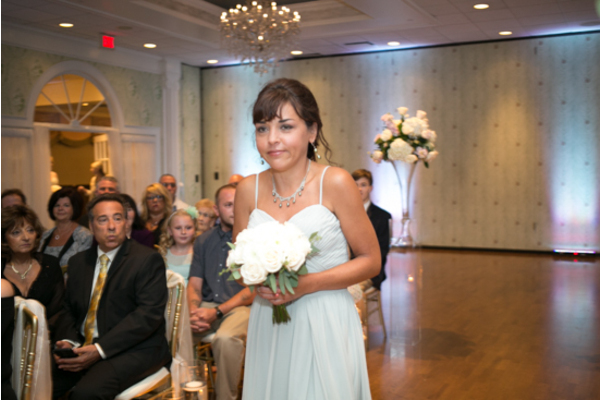 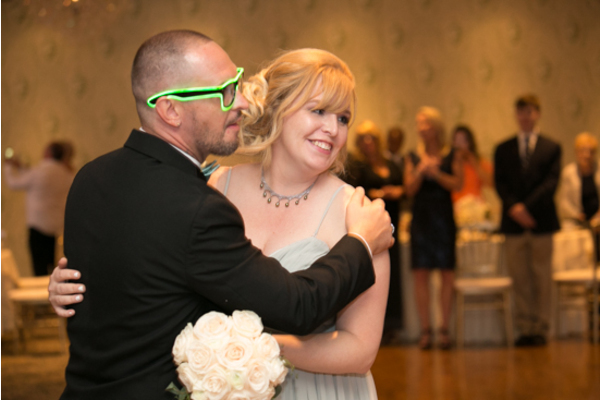 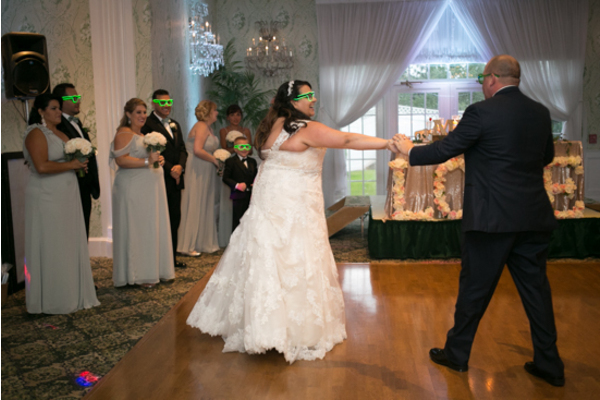 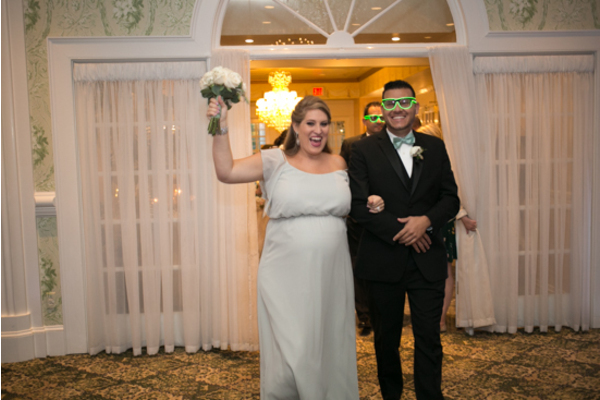 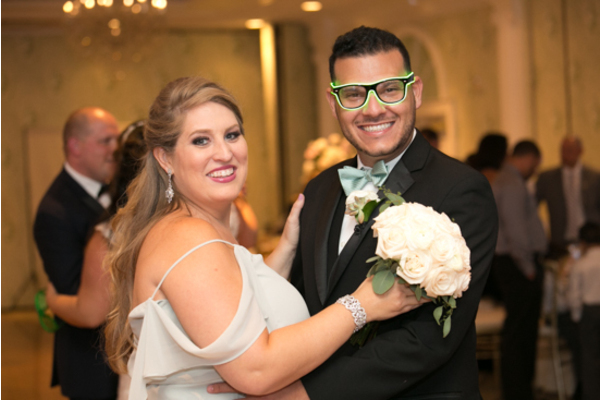 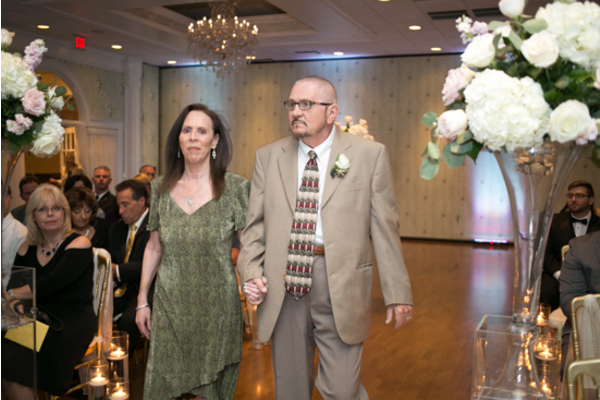 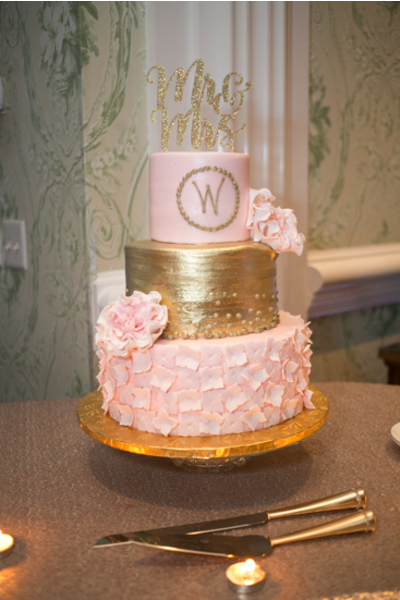 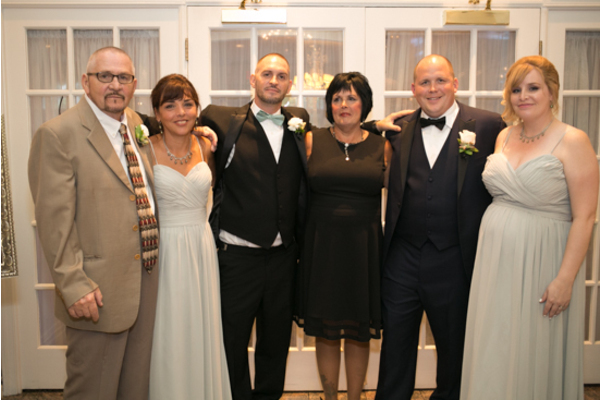 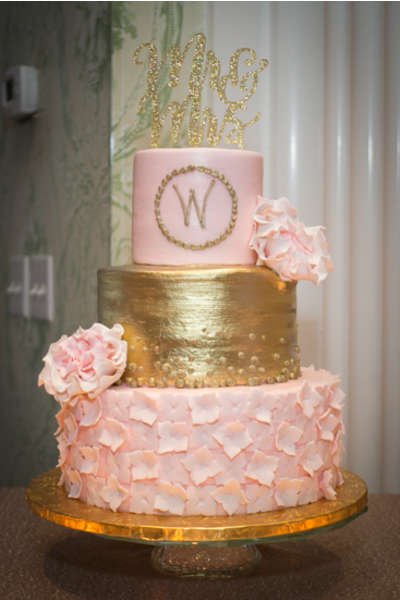 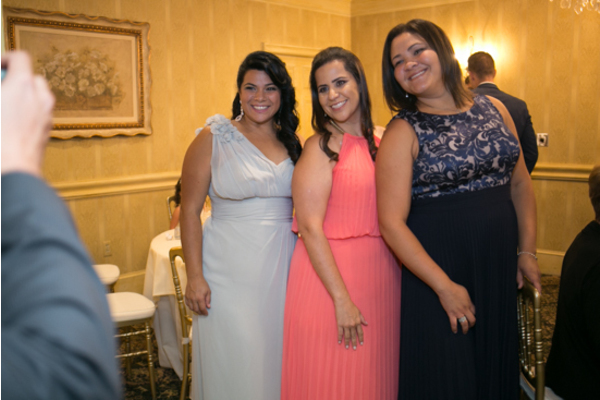 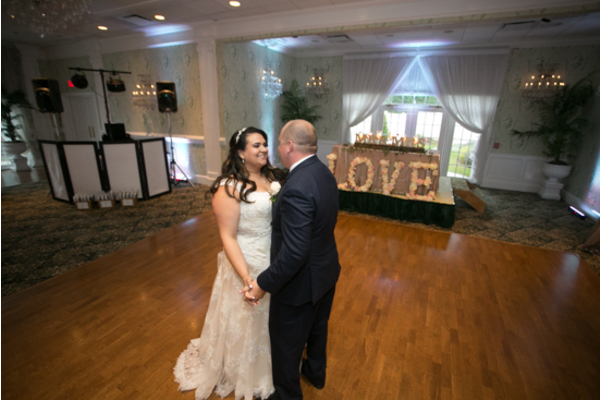 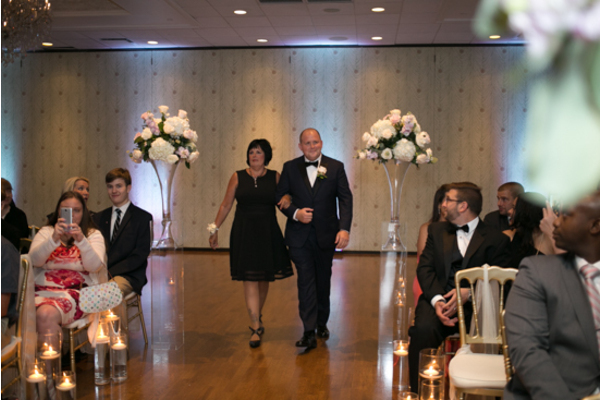 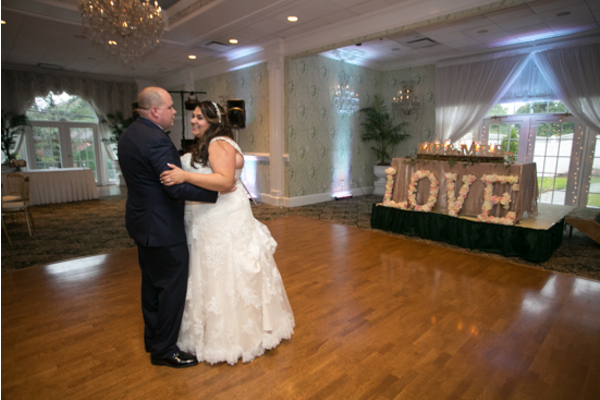 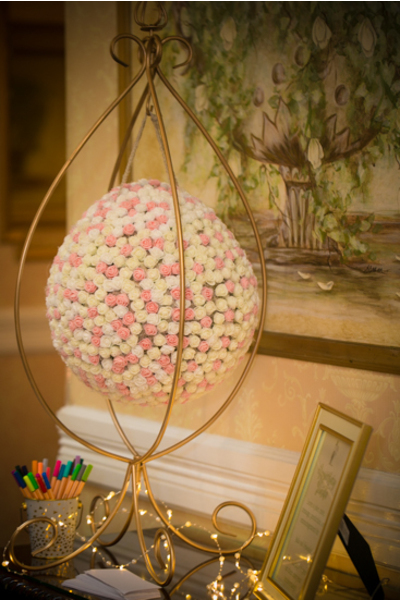 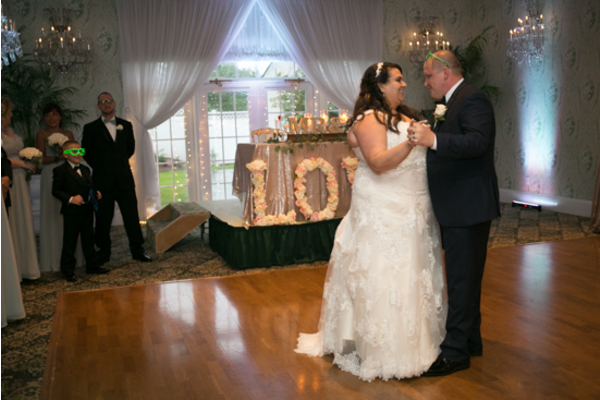 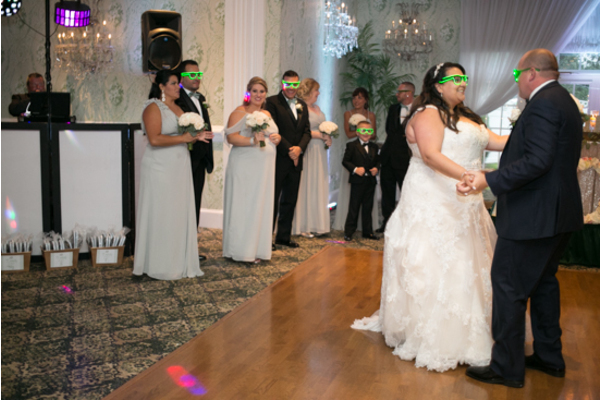 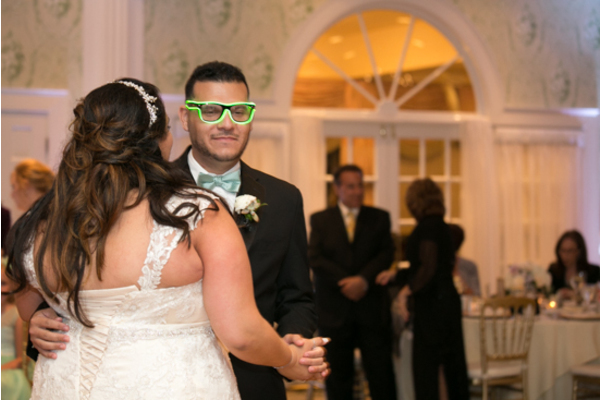 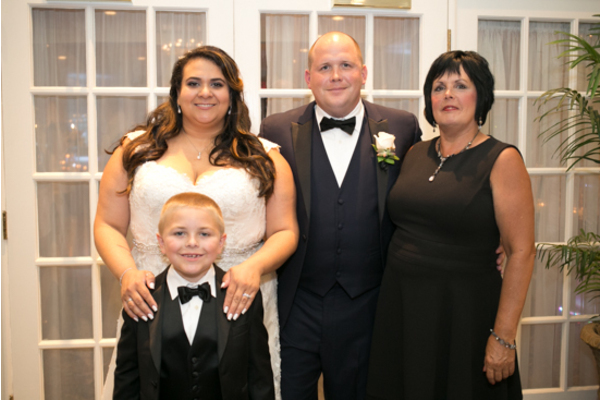 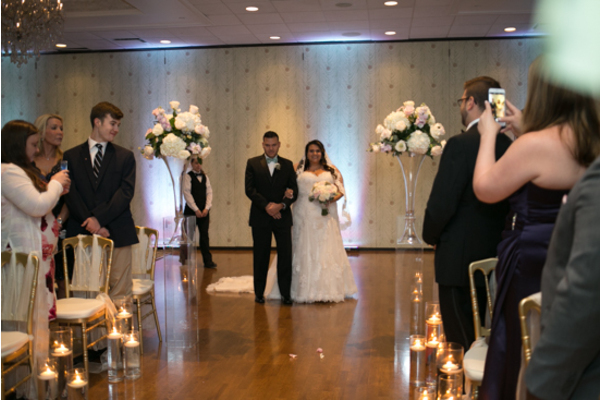 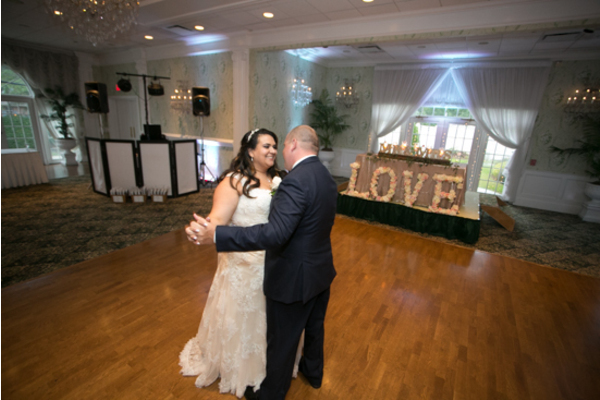 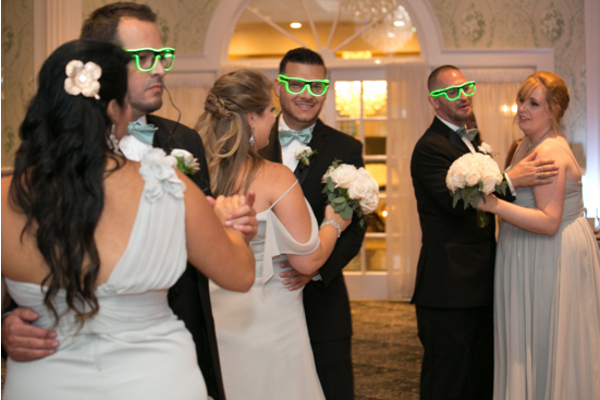 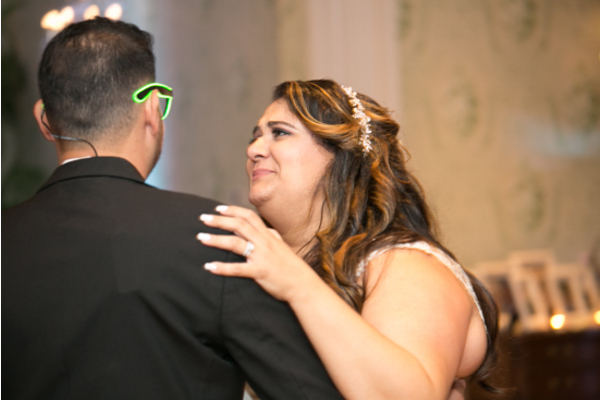 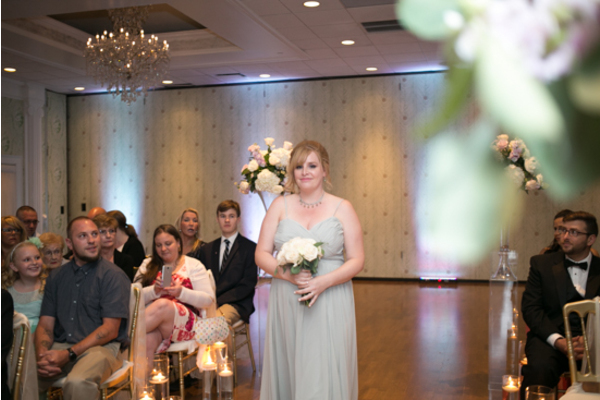 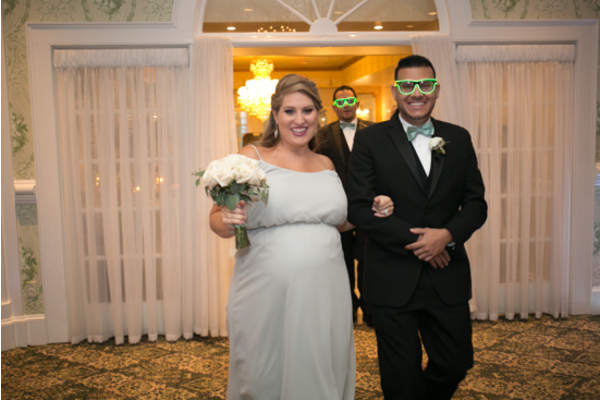 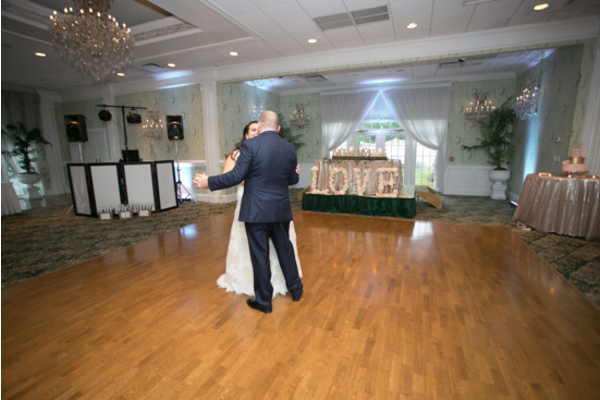 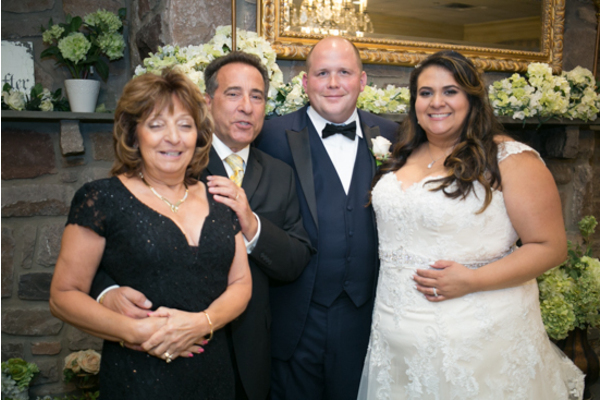 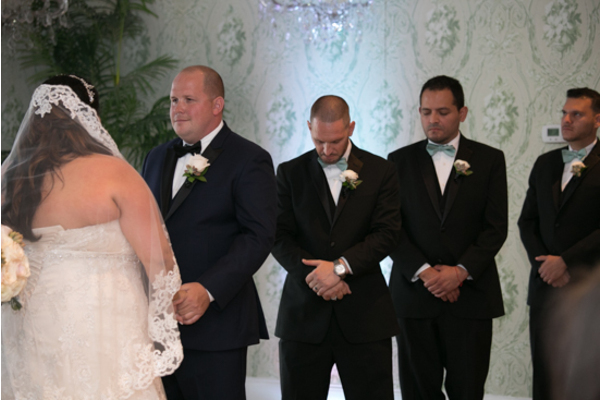 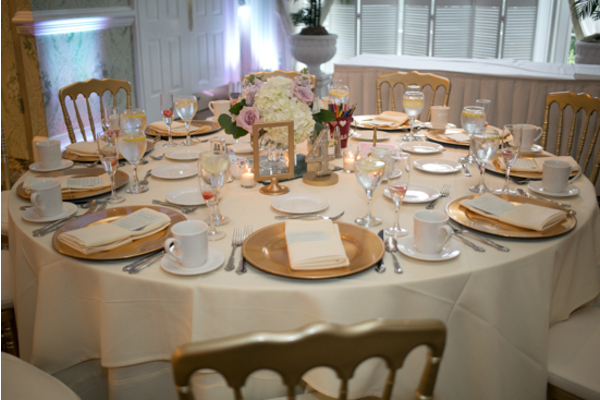 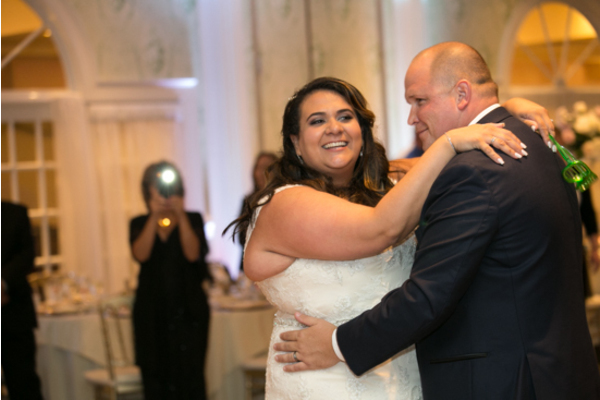 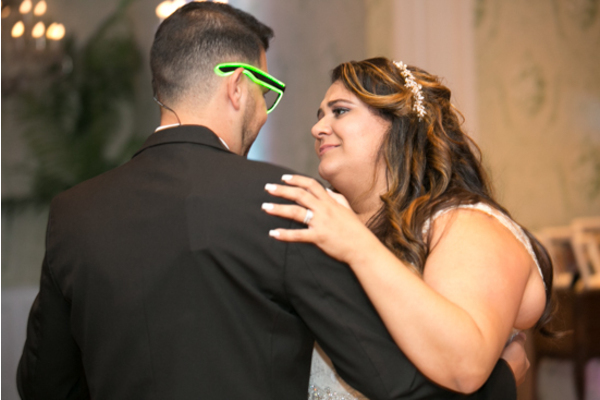 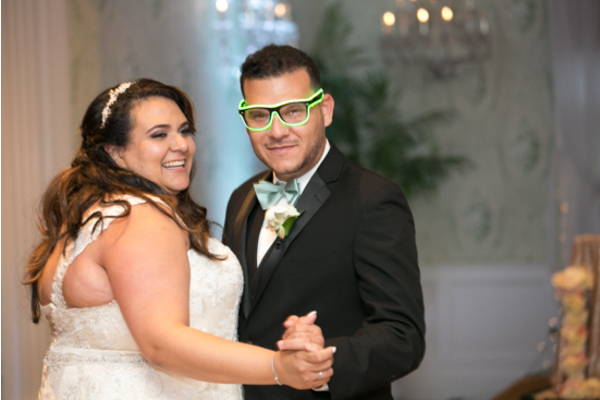 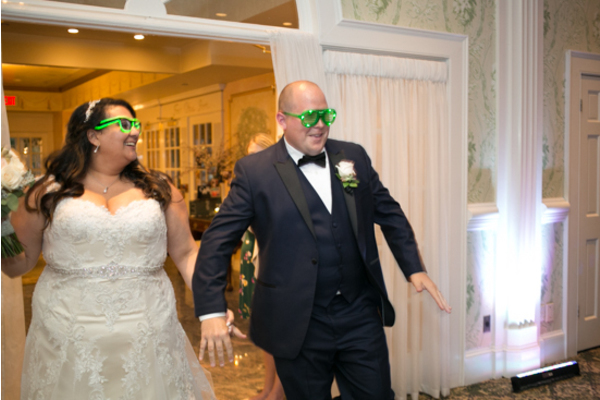 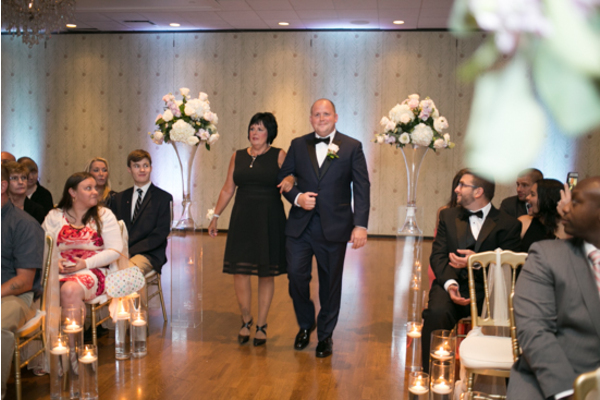 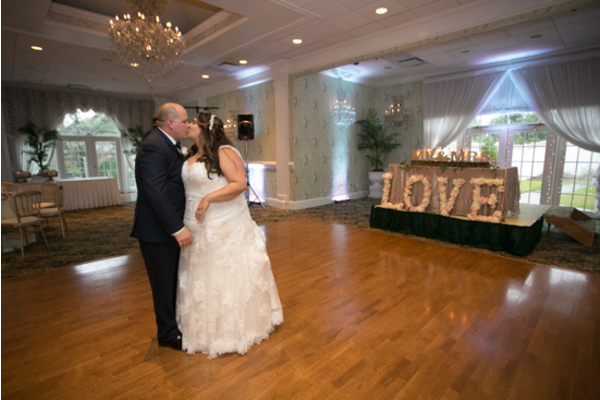 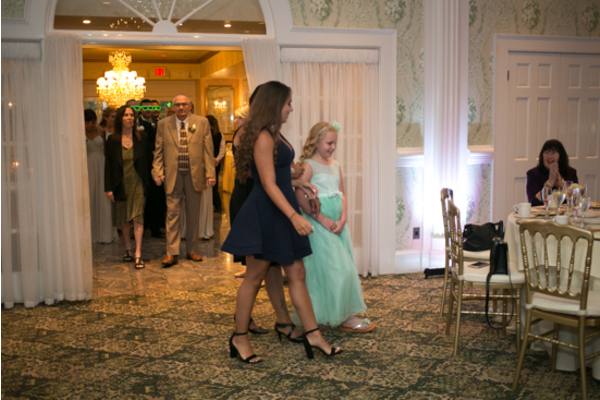 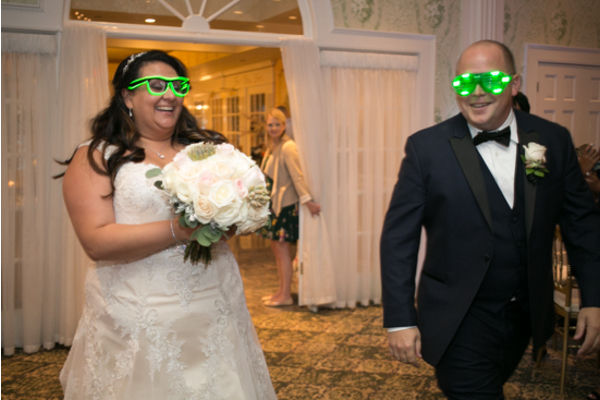 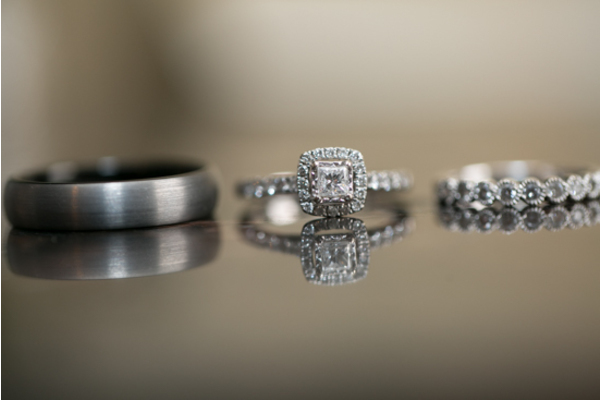 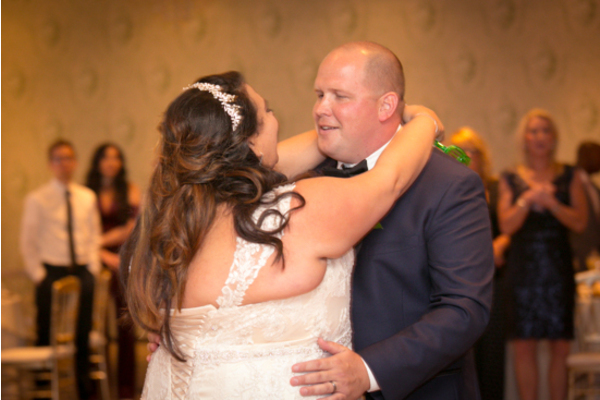 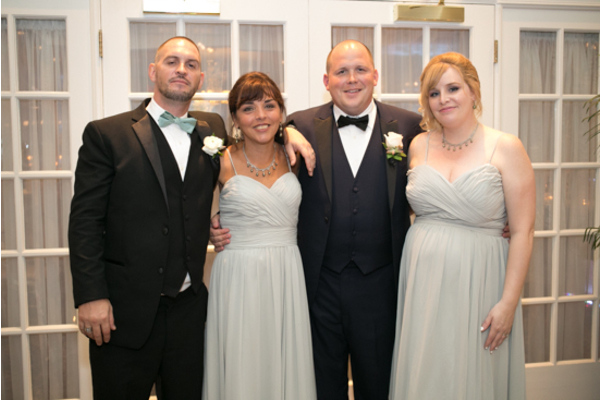 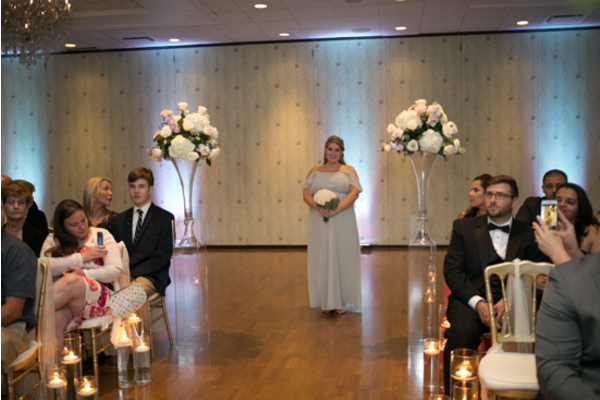 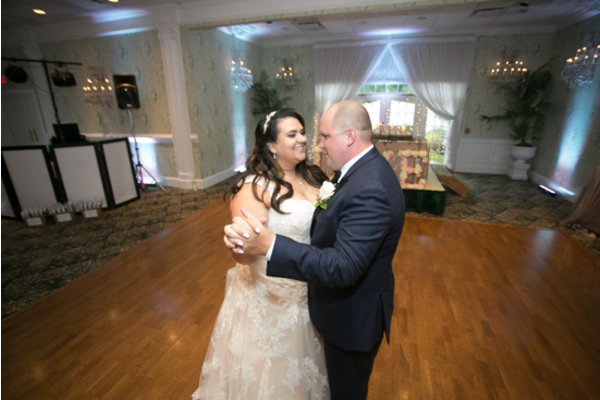 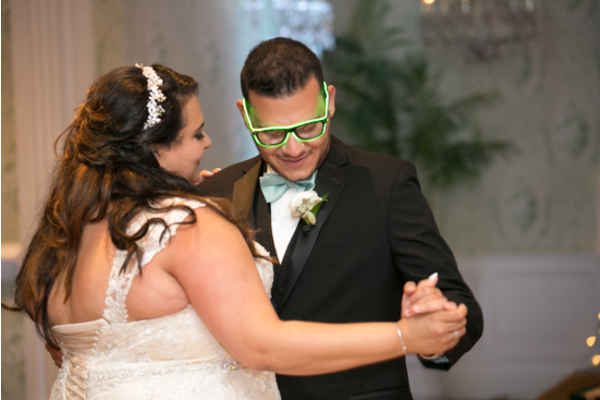 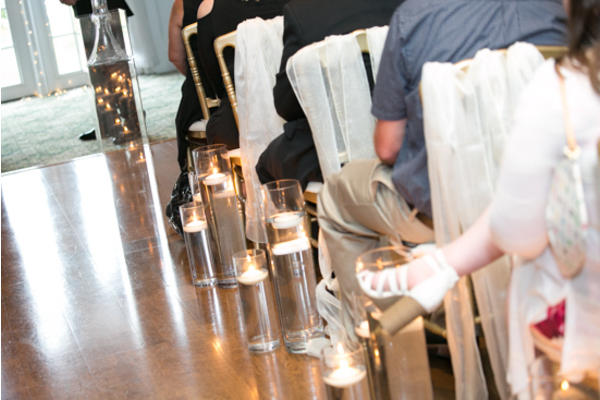 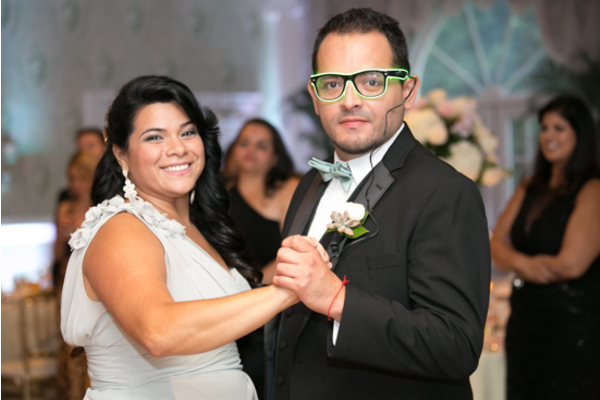 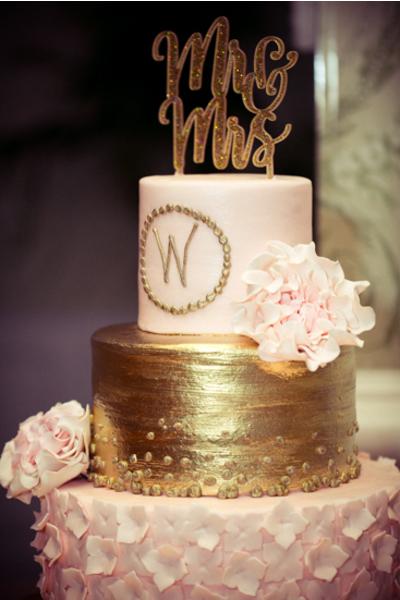 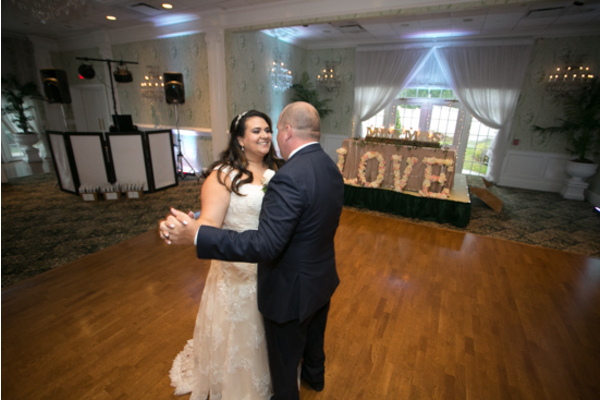 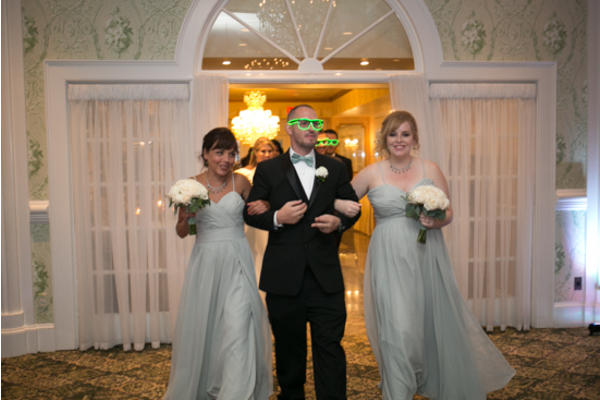 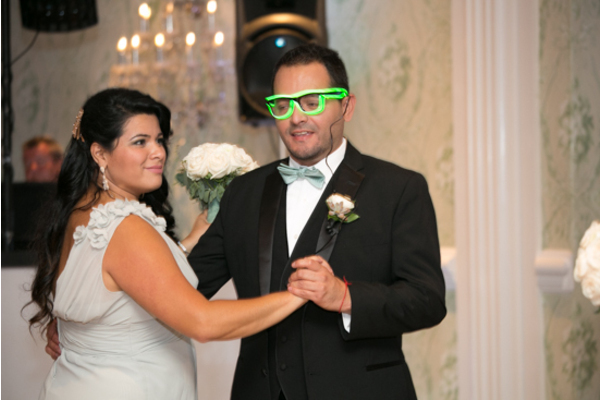 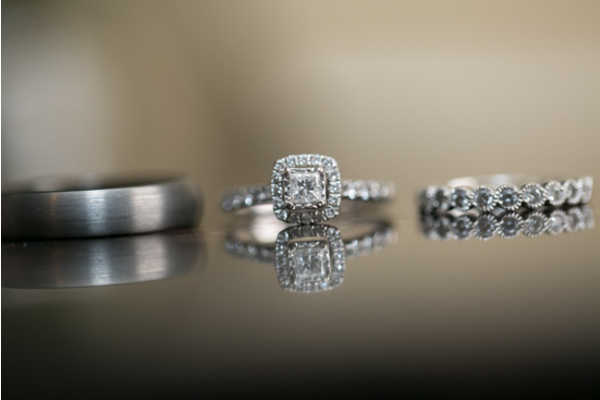 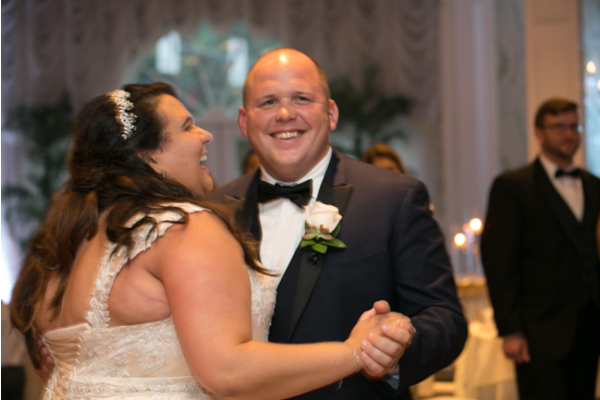 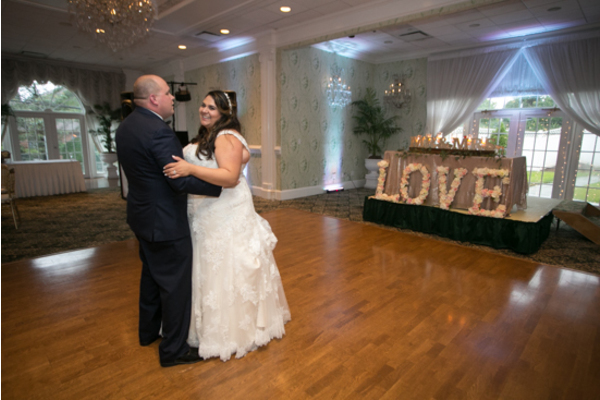 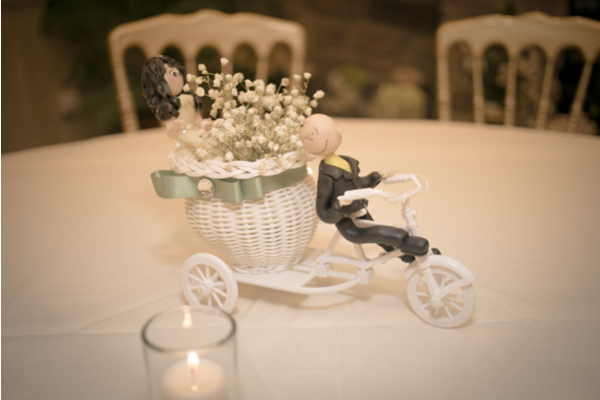 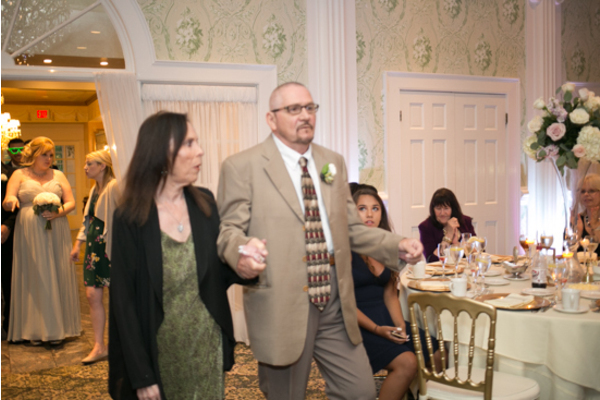 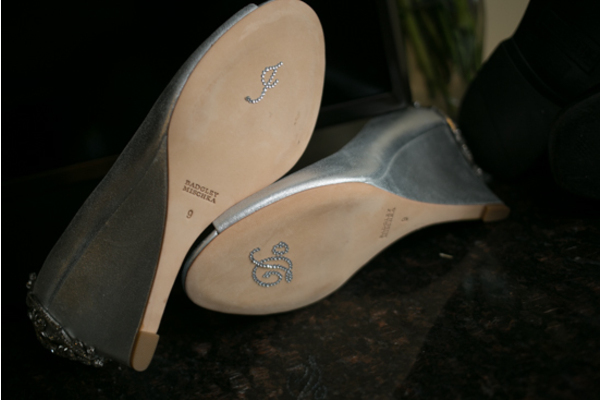 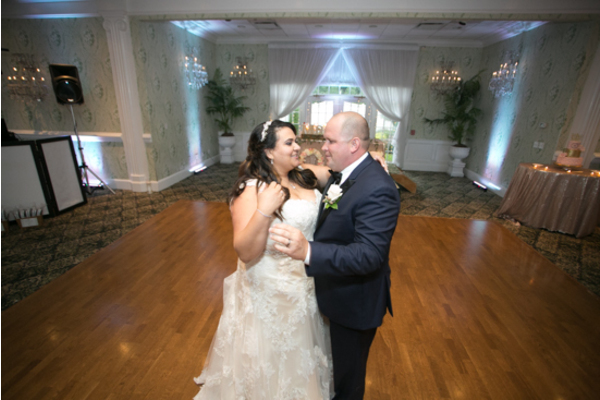 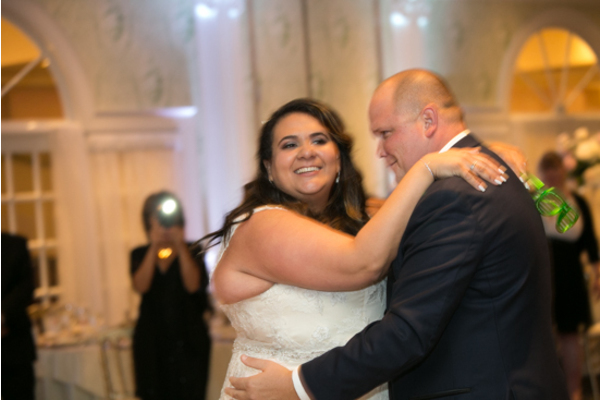 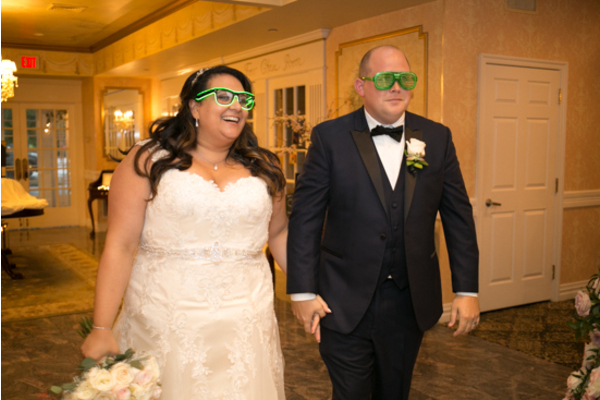 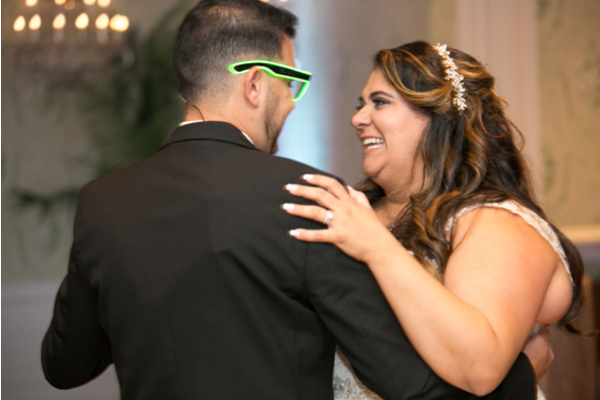 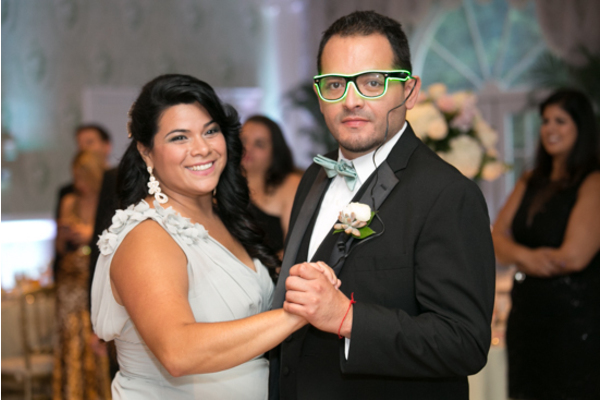 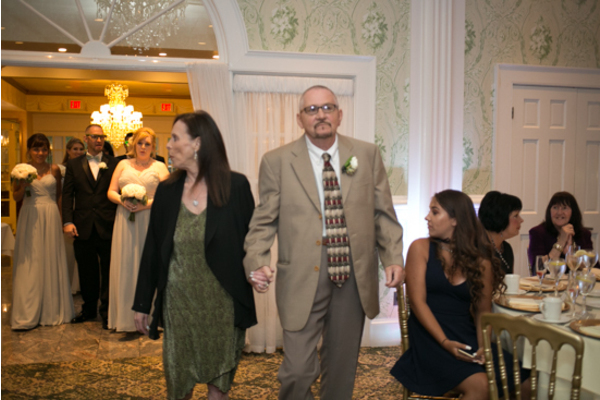 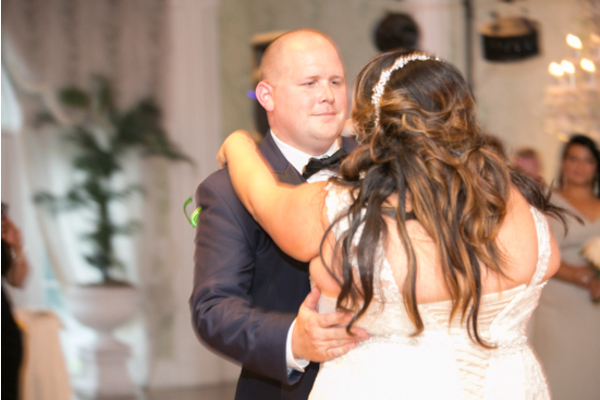 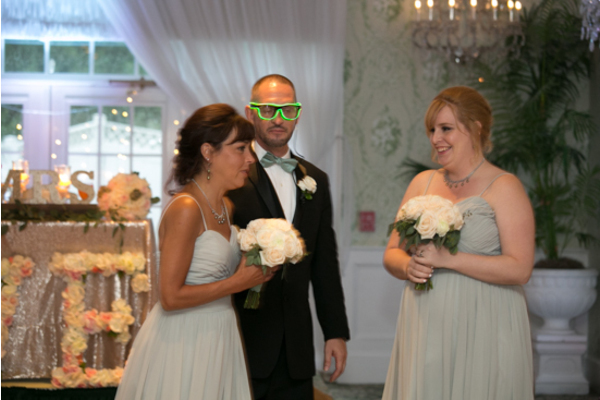 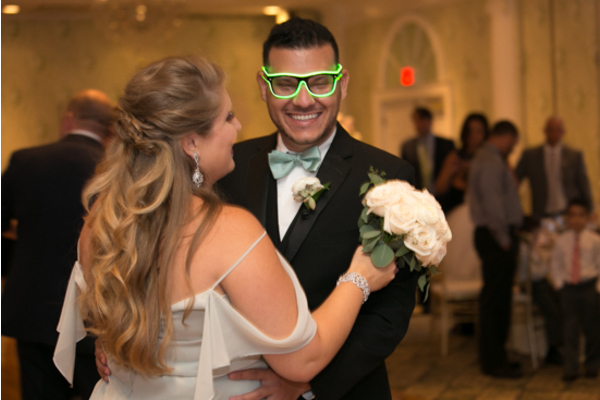 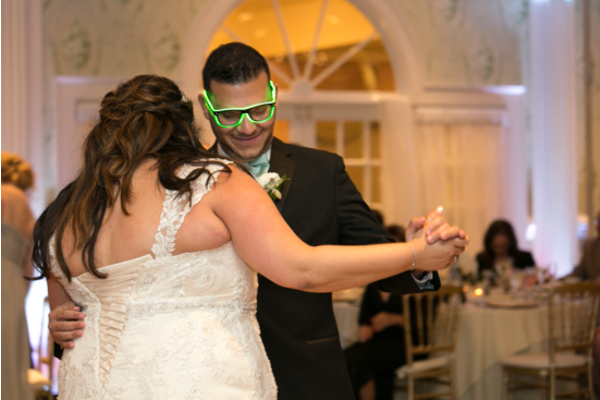 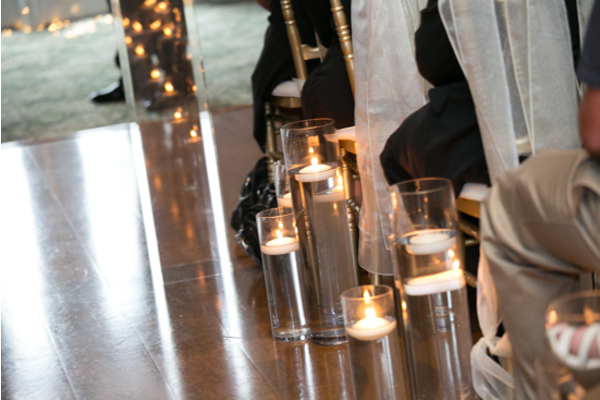 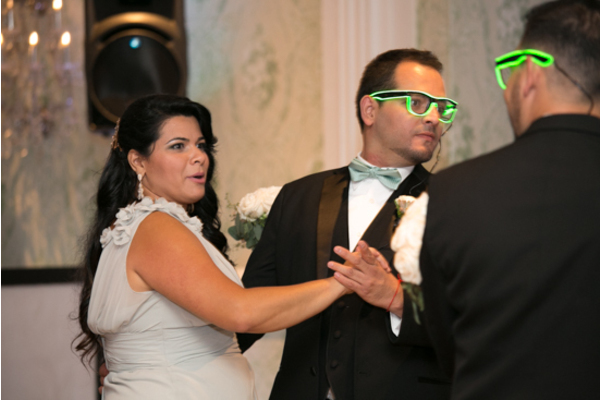 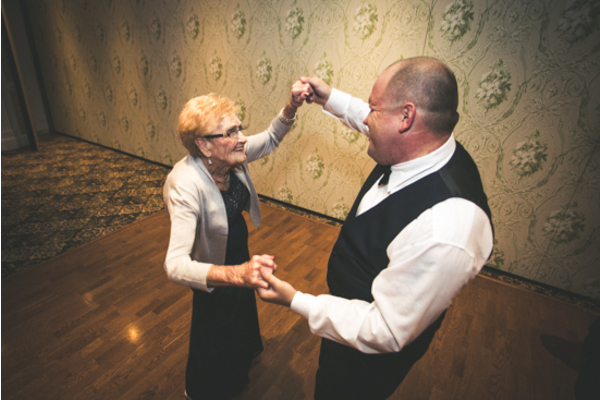 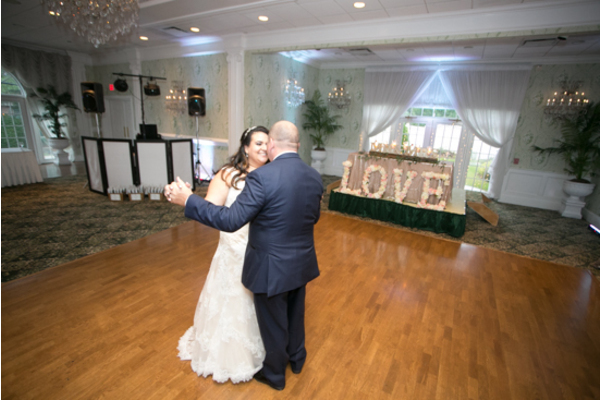 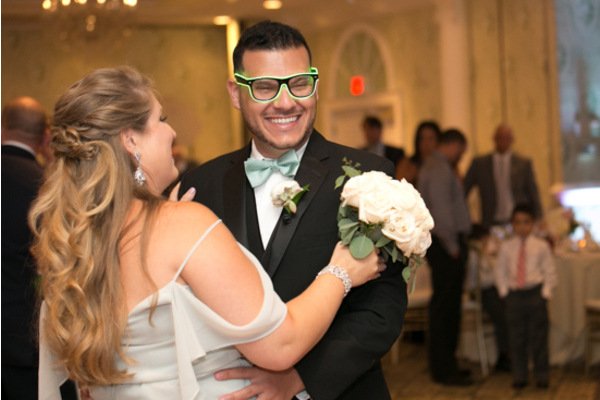 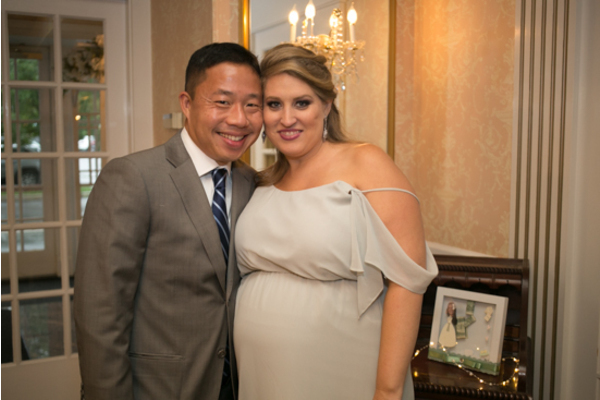 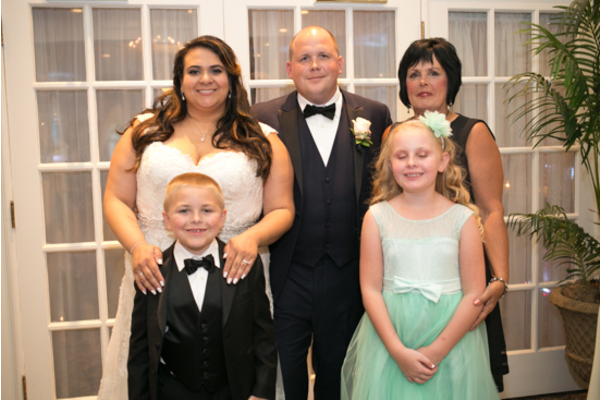 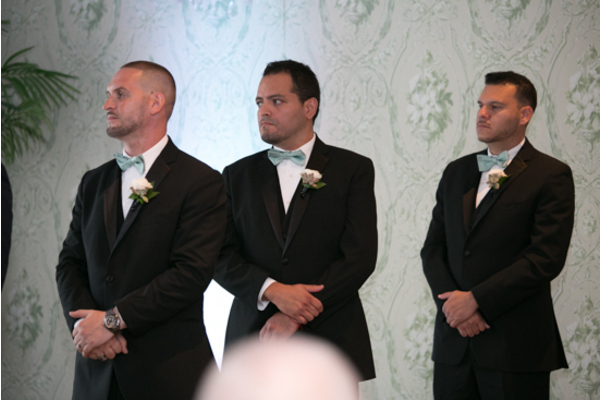 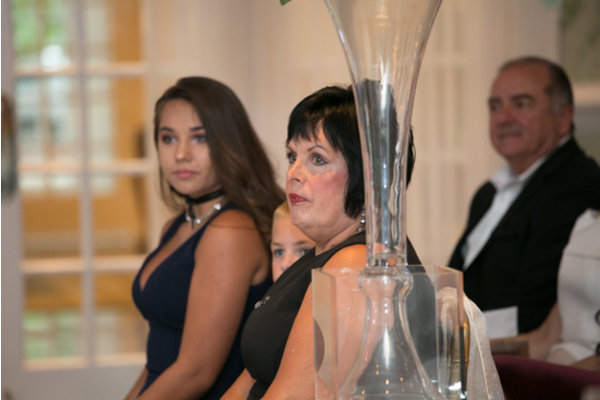 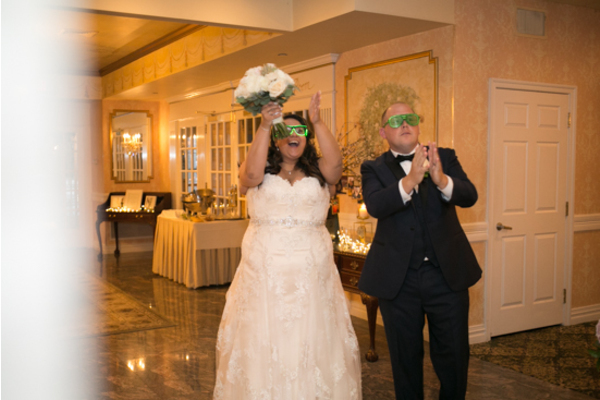 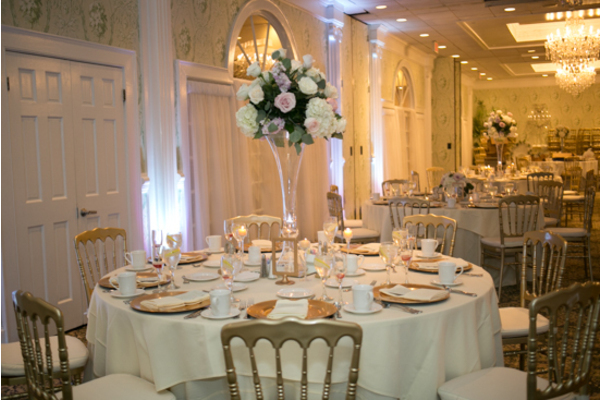 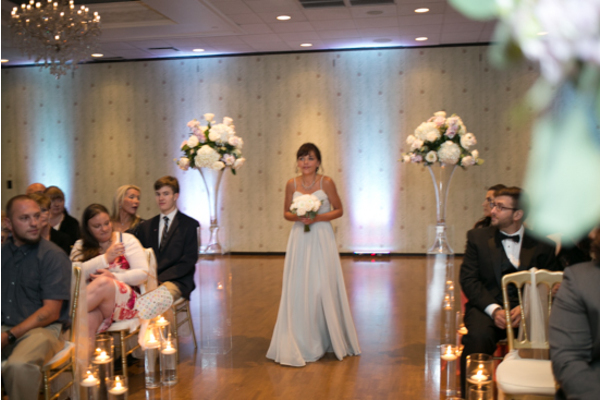 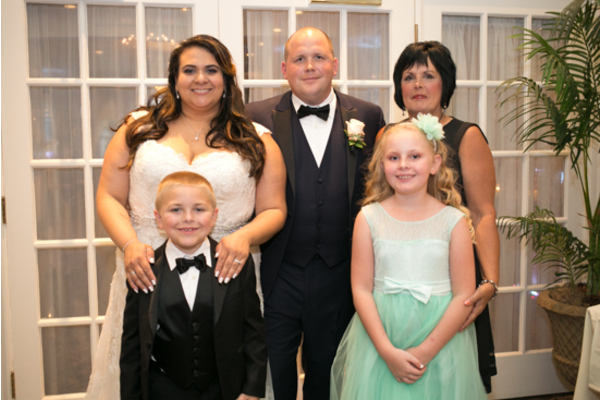 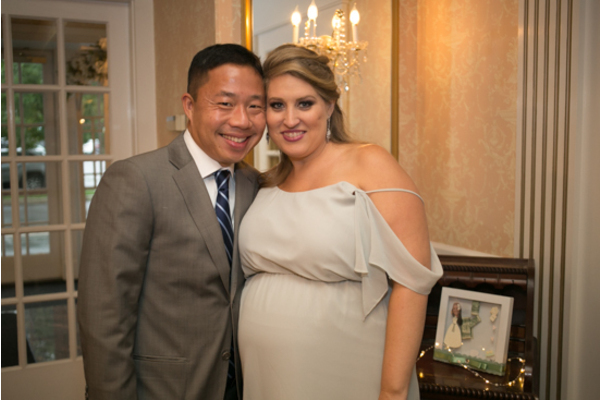 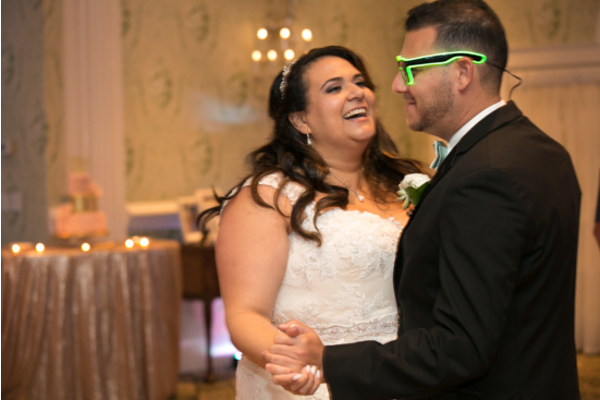 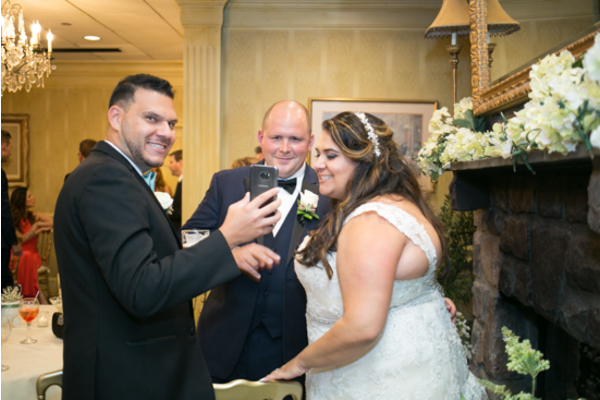 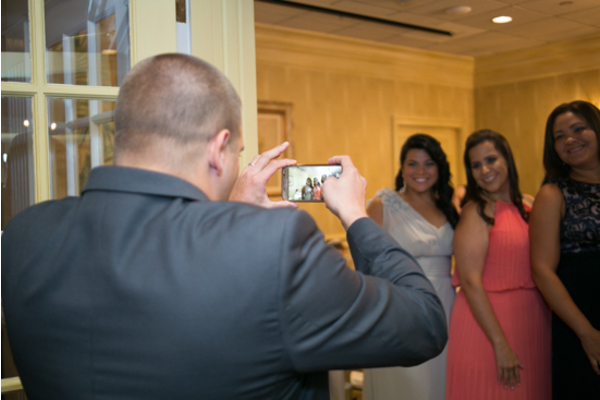 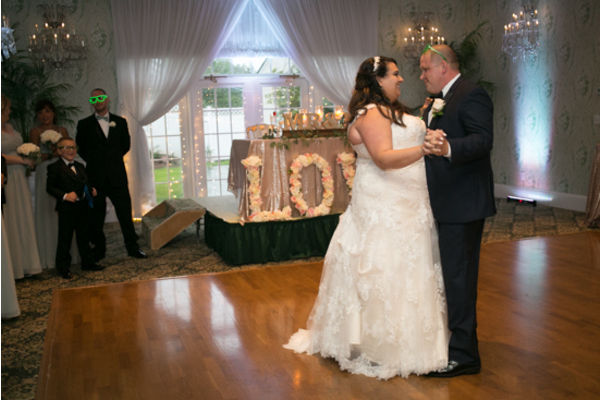 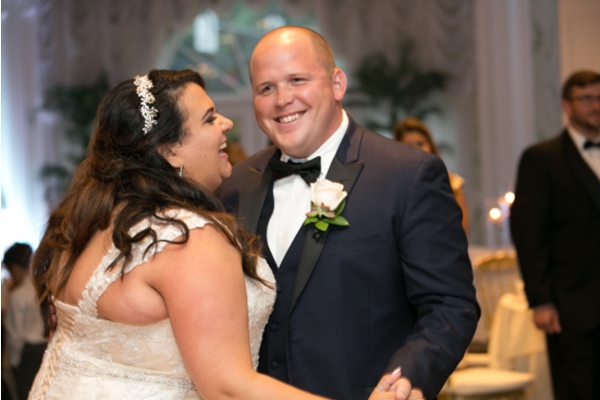 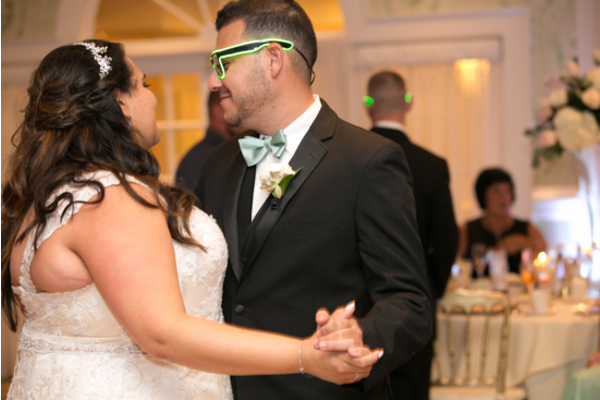 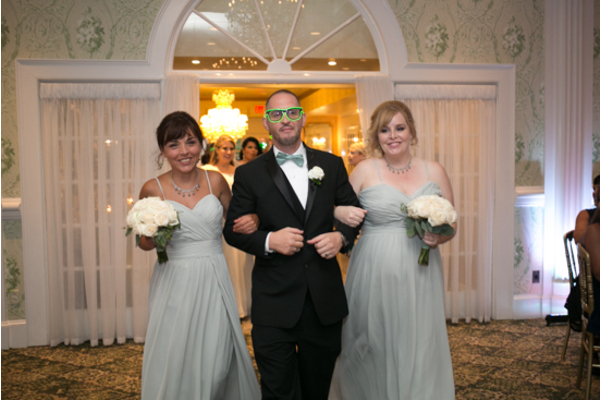 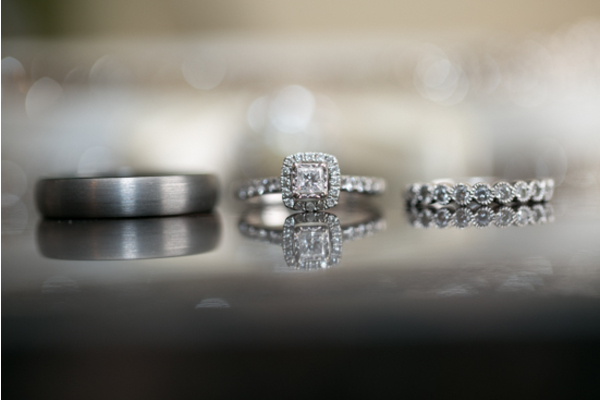 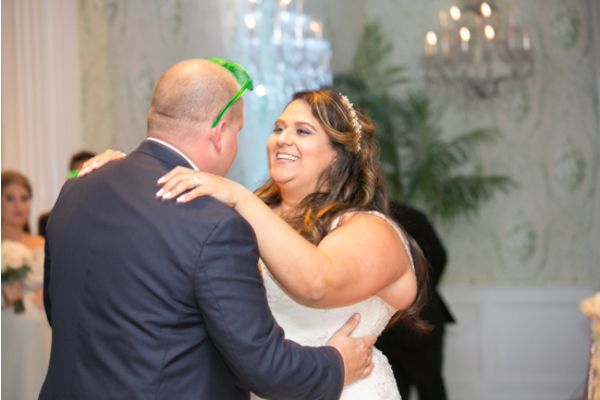 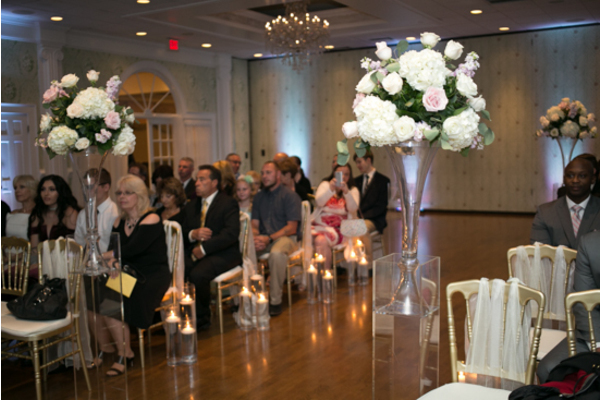 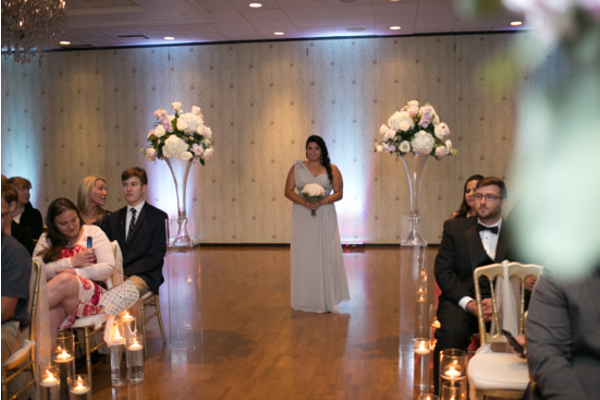 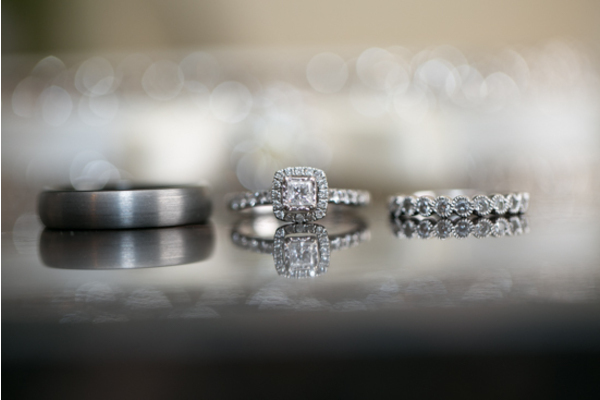 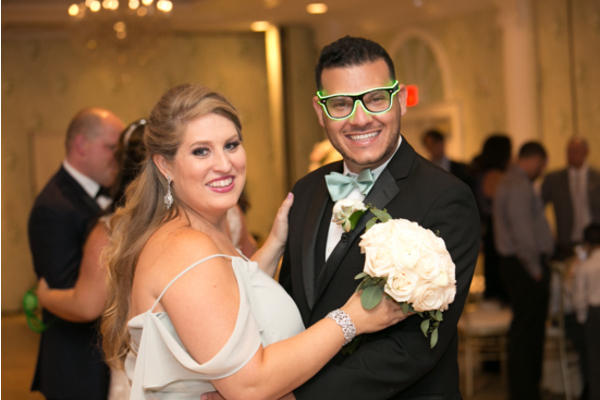 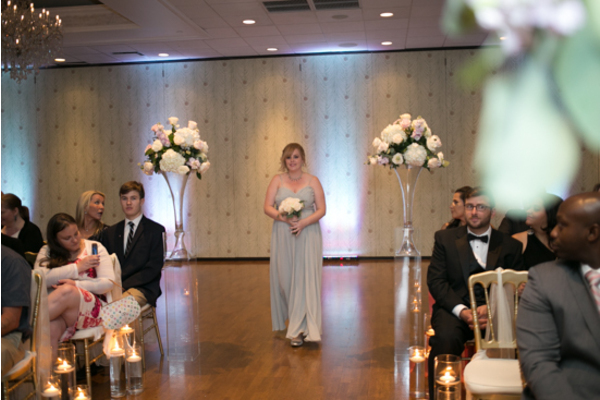 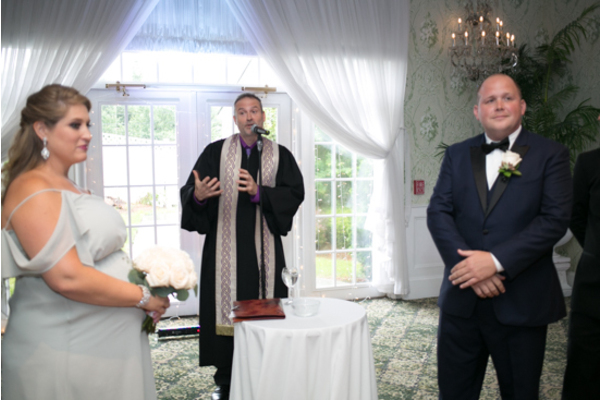 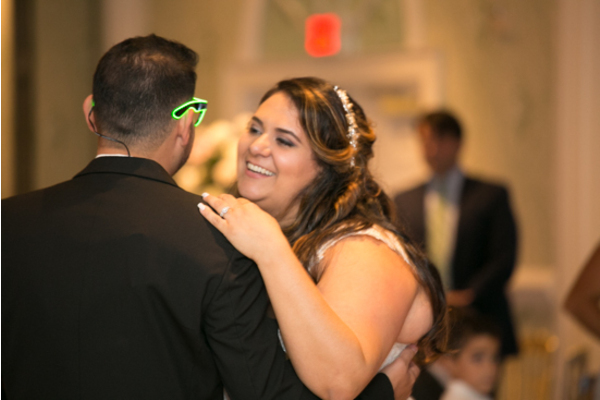 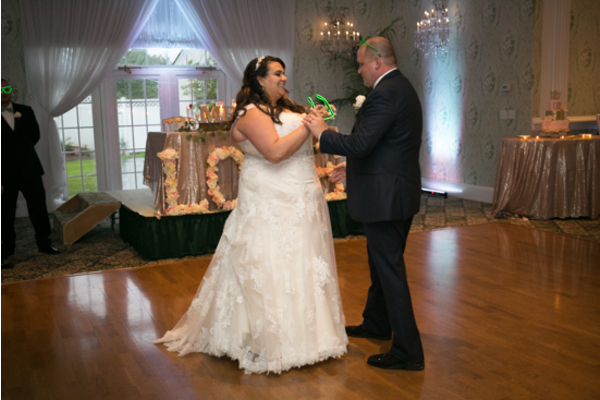 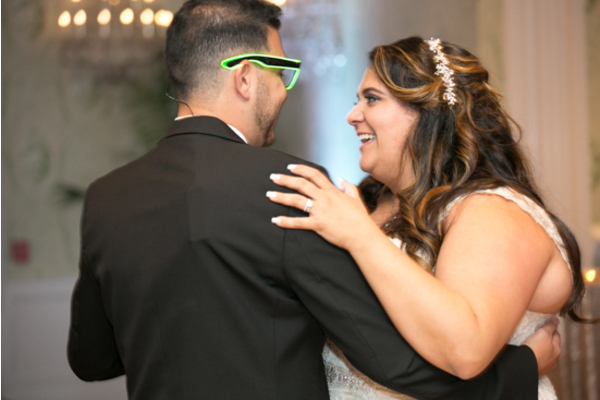 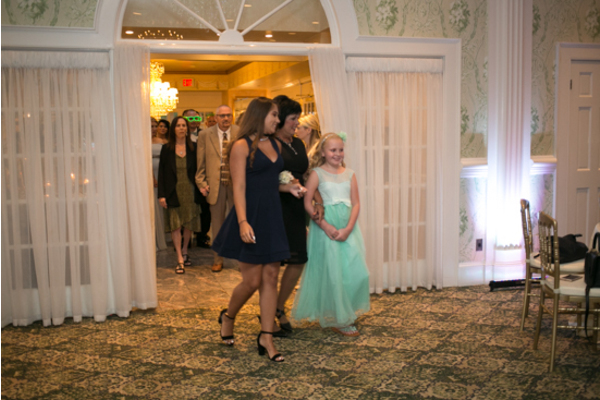 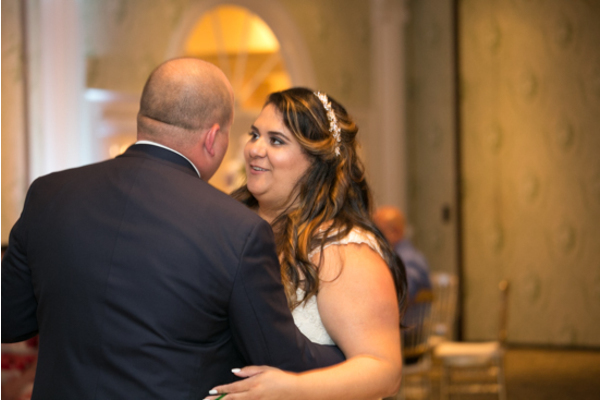 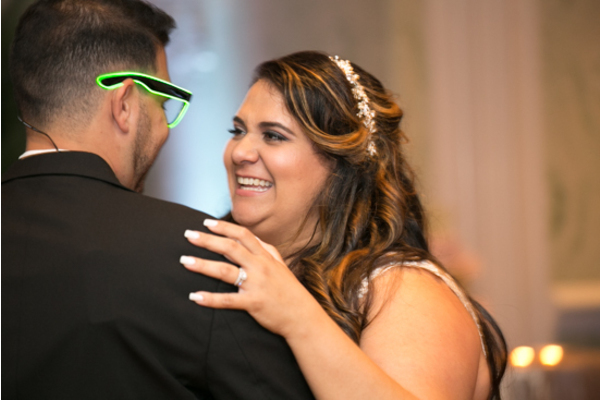 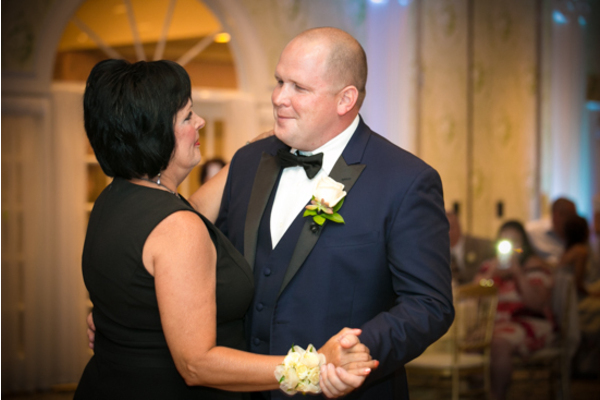 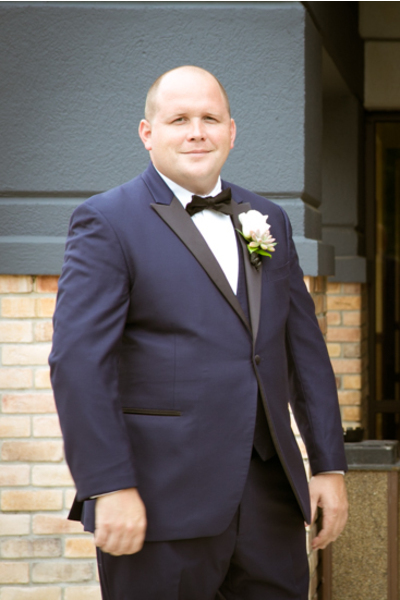 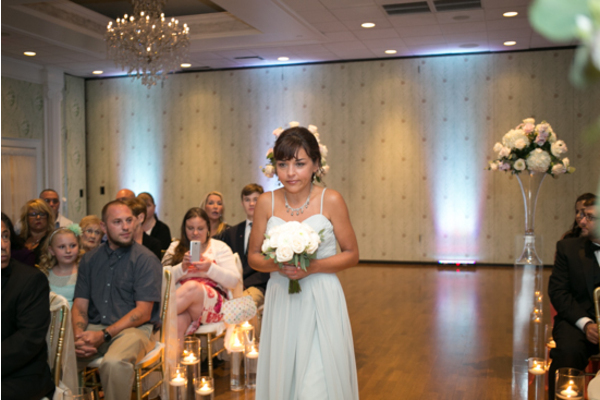 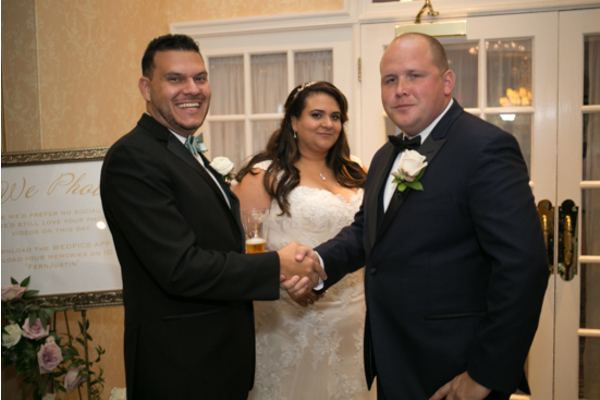 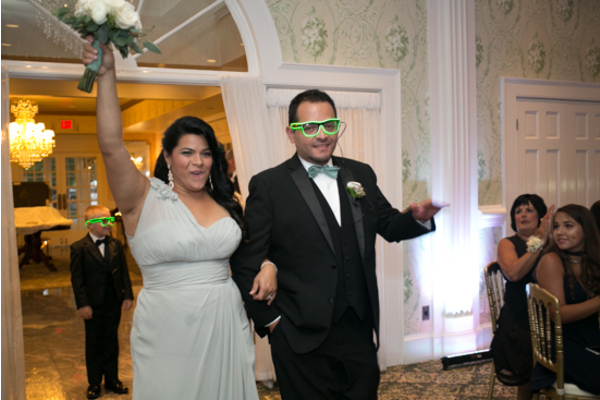 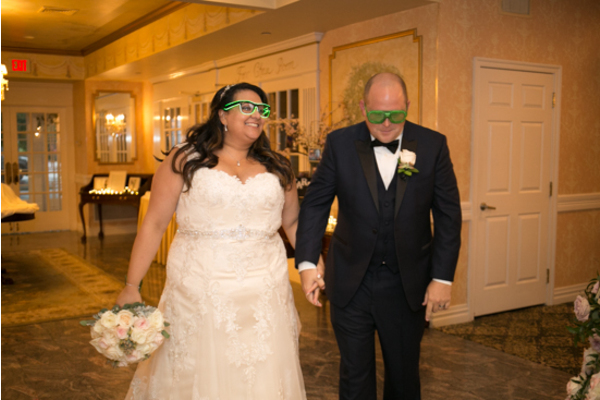 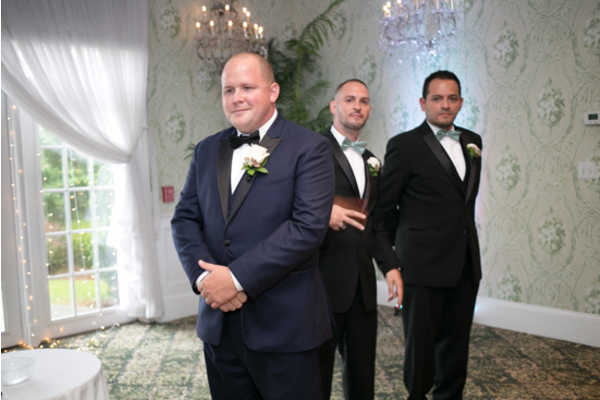 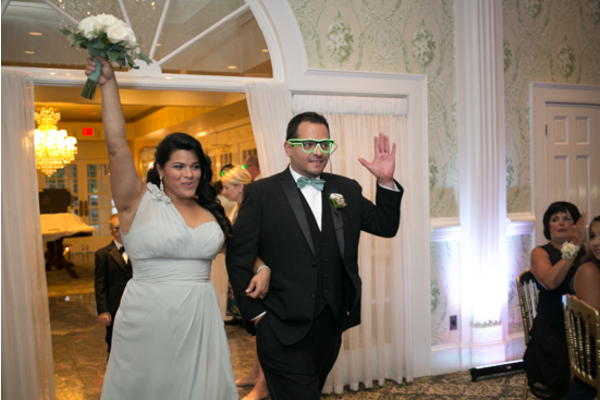 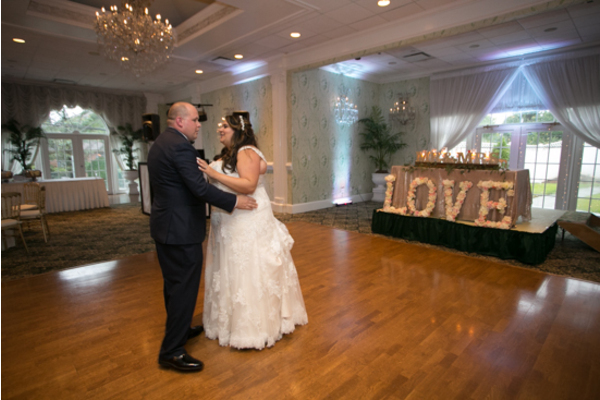 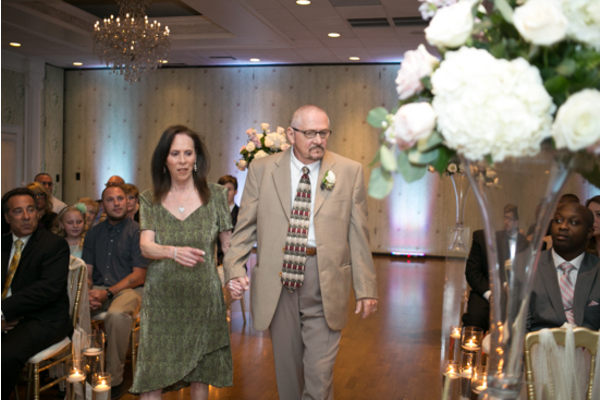 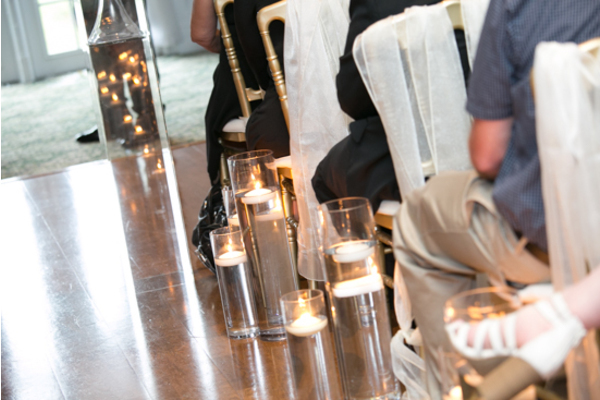 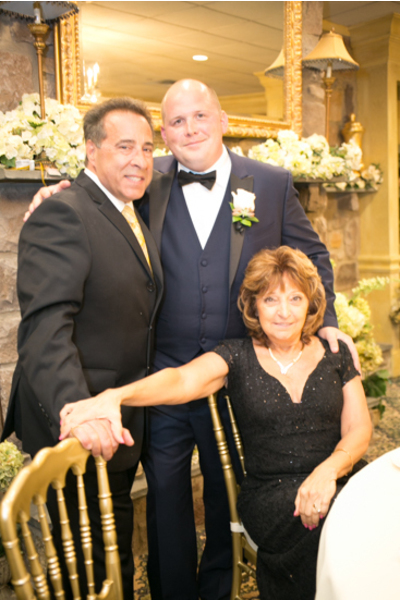 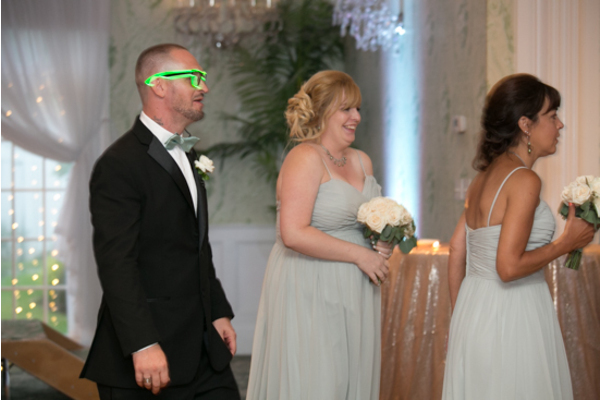 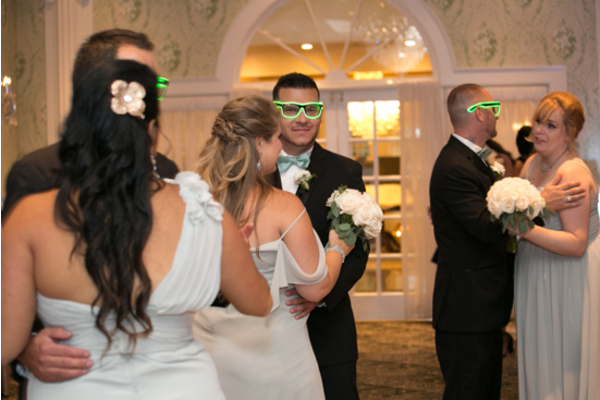 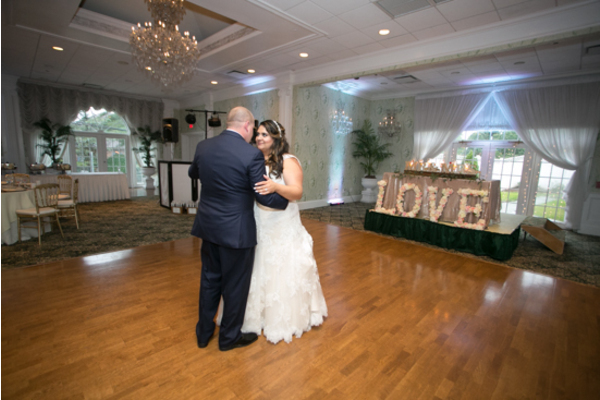 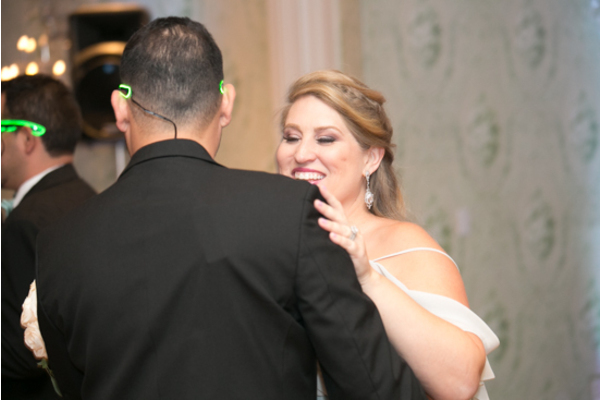 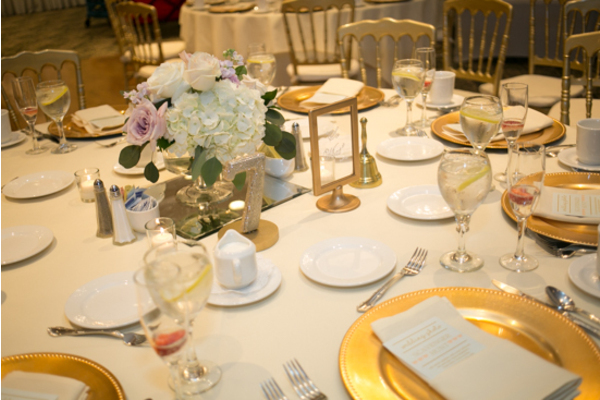 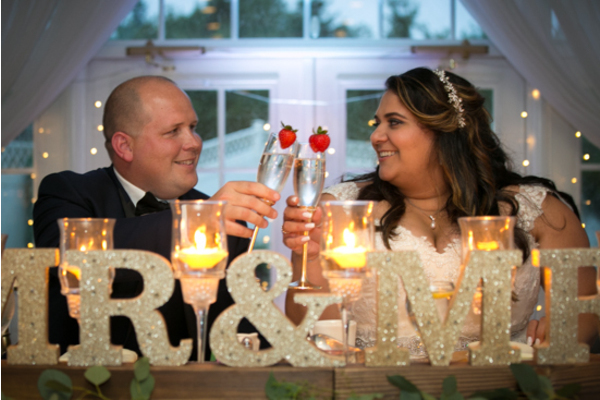 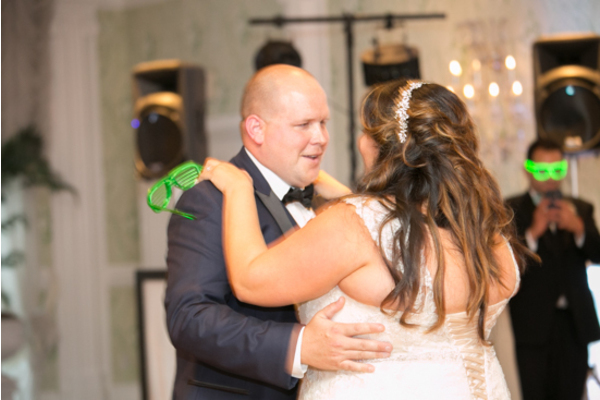 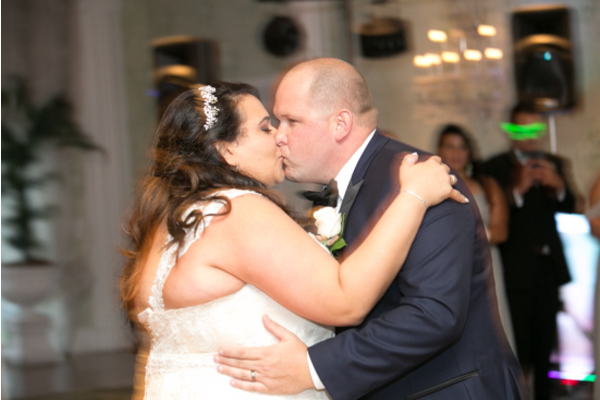 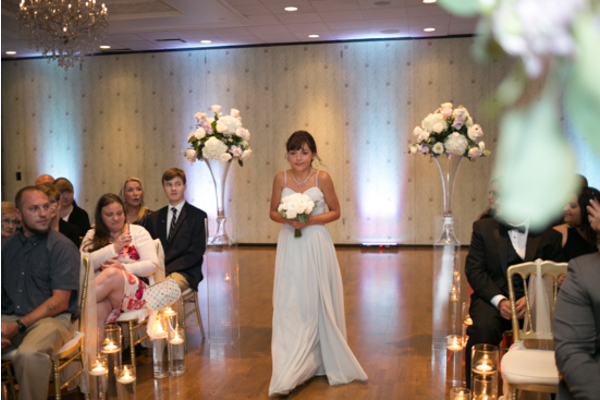 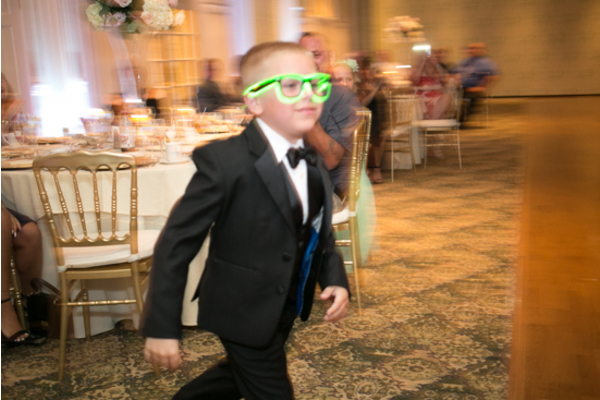 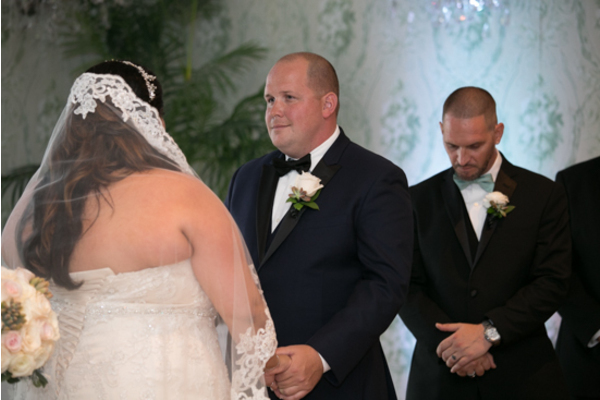 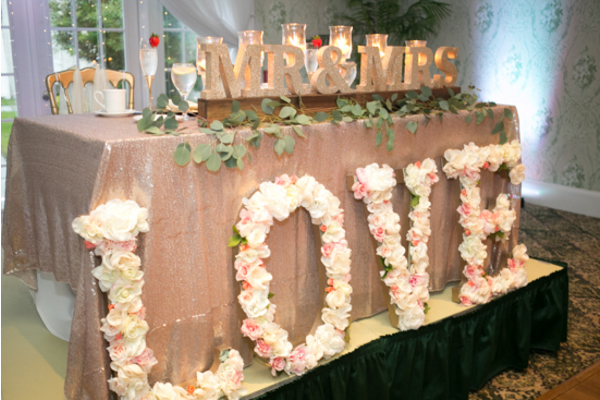 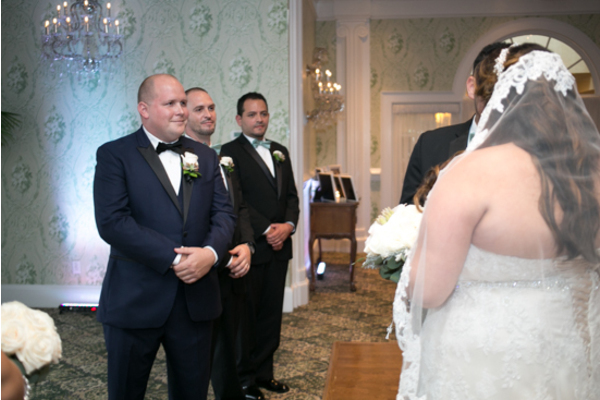 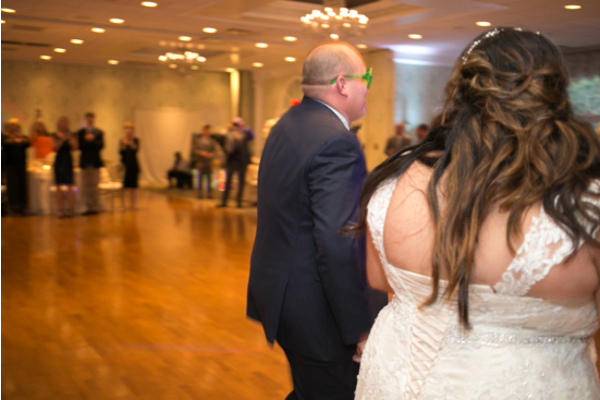 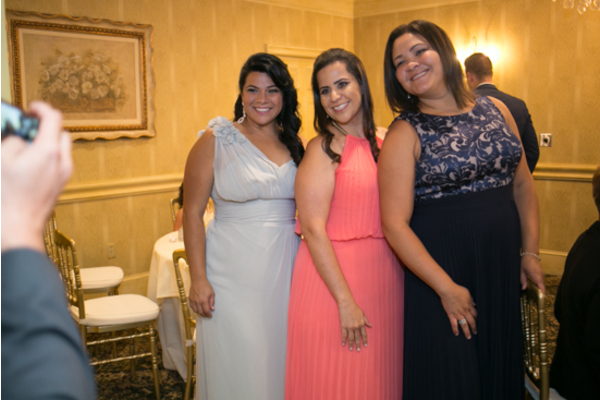 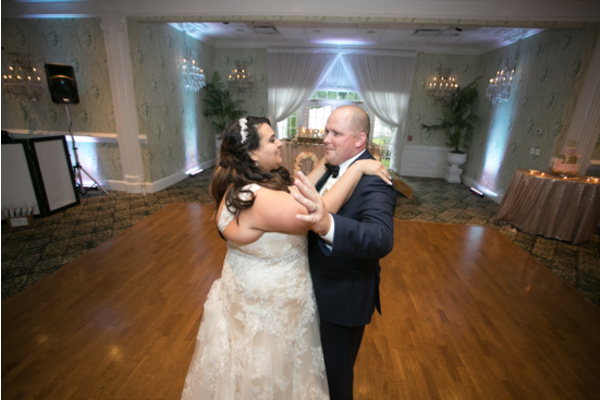 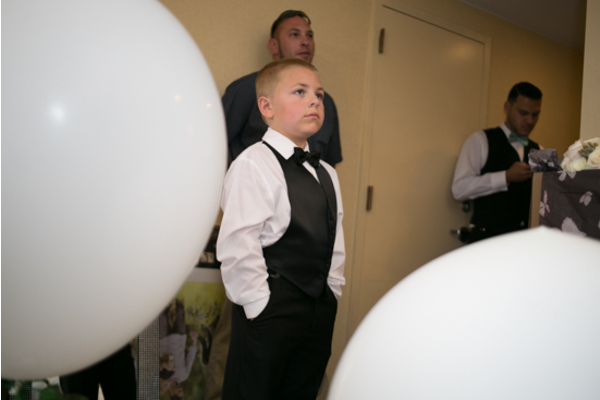 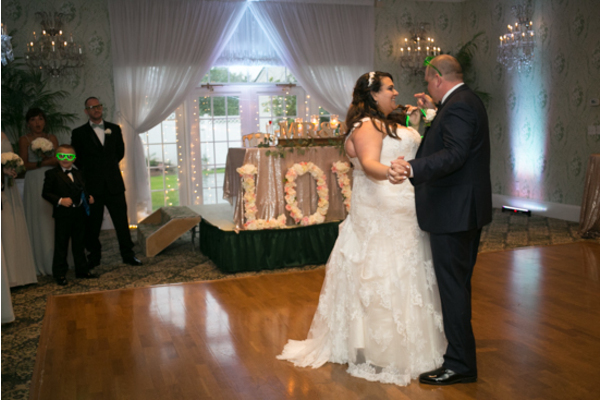 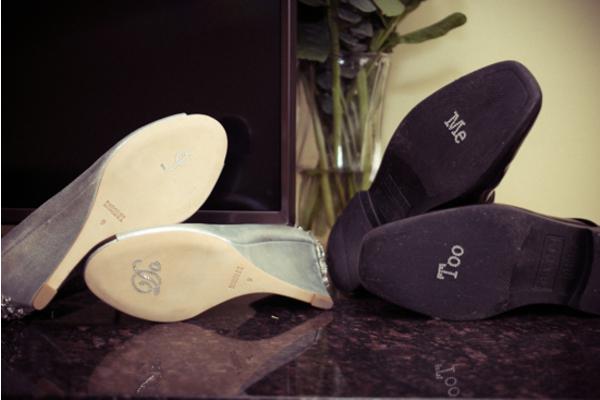 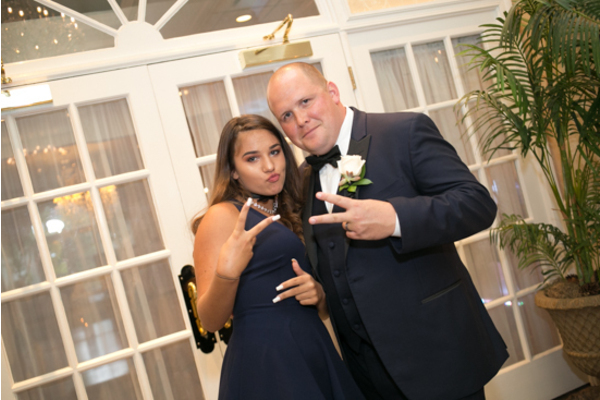 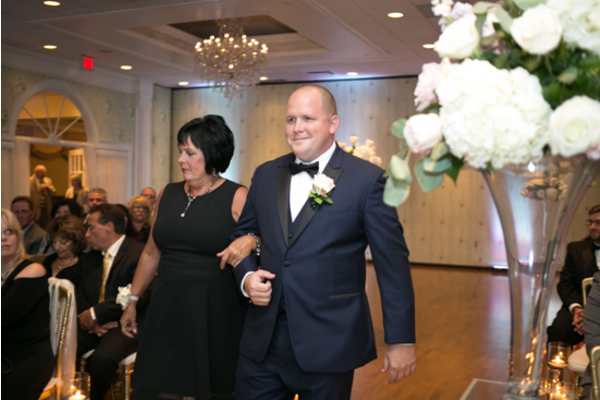 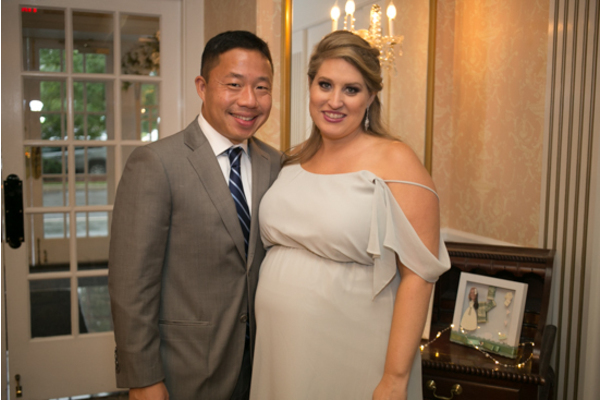 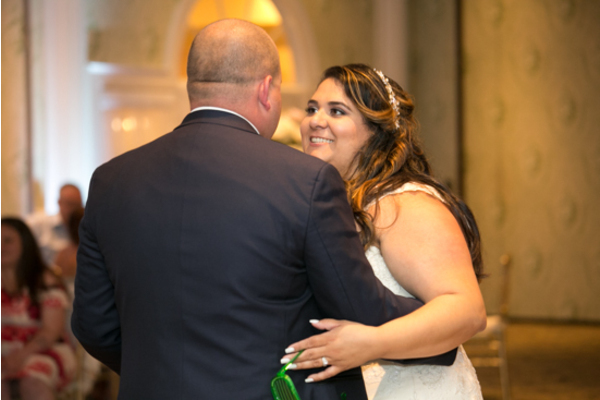 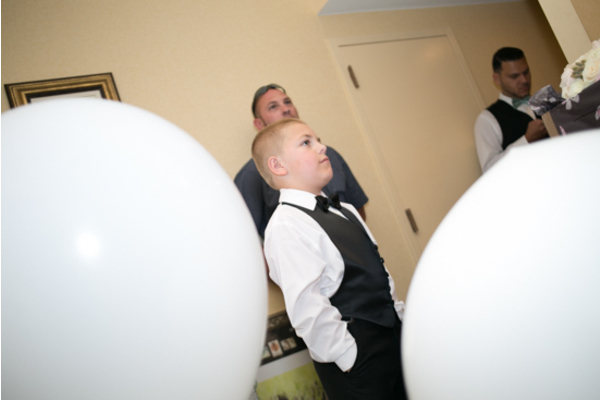 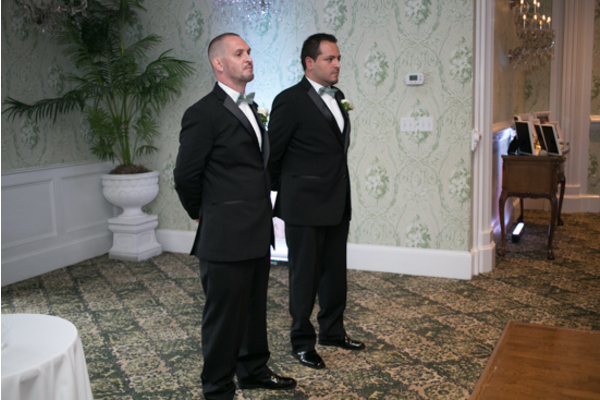 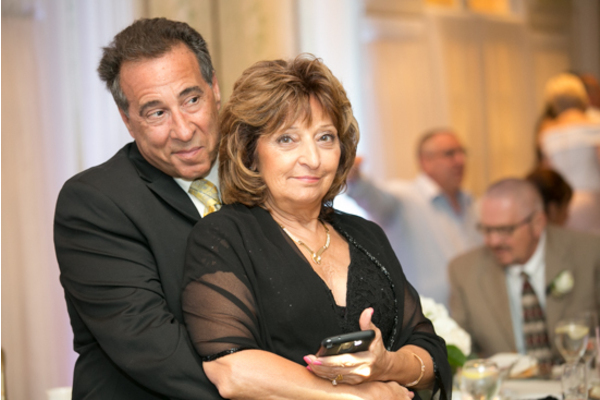 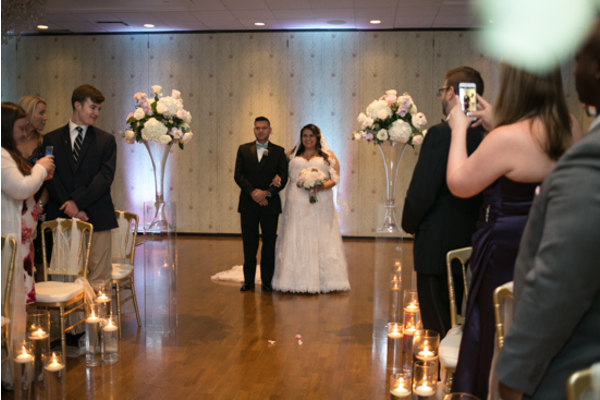 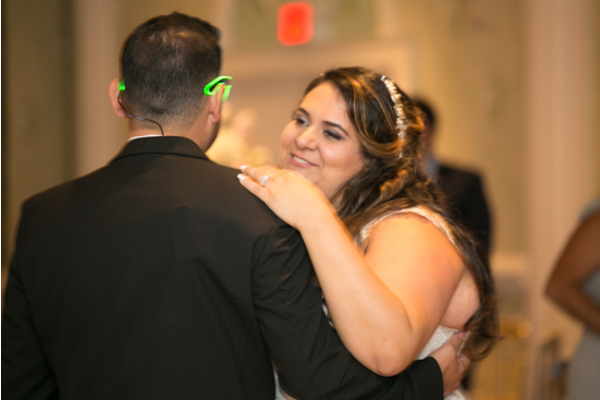 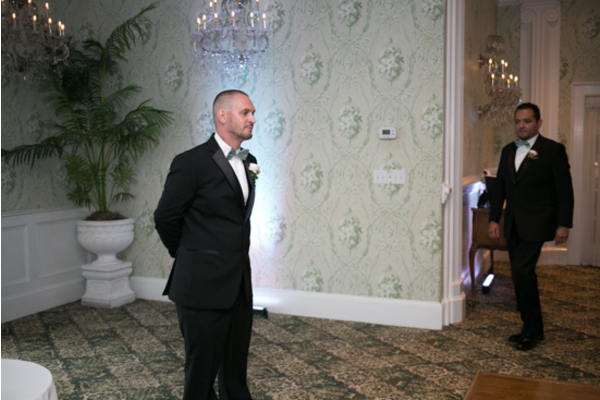 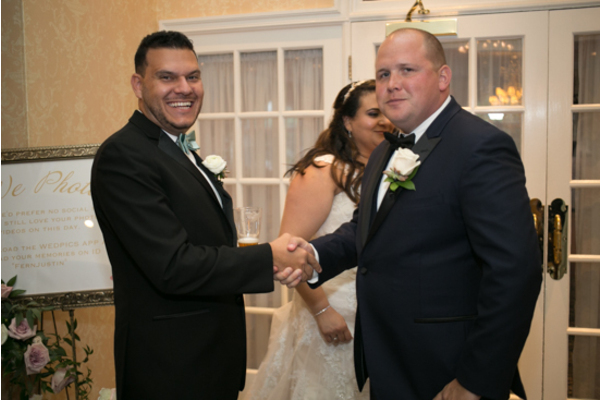 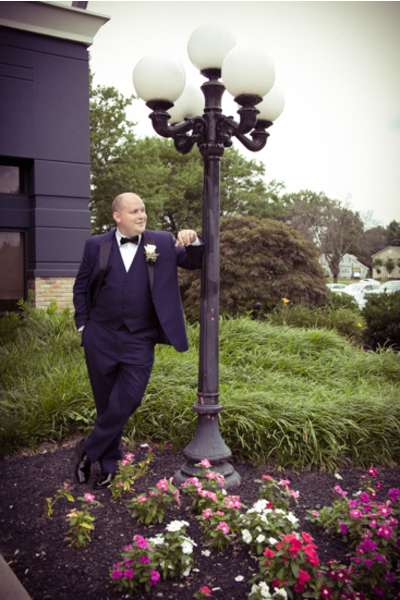 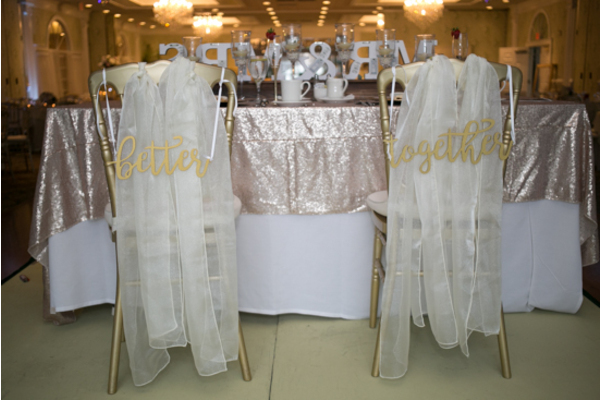 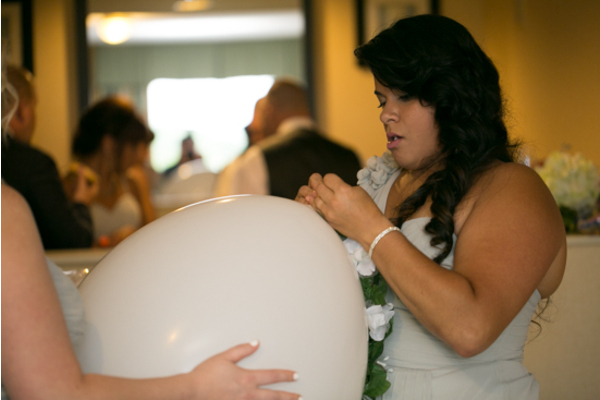 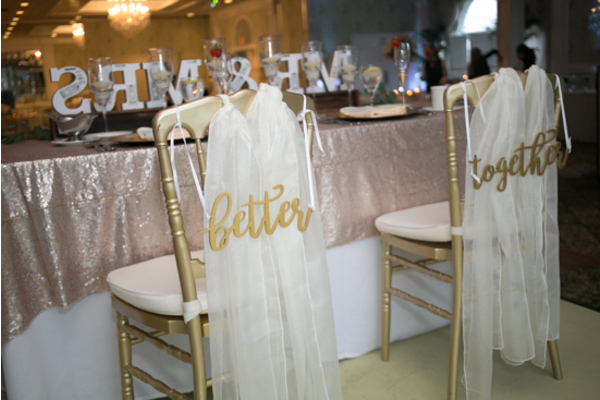 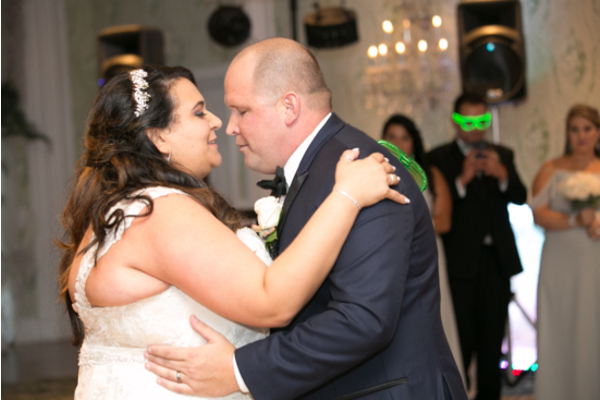 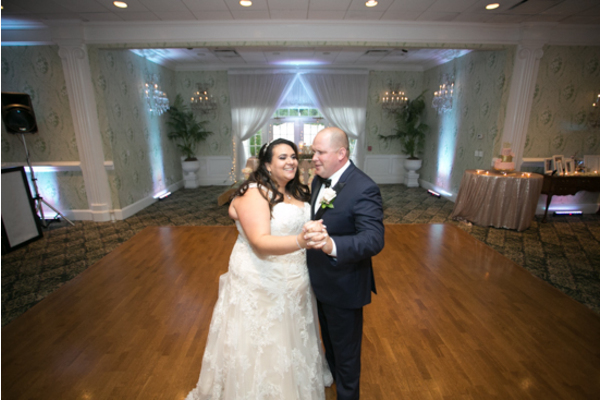 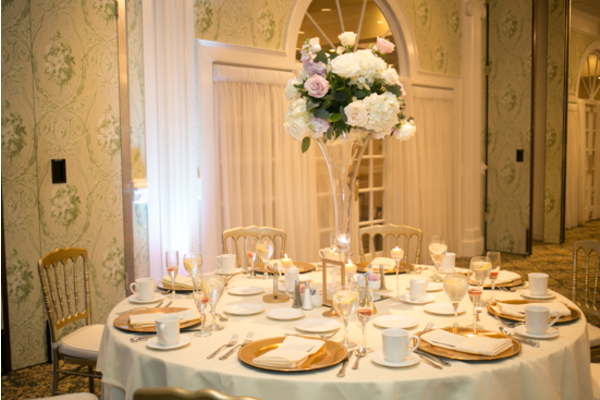 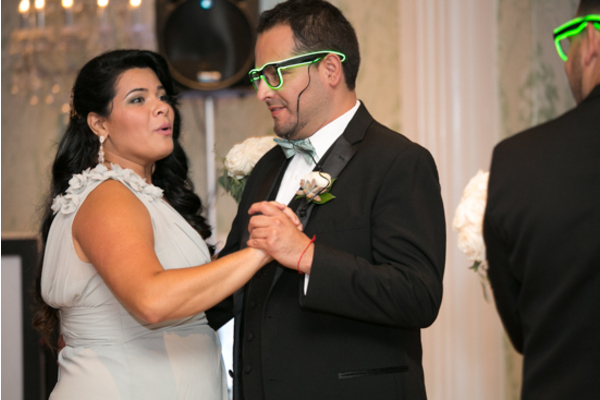 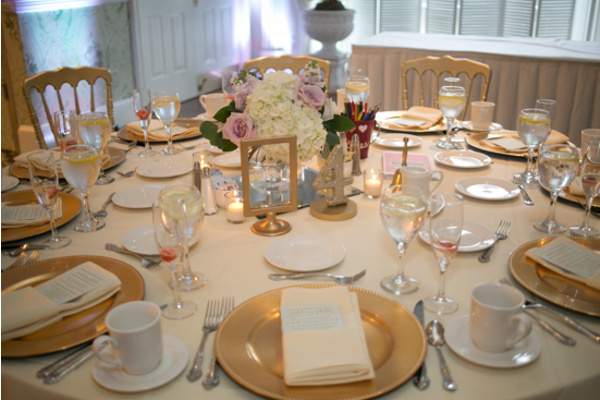 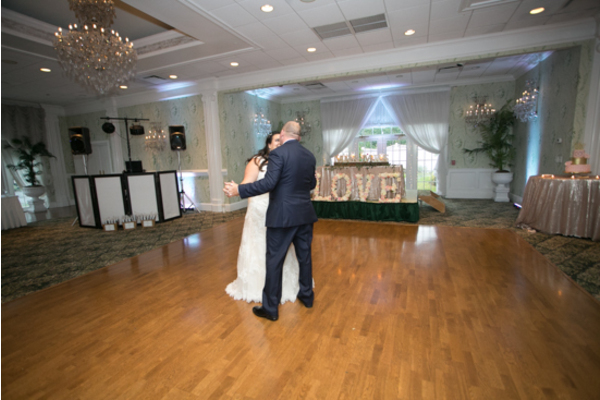 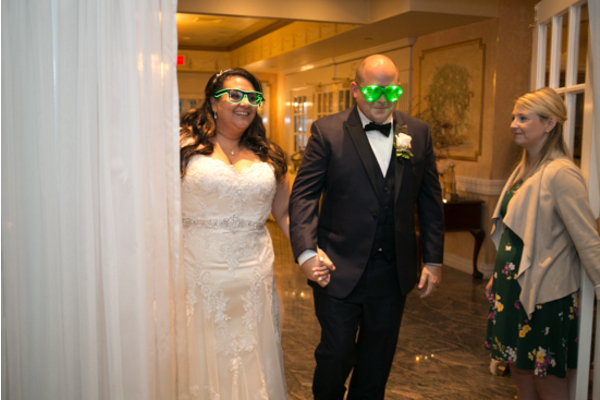 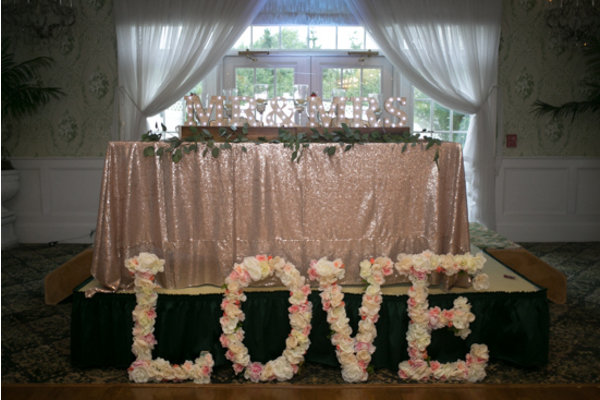 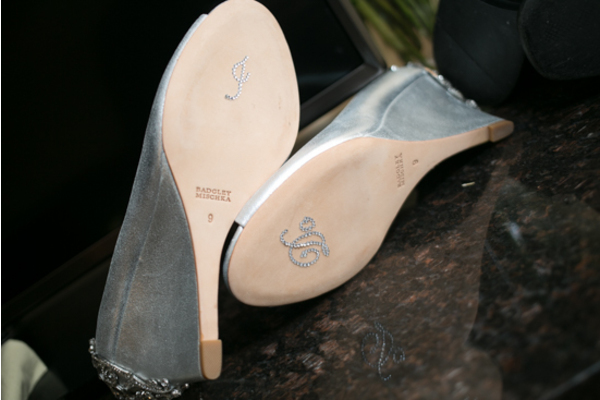 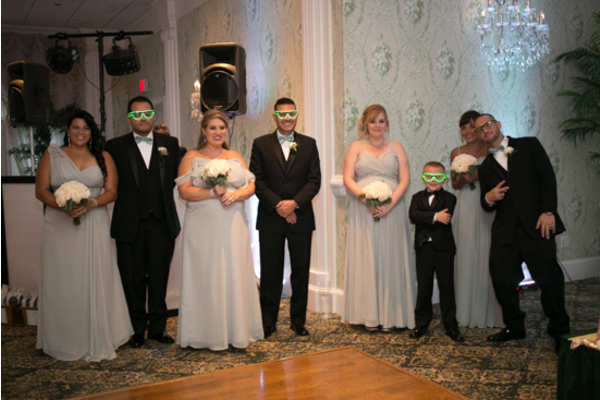 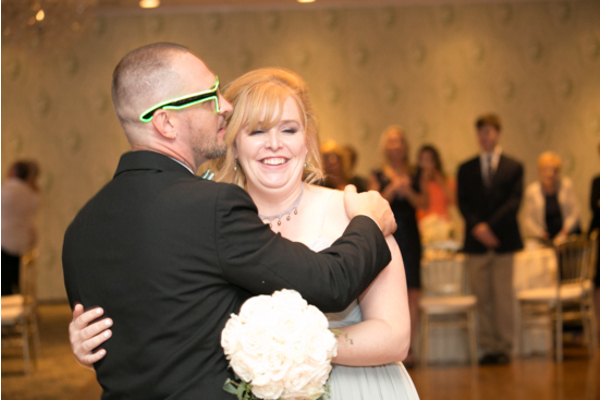 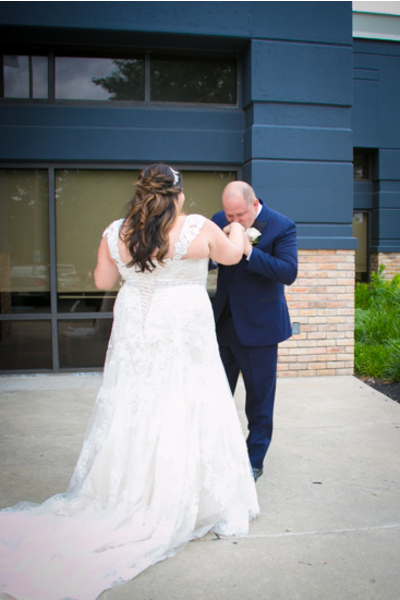 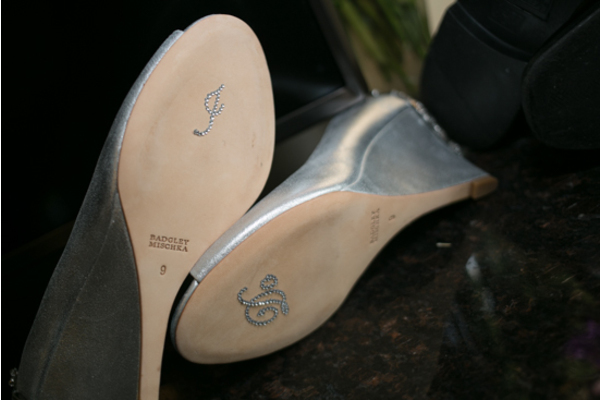 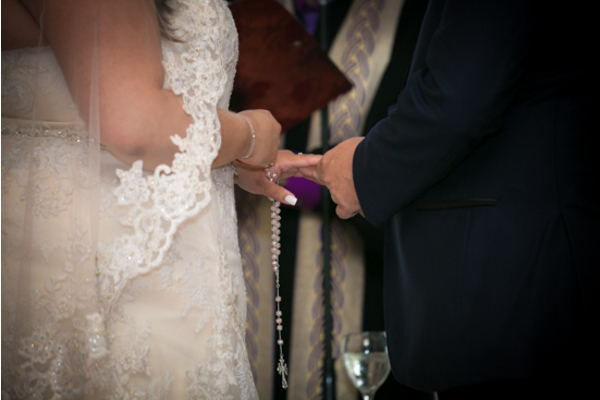 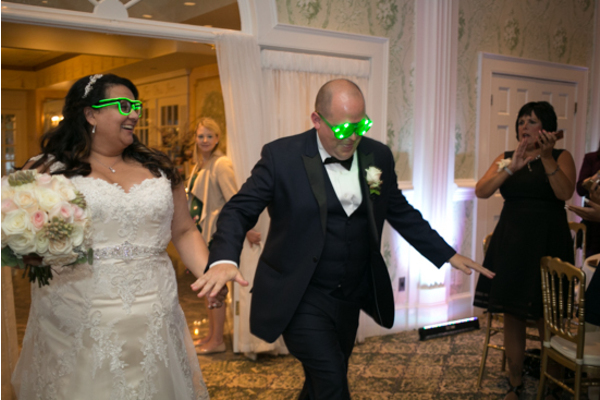 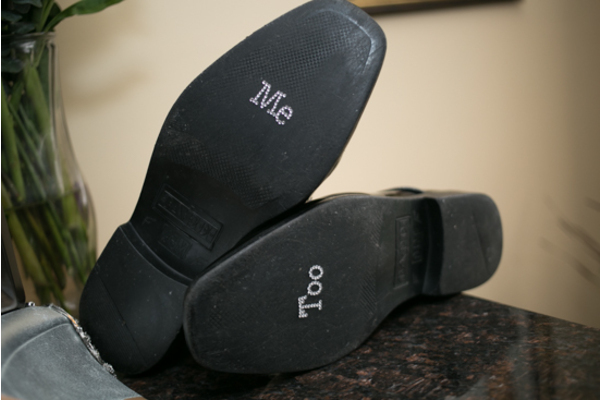 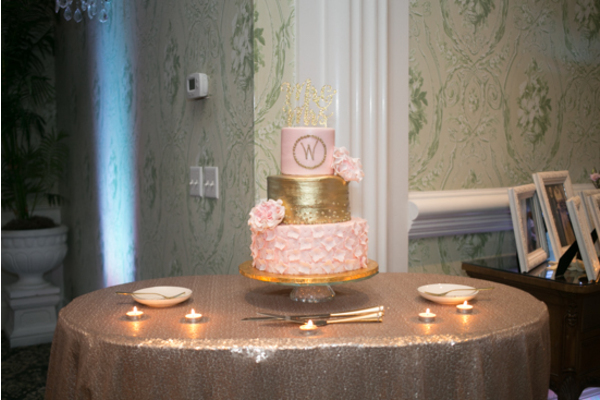 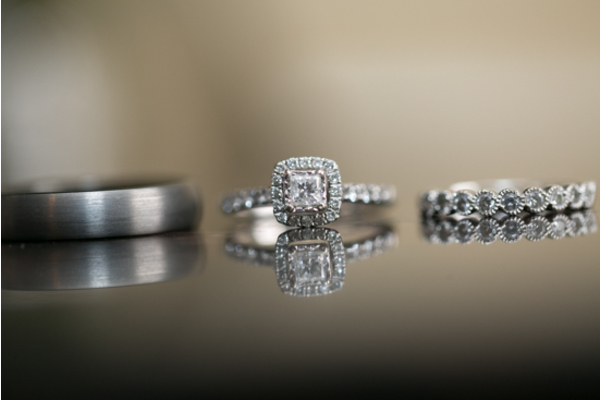 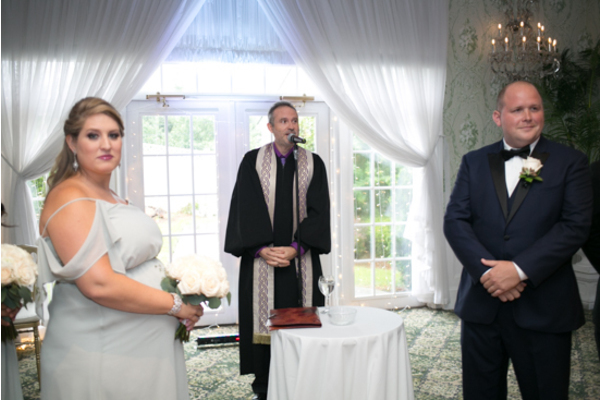 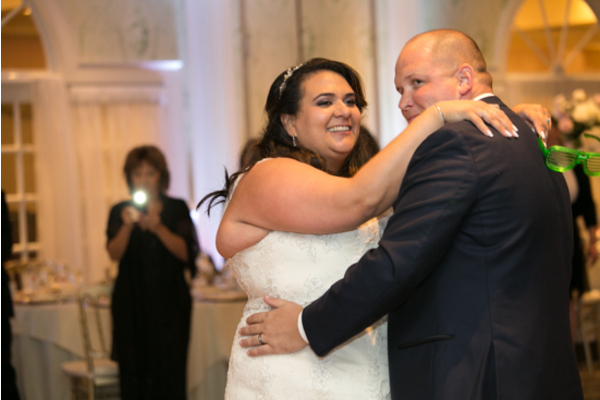 Our NJ Wedding DJ played upbeat music that kept guests on their feet all night long! 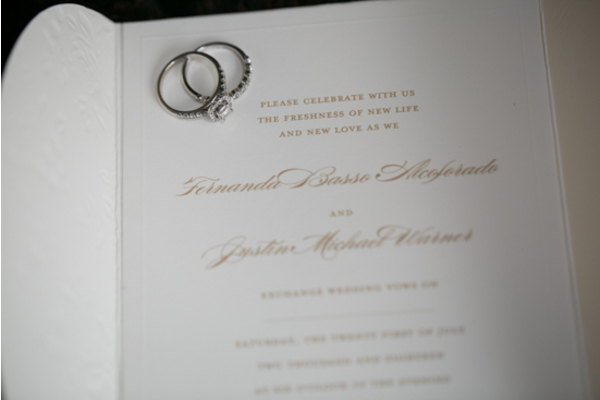 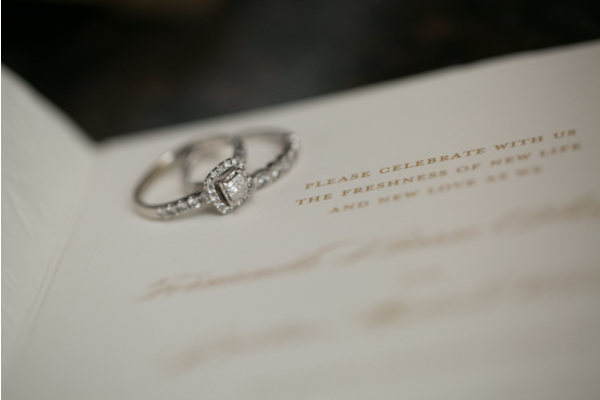 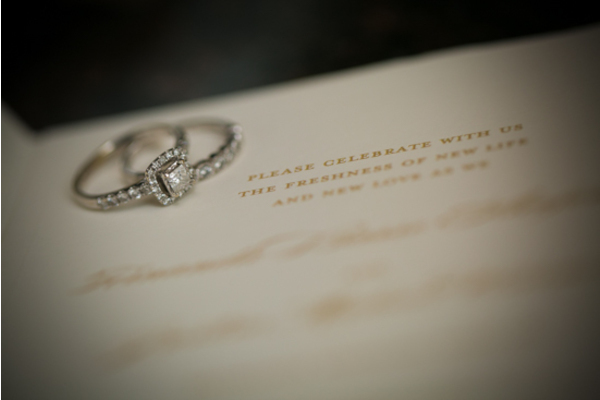 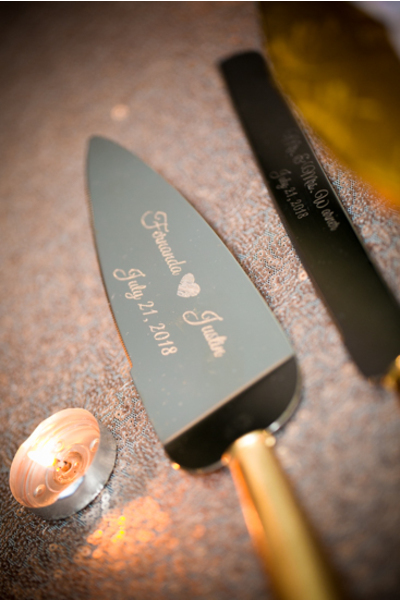 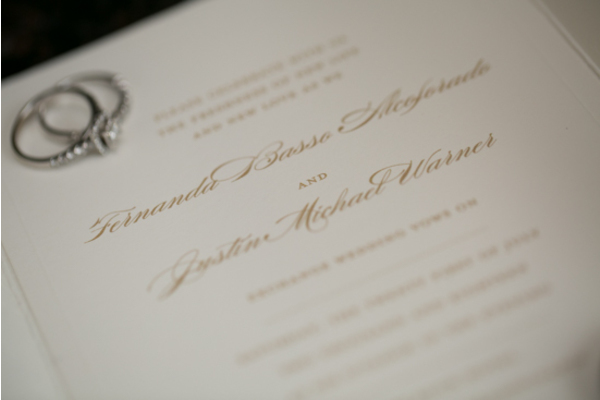 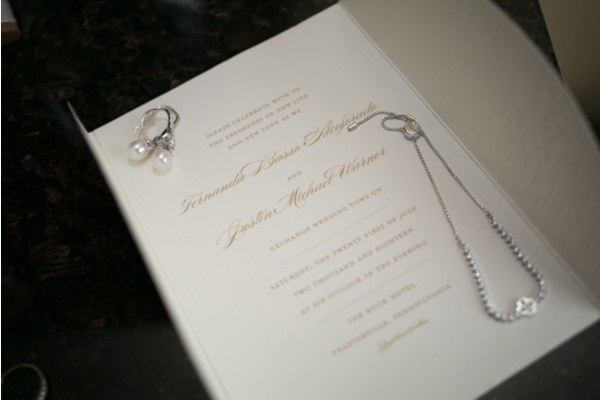 Congratulations, again, to Fernanda and Justin! 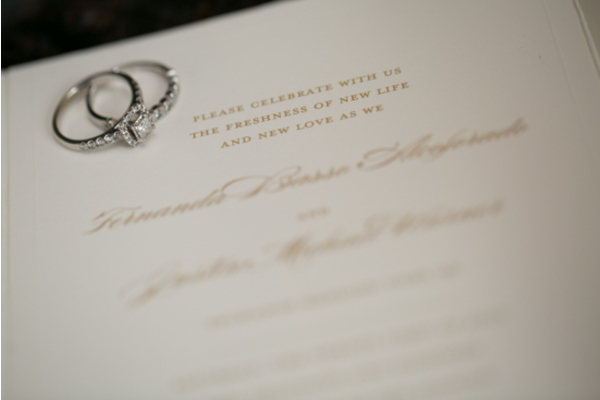 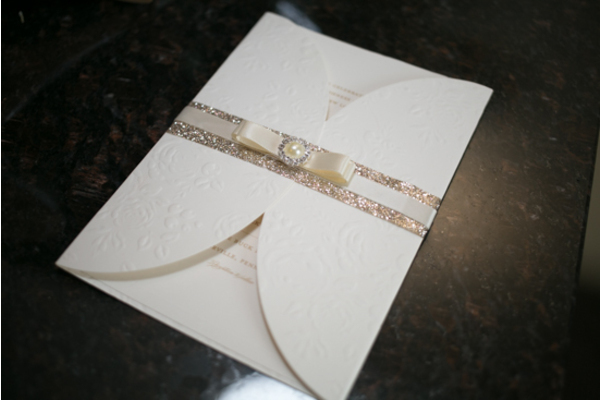 We wish you a lifetime of love and happiness!